Alright folks. This is going to be a fairly long post, so hold tight. 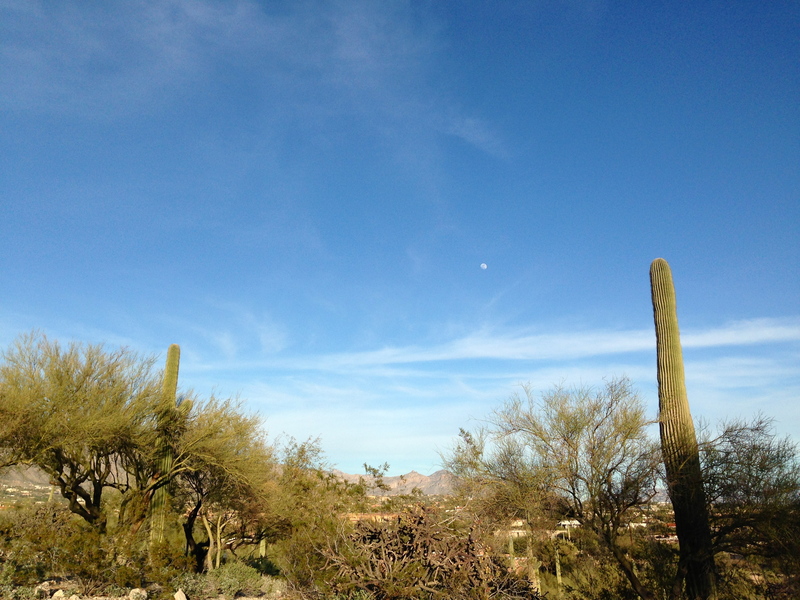 To give a brief summary, I’m sharing my experience and rock haul from the Tucson Gem Show this year. 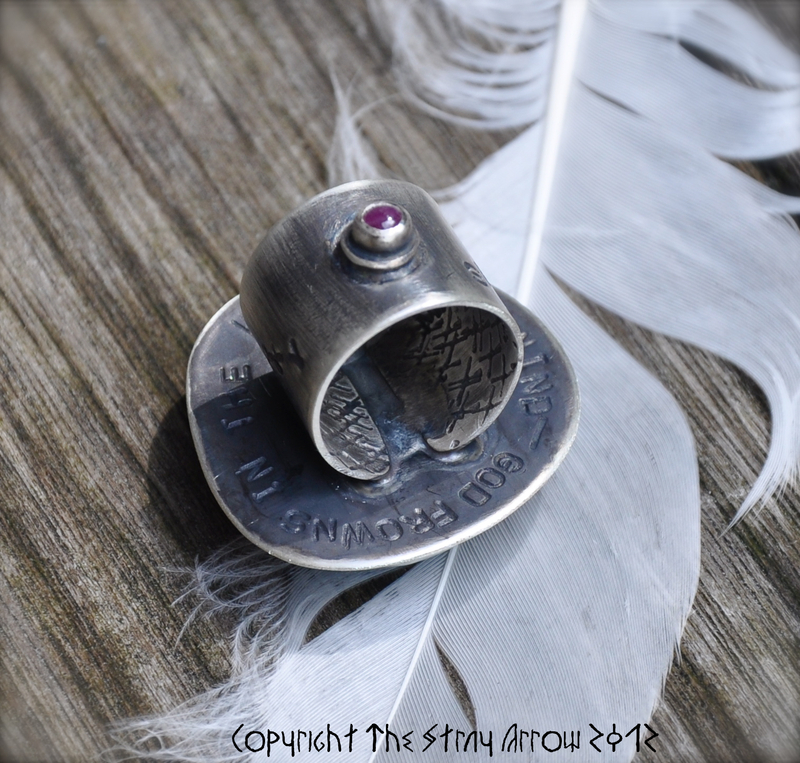 Anything marked N/A in the photo is not available for custom orders. 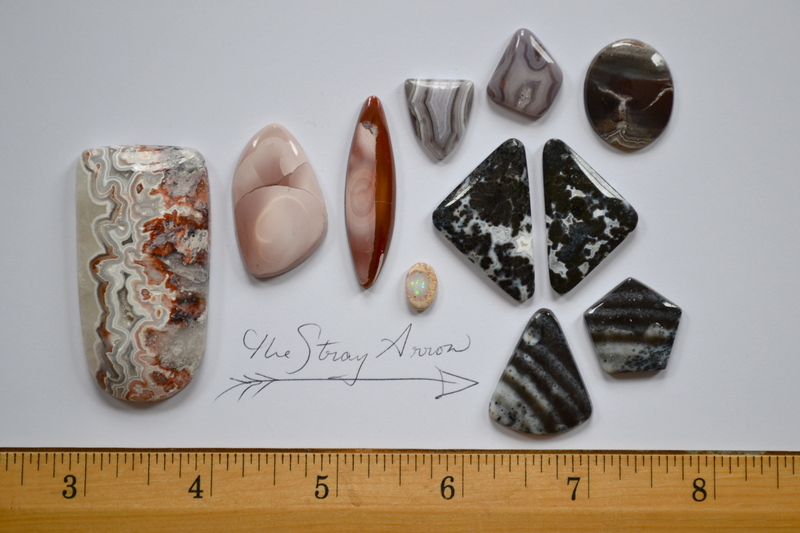 All other stones are up for grabs and will ONLY be fully reserved once you nail a design down with me and a deposit for said design has been paid. Please be aware that unless you’ve sealed a piece with me, I may be showing the same stones to others. I swear these are the weirdest, coolest things. 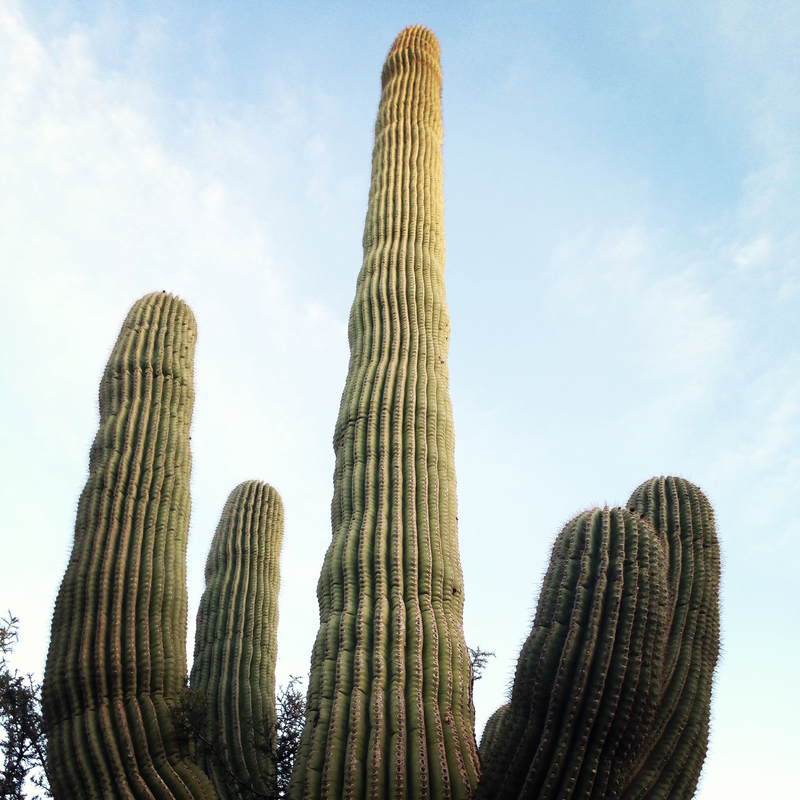 I got so many, “Uhm how many photos of cacti is this girl going to take?? ?” stares. I don’t even care. Oh yeah. There was also the huge gem show all over the city, that was cool too. ^Broken Arrow mine variscite. natural. straight from the mine owner. 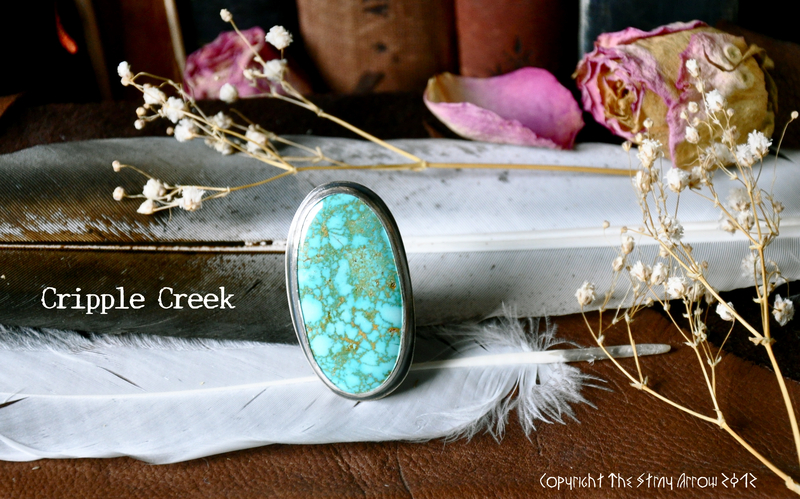 ^Burtis Claim Cripple Creek mine turquoise. natural. 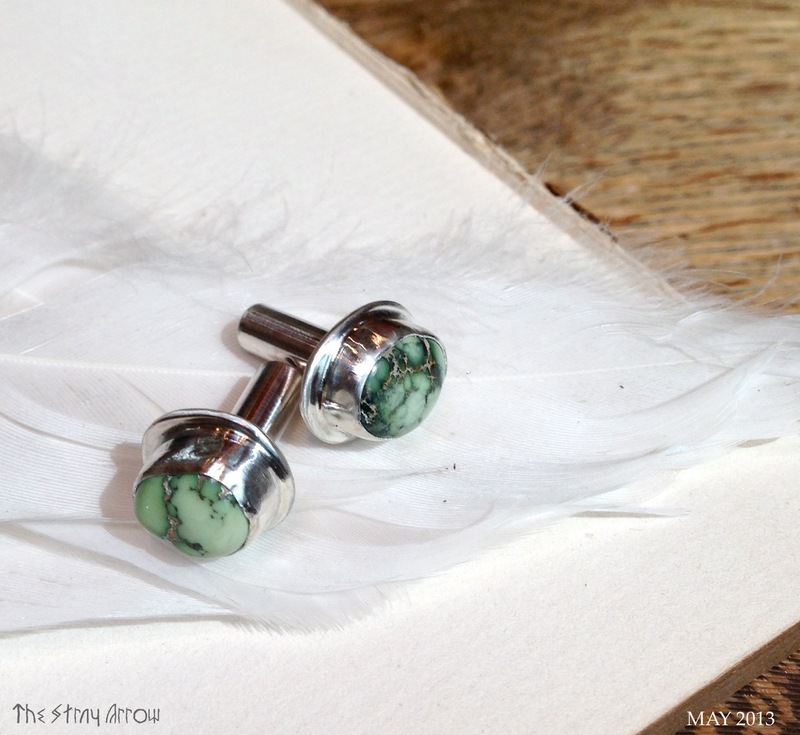 ^Royston turquoise and Royston ribbon cut turquoise. natural. 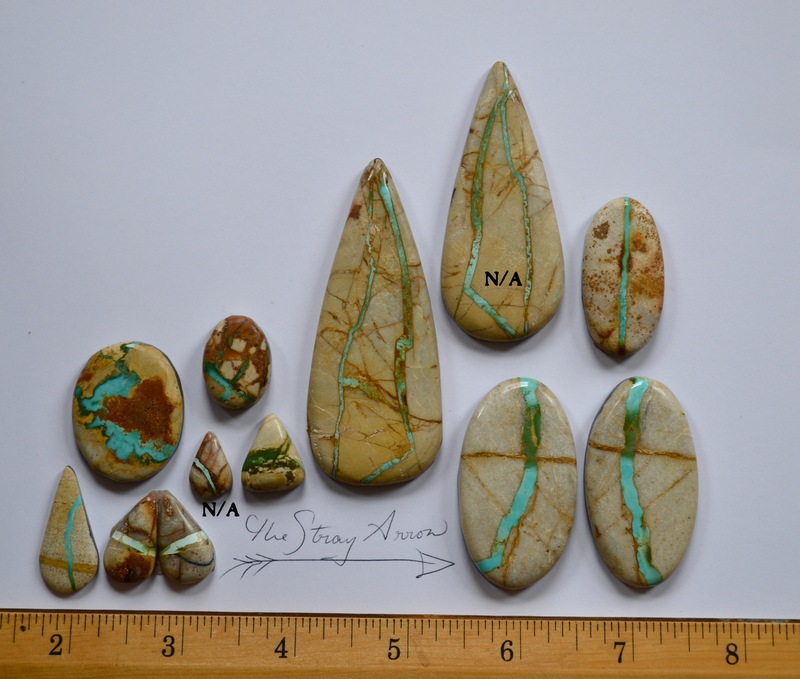 ^White Buffalo turquoise. natural. Straight from the mine owner. 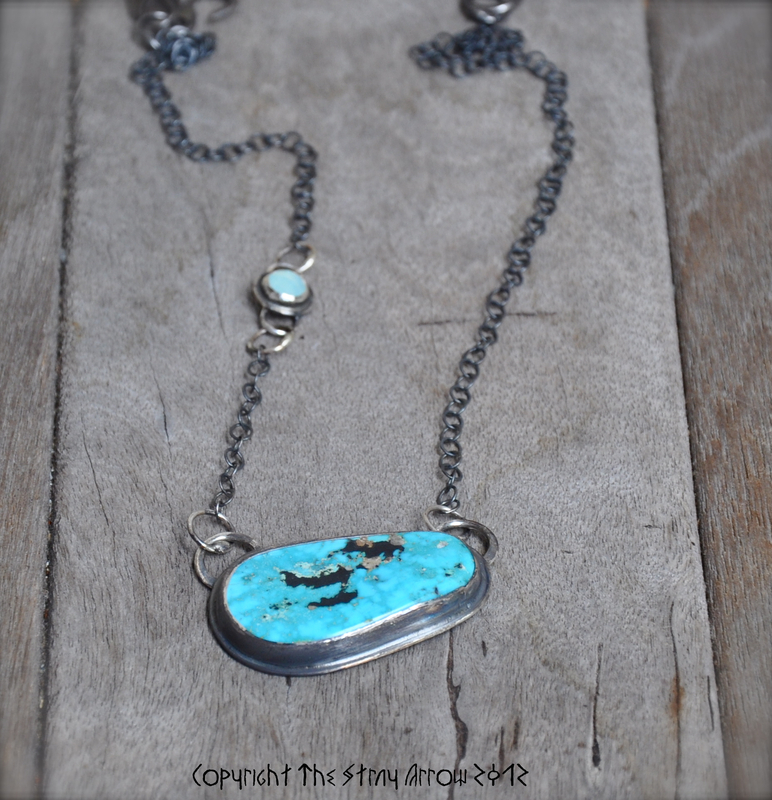 ^Blue Moon mine turquoise. natural. ^Royston ribbon cut turquoise. natural. ^ left to right: New Lander mine, Peacock mine, Carico Lake mine, Number 8 mine (!!! truly! ), Damele mine. ^the amazingly tight webbing in this one is hard to photograph. 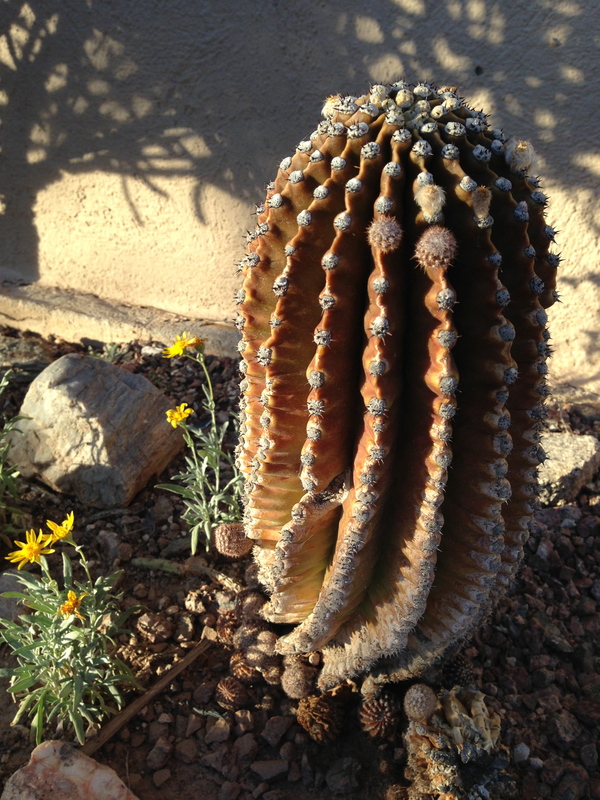 ^this one has a very high dome. 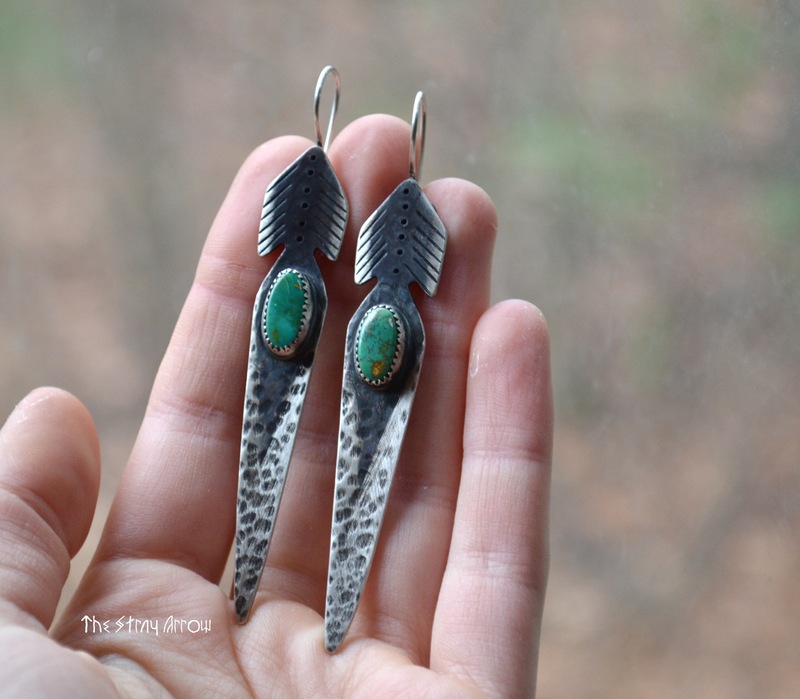 ^ Sleeping Beauty mine turquoise. natural. 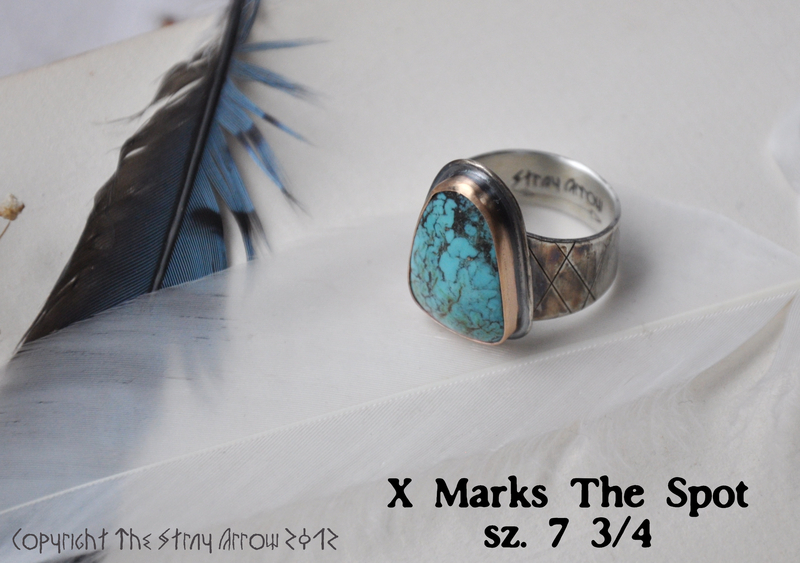 ^Fox // Cortez mine turquoise. natural. 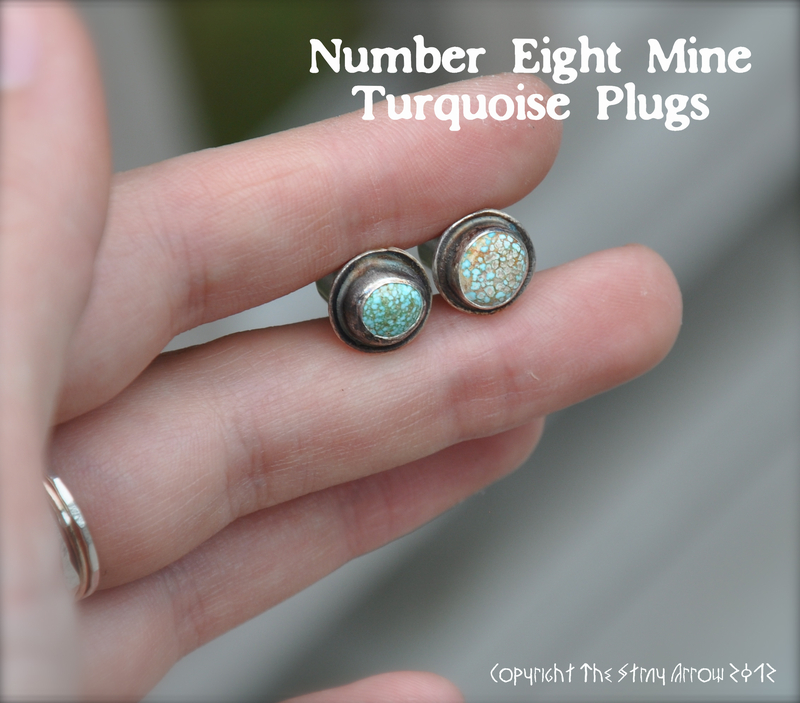 ^old stock Number 8 mine turquoise. natural. 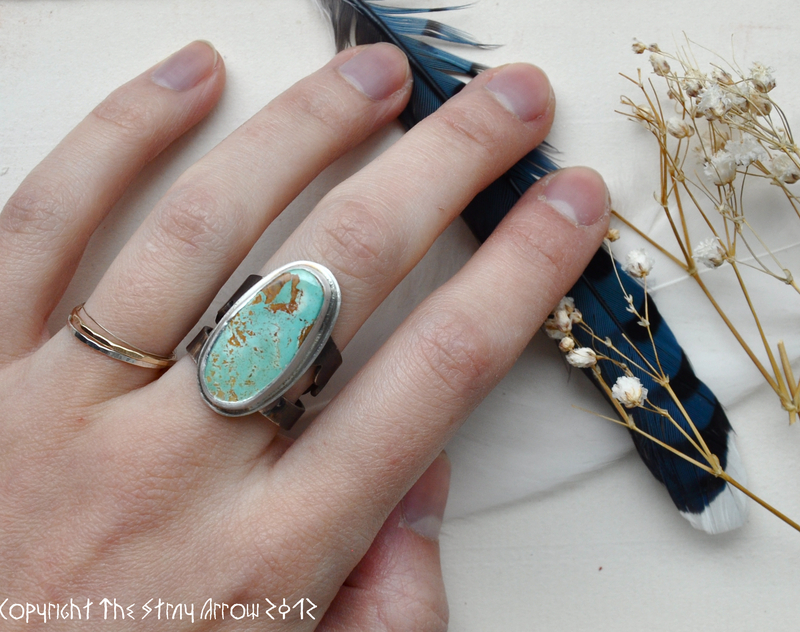 ^Royston turquoise. natural. Along with some strays. 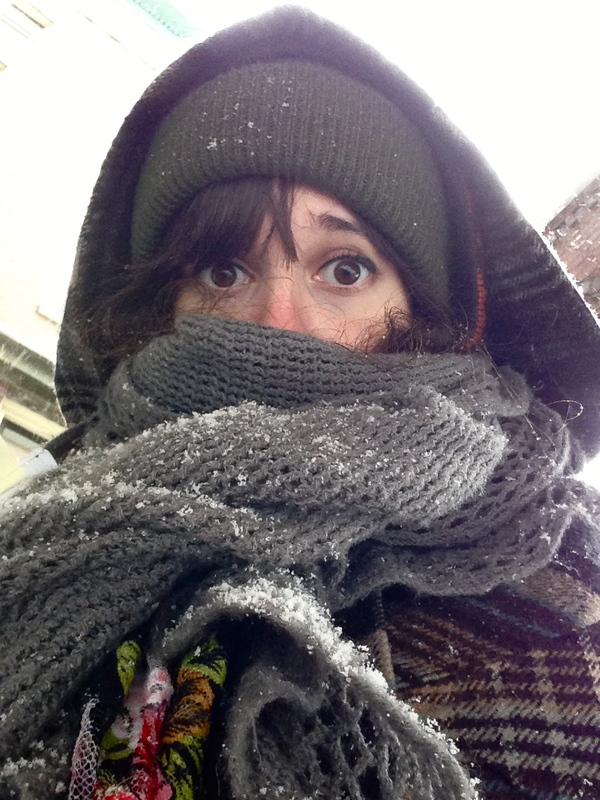 Then I returned home to a series of snow storms. Fantastic. 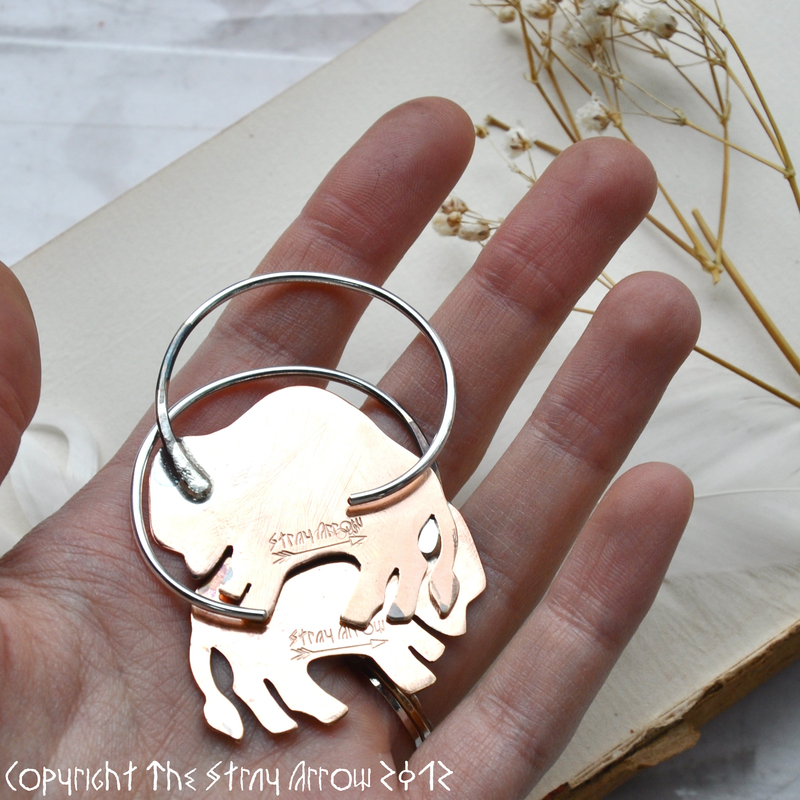 Keep a look out as I’ll be posting NEW ITEMS to preview here on the blog this coming Sunday before they hit the shops! in honour of there being too much snow here and wanting to empty the shelves in the shop a bit for new items! 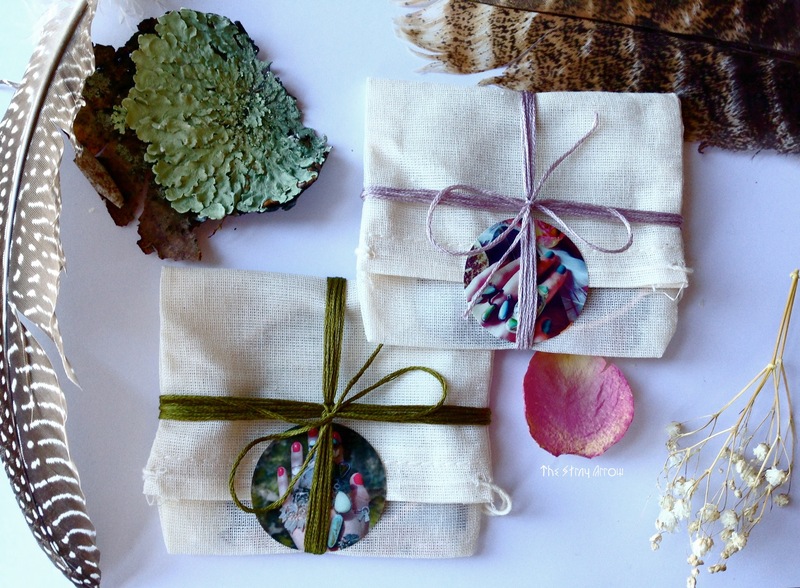 Sale does not apply to custom orders, minimum purchase of $25 required to apply. 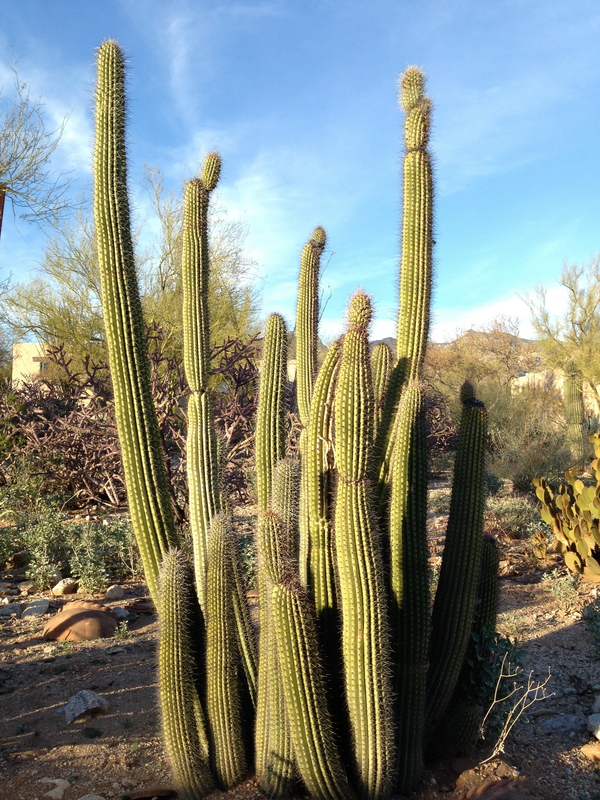 In the meantime, if you aren’t in a sunny land, stay warm and bundle up! No. This isn’t a post about rocks. There will be one down the line, but not today! I hope everyone has had a lovely Holiday Season, whichever you choose to celebrate! 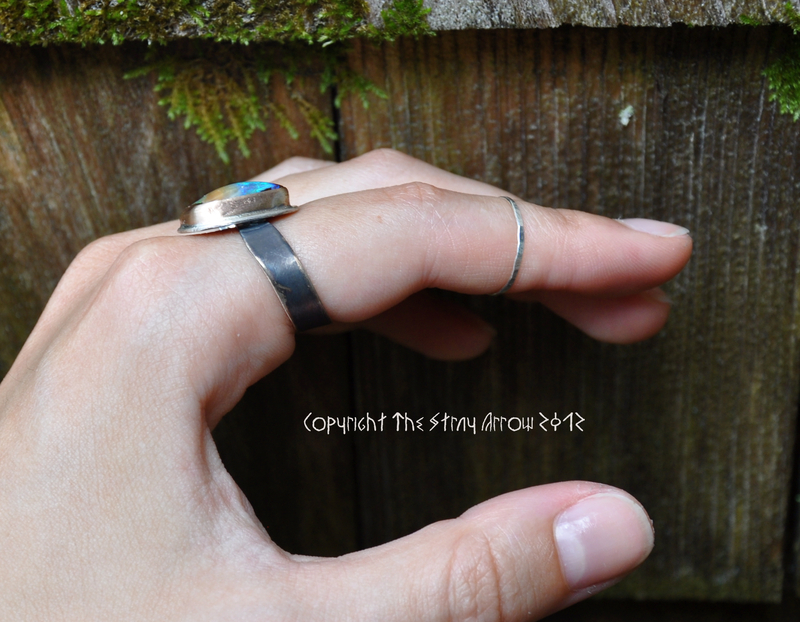 NEW ITEMS will be hitting the shop throughout tomorrow, including two Chained in Turquoise rings, and two unique stacking ring types. 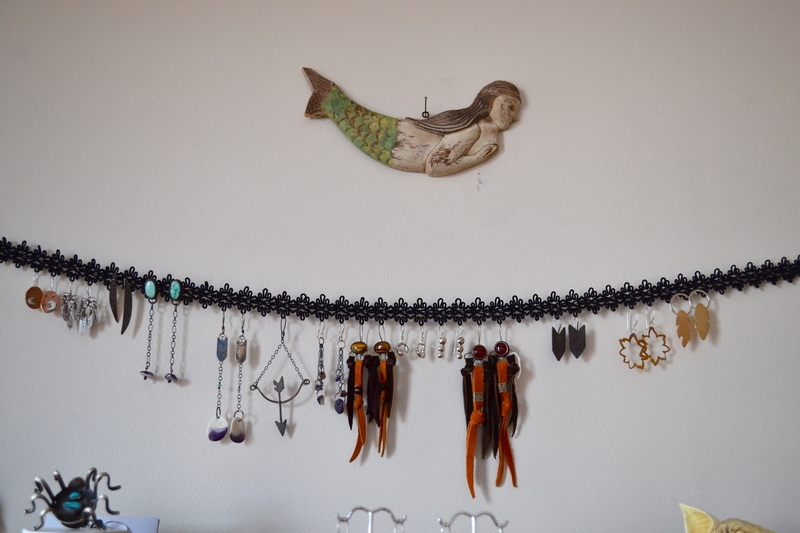 Things are now settled, it’s time to share the new place and new jewels! 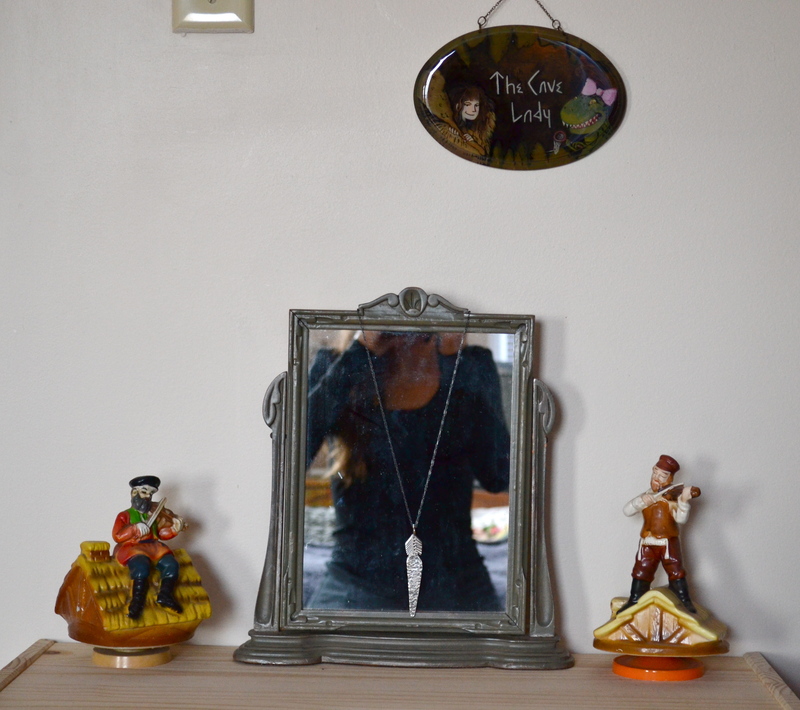 ^Russian music boxes that each play a different theme from “Fiddler on The Roof”, antique mirror with Stray Arrow Featherblade necklace, and my favourite designated CAVE LADY plaque. 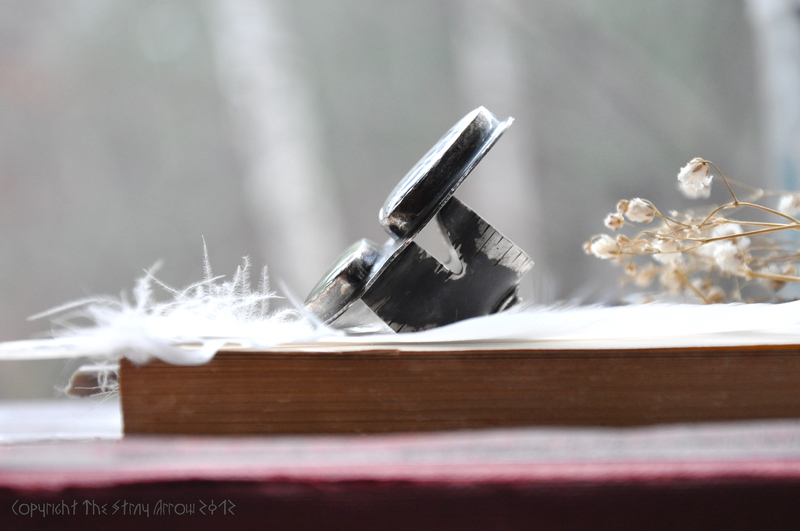 The music boxes represent an old memory from one of my grandmothers. The plaque was made for me by the dear Tory of ToryNova, featuring me in true Cave fashion on the left, and her in true T-REX fashion on the right. 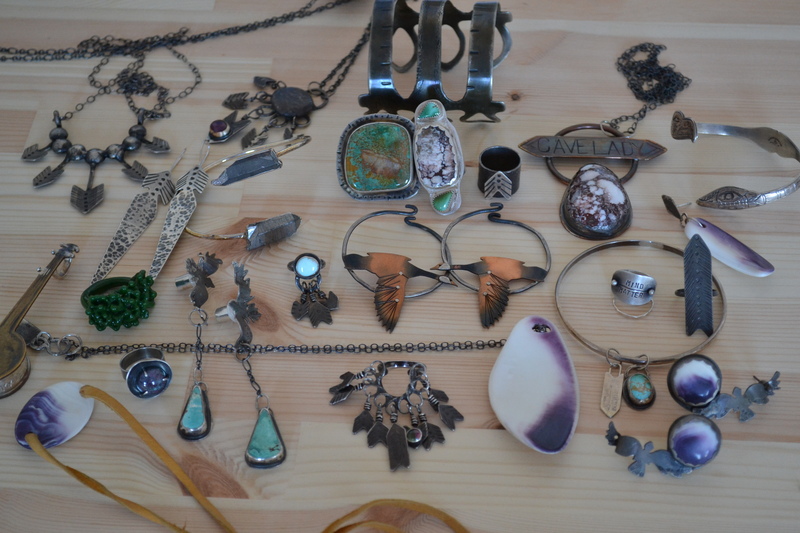 ^ My favourite old TURQUOISE TREASURE CHEST. 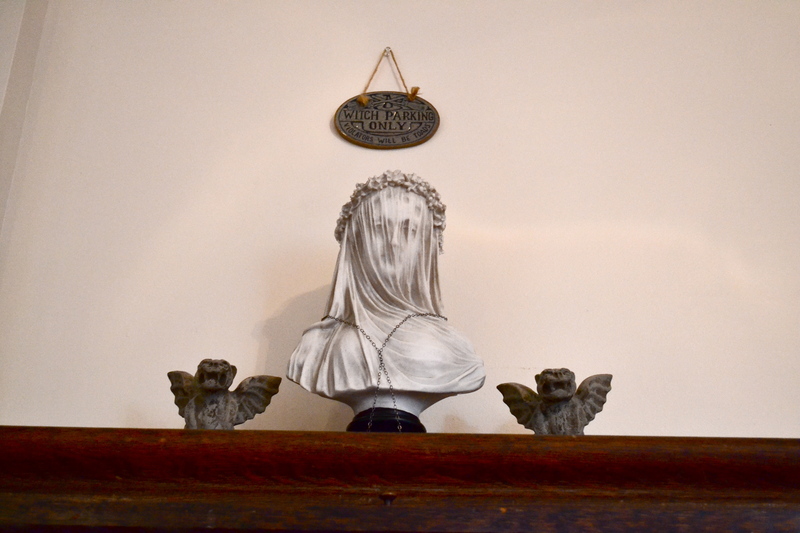 I scored this favoured piece at an antique & flea market. 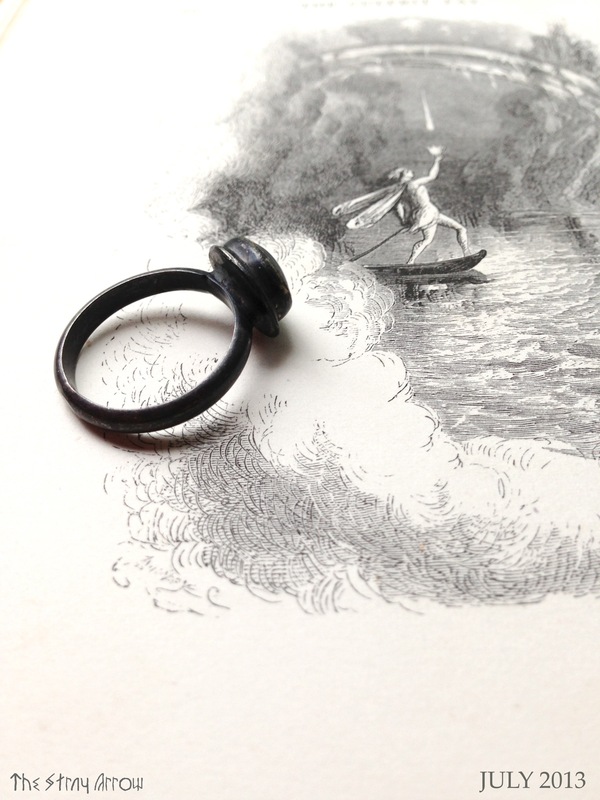 The Marines illustrated fold out piece was acquired along the St. Martin Canal, Paris. 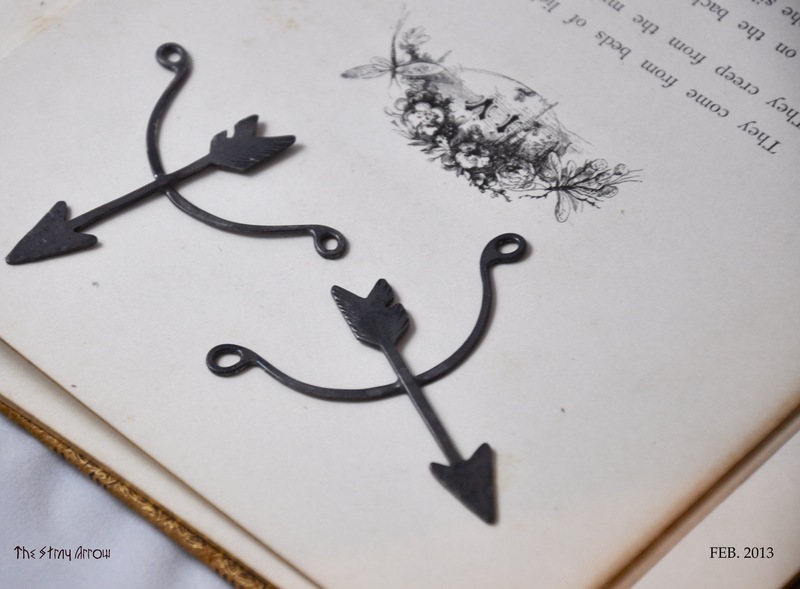 ^ Three different Arrow Vane sizes. Painting of Muninn with oils, cold wax, and fire ashes. 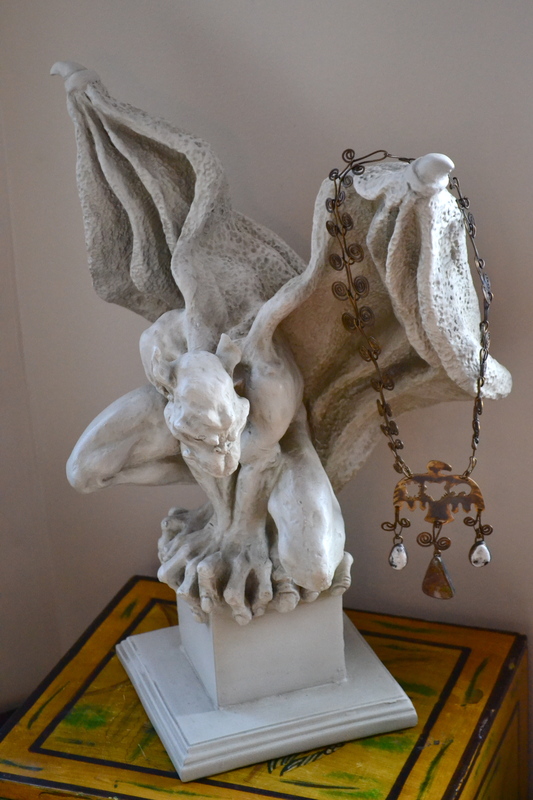 ^ My gargoyle Askewheteau (“He who keeps watch”). 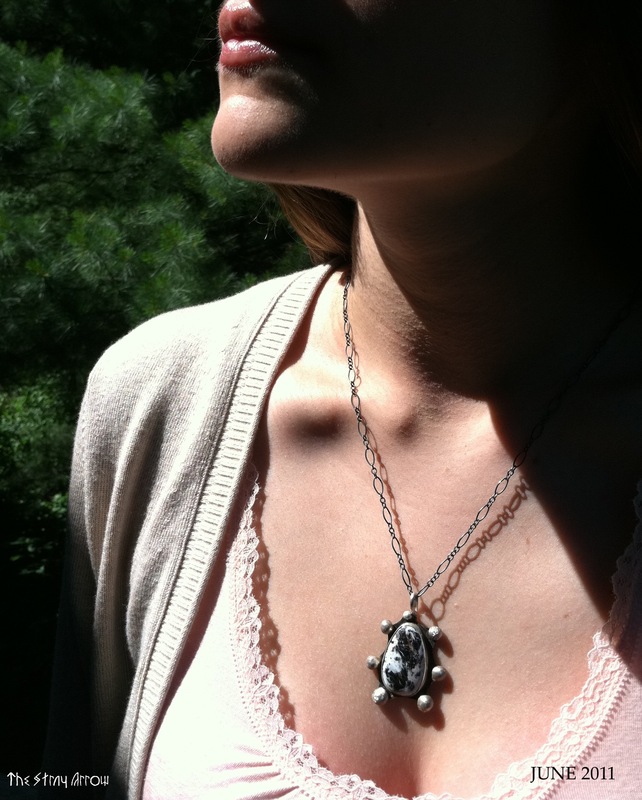 Dangling from him is one of the first finished necklaces I made 4-5 years ago. 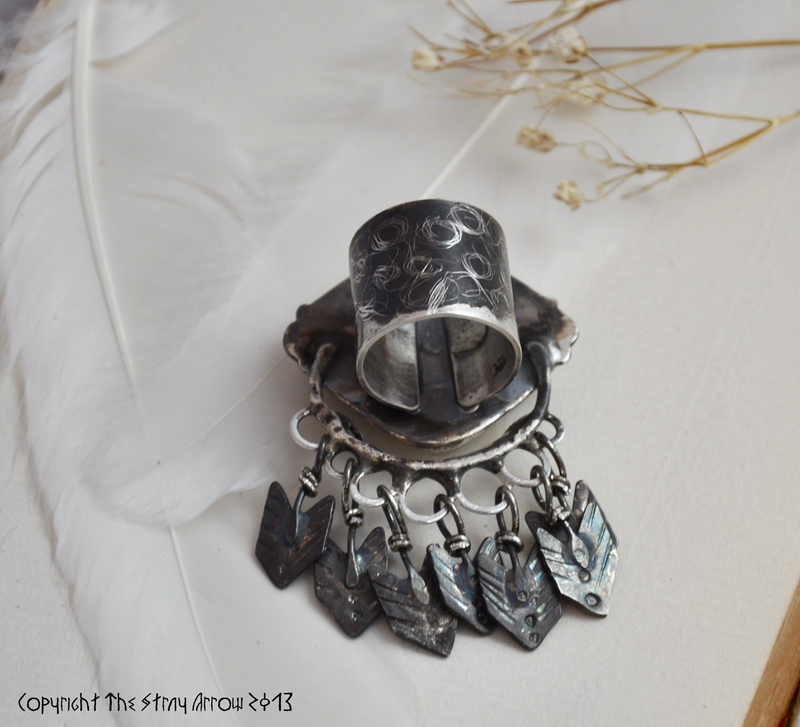 The necklace was an “East meets West” theme featuring a Southwestern Thunderbird and the three clans from the Kanienkehaka (turtle, wolf, bear). 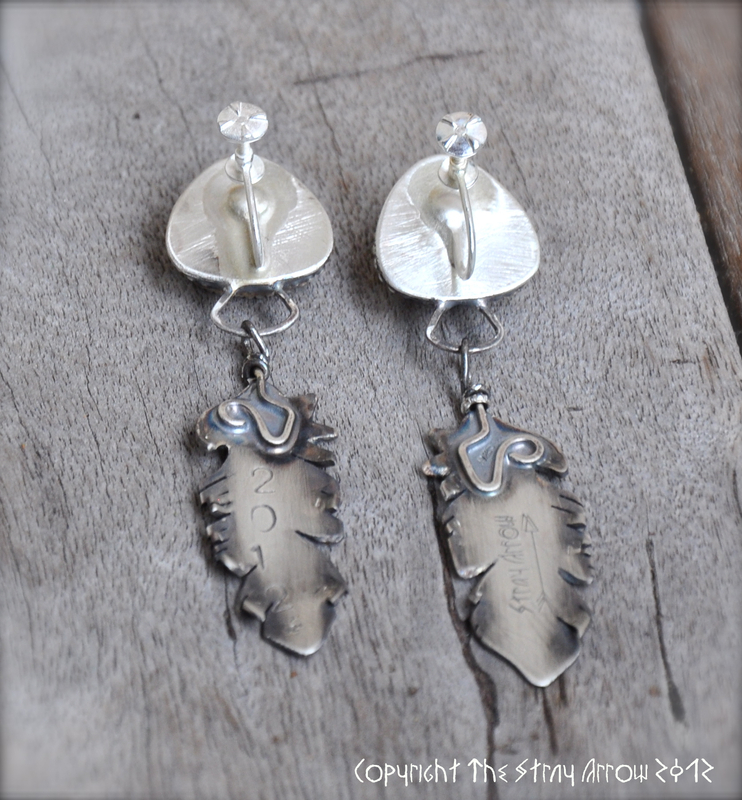 Dangling stones are white buffalo turquoise and Crow Springs mine turquoise. That’s it folks! Thanks for keeping up and supporting my work. As always, there’s more to come! Well after spending several hours cropping photos and finishing new items last night, I did something I haven’t done since college. I LITERALLY fell asleep on my computer. Sorry all! 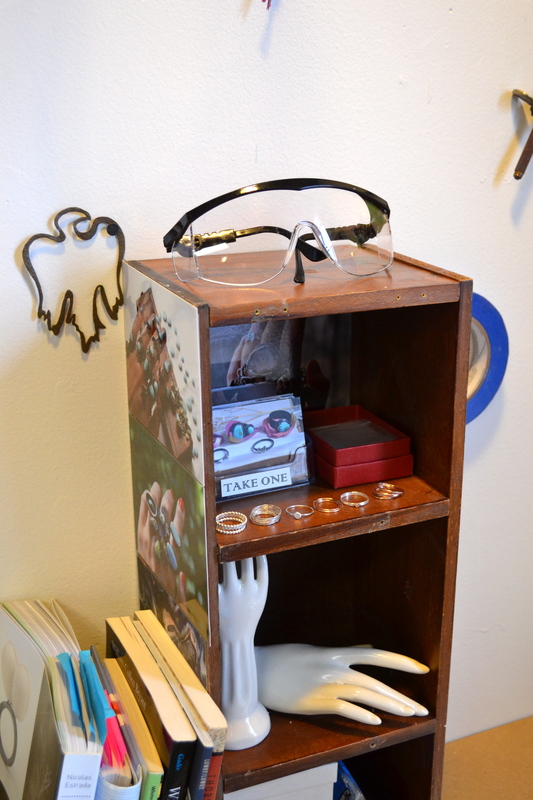 Many jewelers, shop owners…business folks in general…never really talk about the inside details. I’m going to do a little sharing, so I’m sorry if this bit is boring! Photography wise, I use a simple SLR that I focus, point, and shoot. It’s all natural daylight. No tripod, no lighting, none of the fancy stuff. Unfortunately in these winter months, the sun yields a blue tinged light here in New England to everything no matter the time of day. I feel completely frustrated when trying to shoot work, even trying to keep it in focus with this old busted camera seems tough. SO. I have officially bought some more legitimate equipment to shoot in…and by legitimate, I mean real little lamps with daylight bulbs. 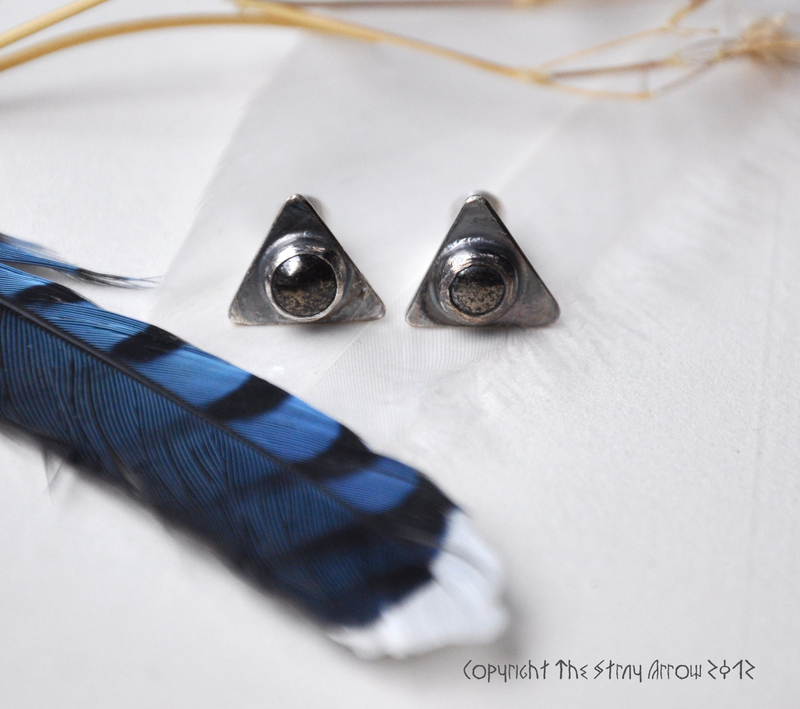 Hopefully I’ll be reshooting *most* of my items with this to better represent the jewelry. The daylight bulbs allow me to shoot anytime, which also adds appeal. In addition I’ll be considering a new camera a few months down the line. Digital is a whole new world to me, and I’m pretty shameless about that. 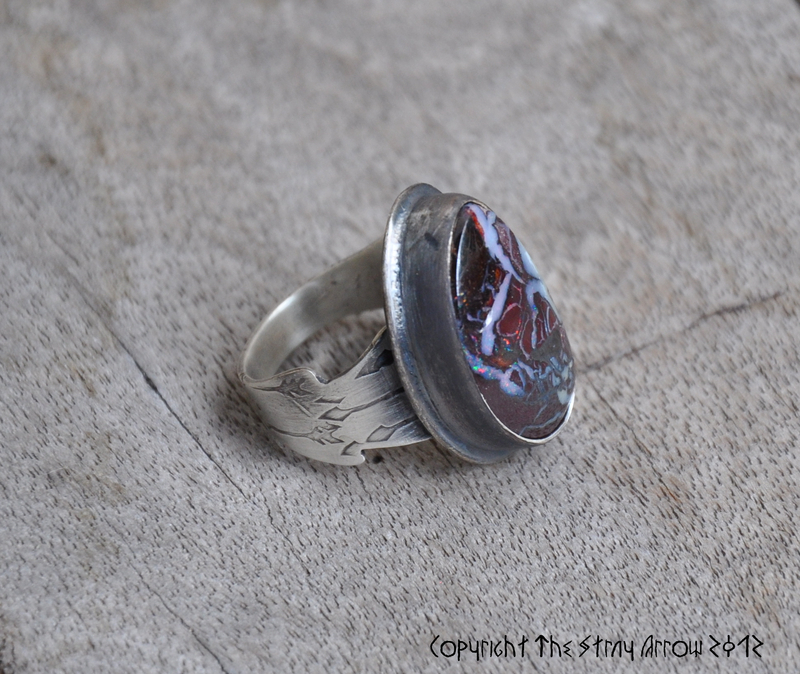 Up until needing a camera to shoot my jewelry I just used a 35mm manual Pentax in a darkroom. In summation, any good SLR camera any of y’all could recommend would be helpful! 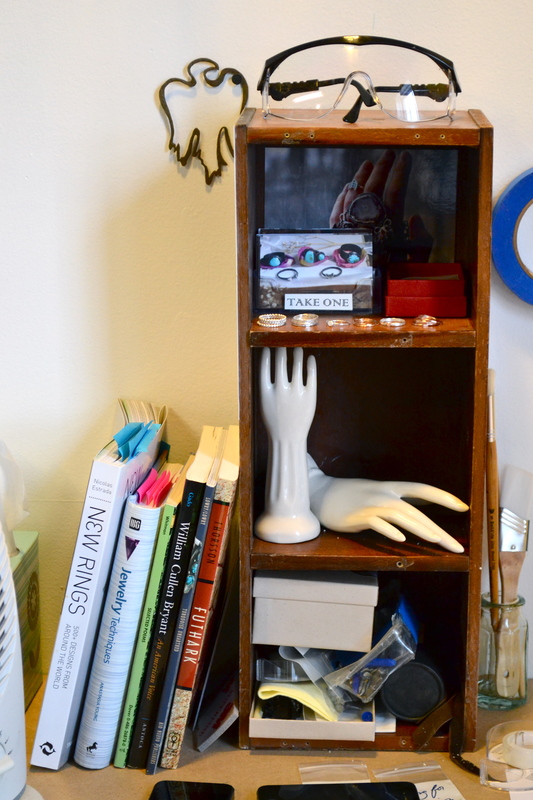 I’ll also be shooting my pieces in less cluttered set ups. Don’t worry. 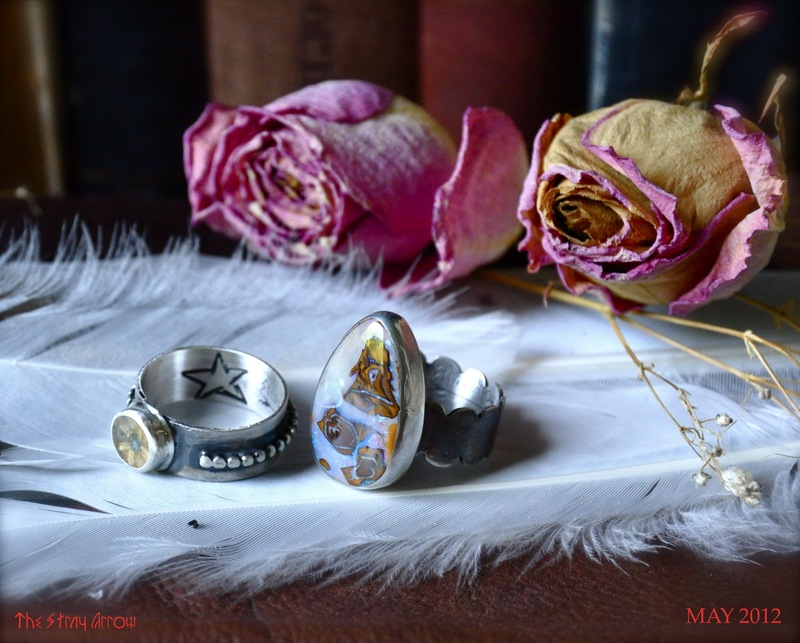 The leather, leaves, flowers, feathers, and all around Earth Essence will still be present. I couldn’t pull it out of me or the jewelry itself if I tried. This year, I did something new. I told folks I was filled up on commissions to not overload myself and keep a steady pace. I put some proposed commissions on hold as well. Why did I do this? Without going into complicated details about the metal smithing process in general, there is some wait time in between technical steps. 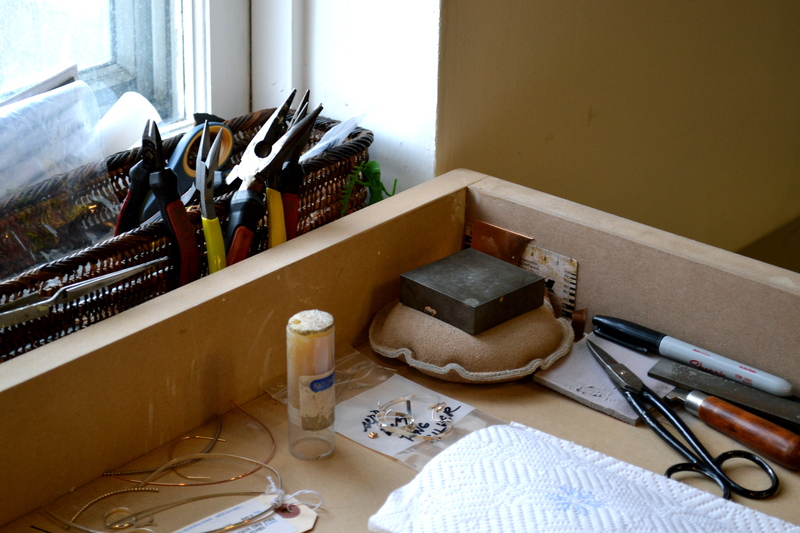 I’m one of those folks that truly just love to physically work, so I always have an extra 5-10 projects going on the side while working on everything else to keep beyond busy. Because of this, dozens of lovely ideas get made up to a point, but I never end up having true time to dedicate to finishing them. By only taking a certain number of commissions the past two months, I’ve been able to finish several projects that have been mer whispers of metal in the studio. All new items posted today have either been in progress, abandoned for the past few months, or stones I’ve been hankering to use for what feels like ages. For everyone wanting to get something specific done and waiting for it, THANK YOU. I currently have some pending commissions that are still being worked on, but I’m completely open for more now! I’ll be contacting folks who’ve been waiting patiently-and yes. You’ll all get little extras for being amazing. Was missed. 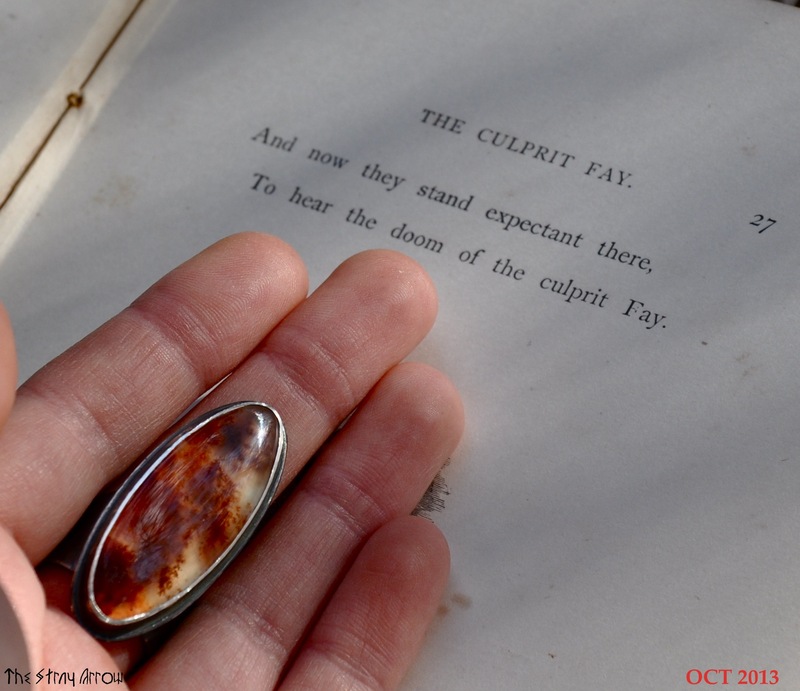 I had Royal Imperial Jasper on the menu…and realized I’ve never made a piece with it! It’ll be done for March First in ADDITION to another stone type. Any requests are welcome! 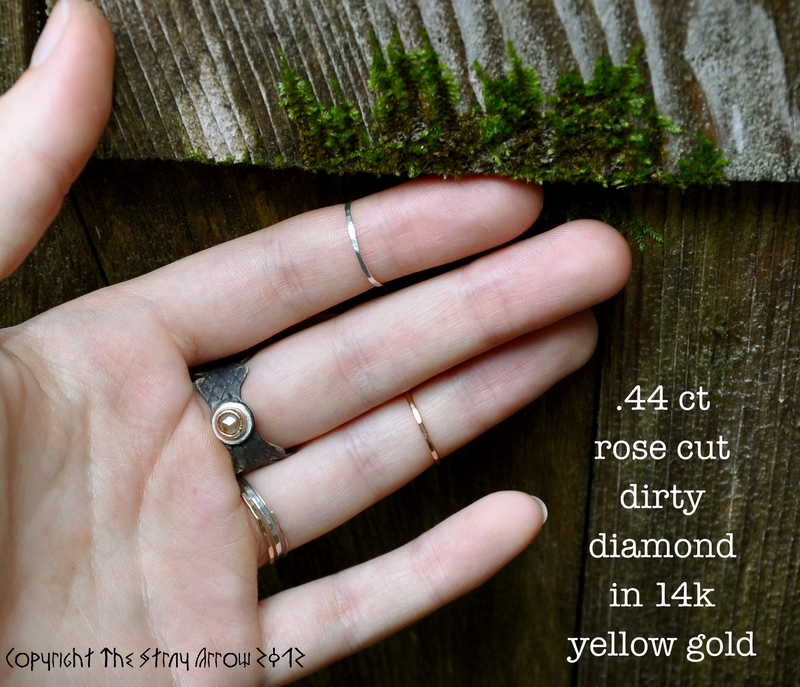 A brief description of the goodies below, which will be hitting the main Etsy shop this Sunday. 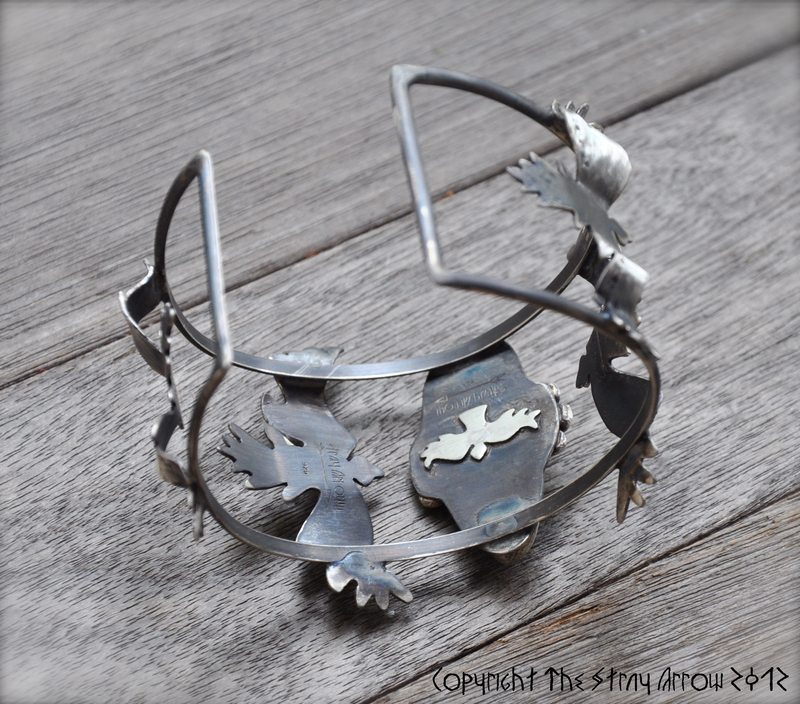 I’ve been working on more pieces veering towards a “Stray Arrow” mindset. What exactly IS that? The entire concept behind The Stray Arrow, which has always been difficult for me to word, is in essence individuality. The Stray Arrow is alone from, or ahead of the pack. The Stray Arrow can be the one arrow in the quiver that makes the bulls eye shot. It’s me and you. 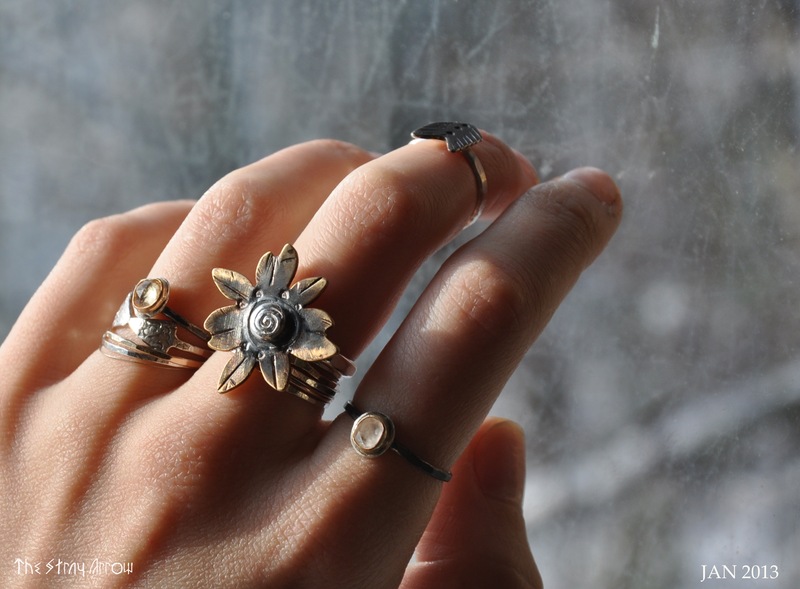 These pieces have a more rustic, Cave Time feel. 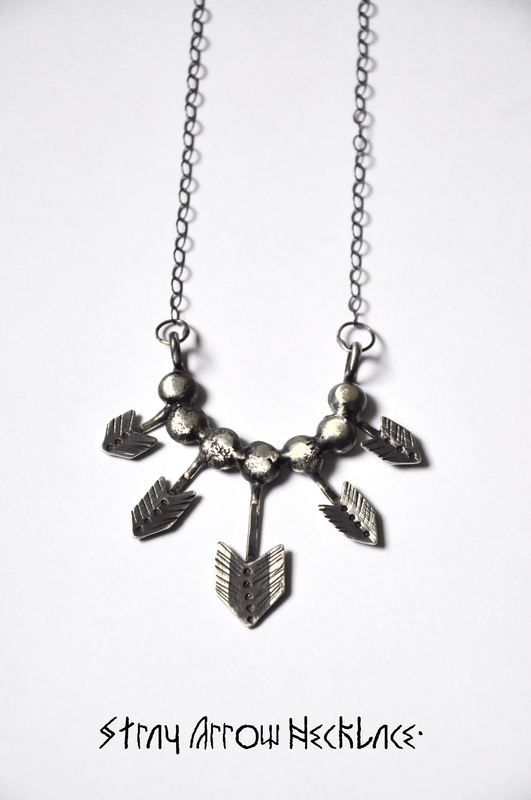 Little arrow vane chevrons, individually sawed/sanded/stamped by hand, adorn each piece enthusiastically. 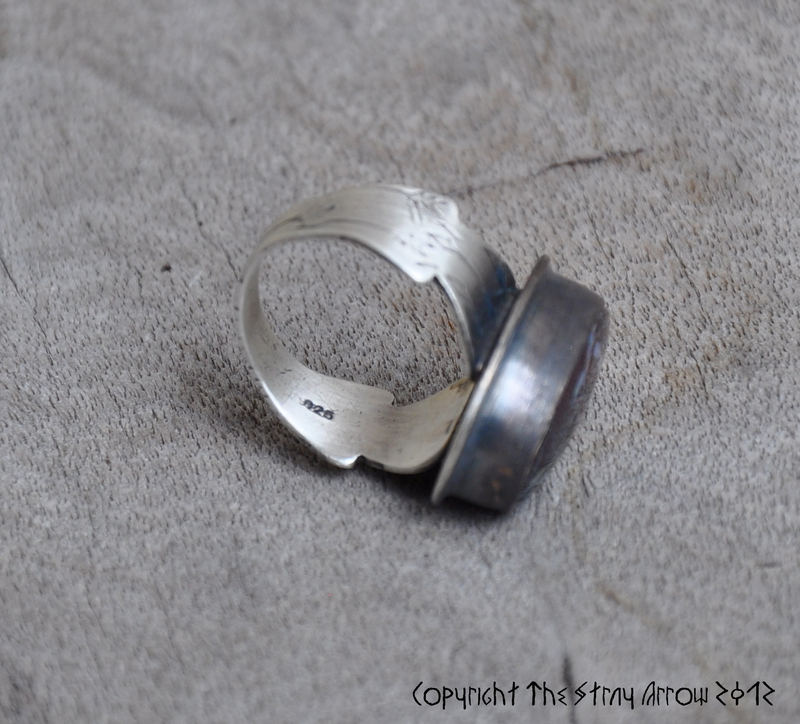 Made of pure molten silver with a beautiful weight to it. 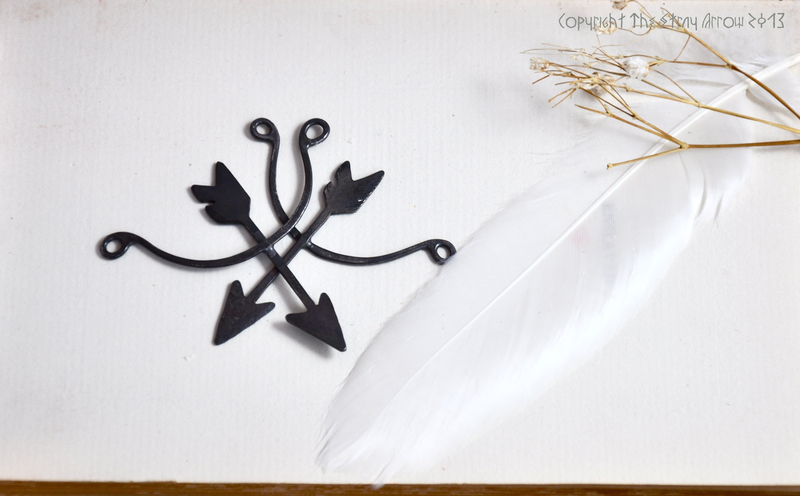 Little arrow vanes fan out, deciding which direction your path will eventually lead. These huge, low swinging necklaces will be made to order upon purchase. 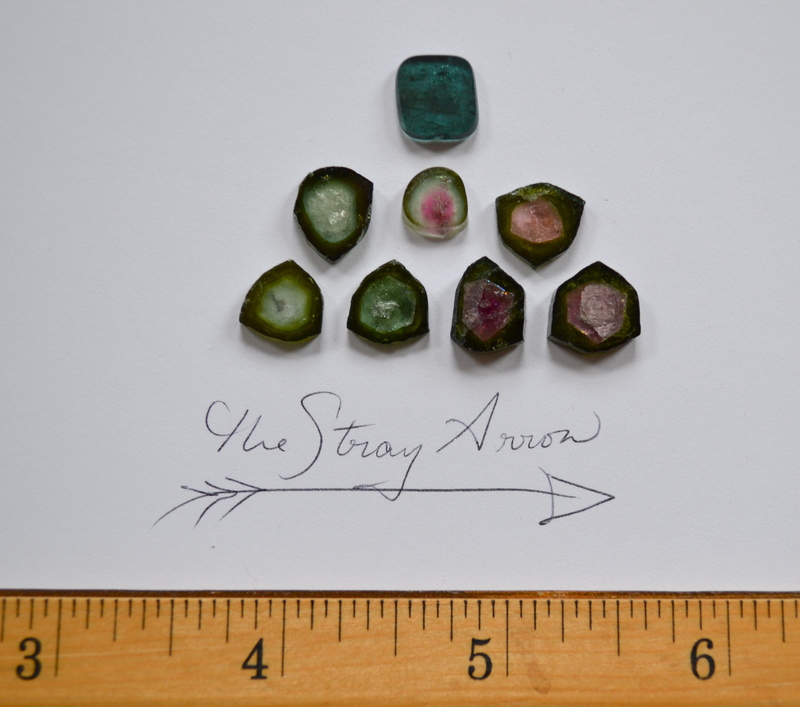 They are true Stray Arrow Wear, reminding you never to get boggled down. You always have options. 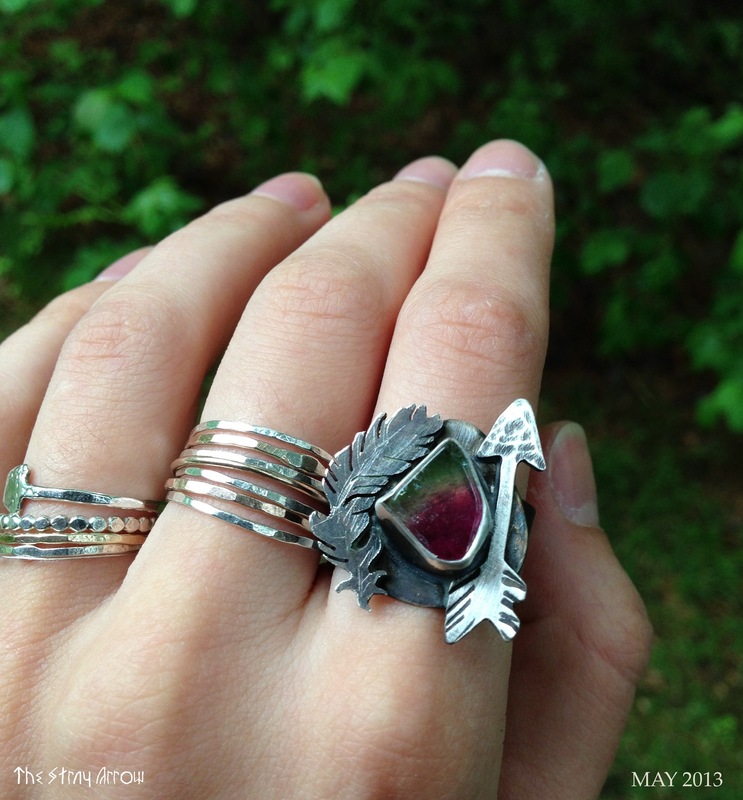 *pairs perfectly with Arrow Vane Stackers & Studs, Feathered Bands, and Crossed Arrows. 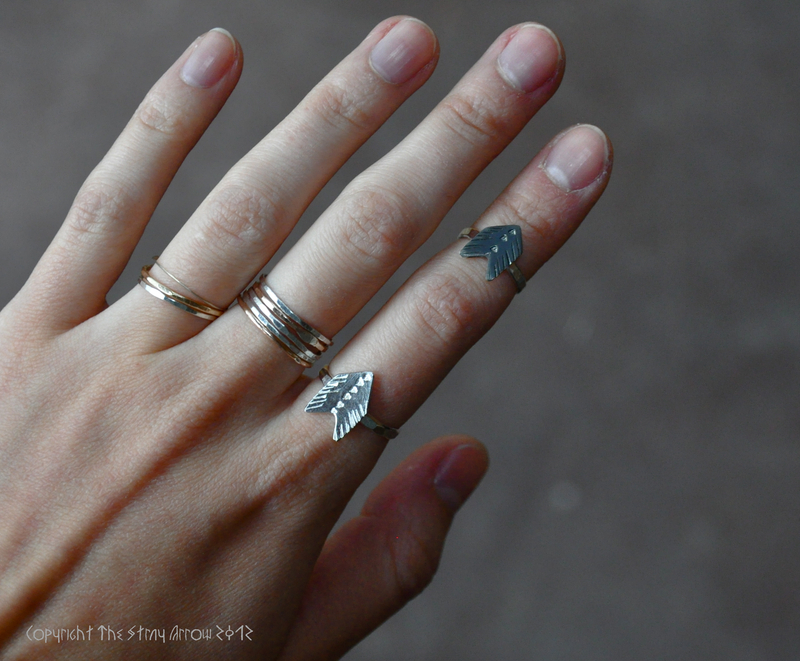 Made literally on a whim in the studio the other night, these will be “made to order” upon purchase. 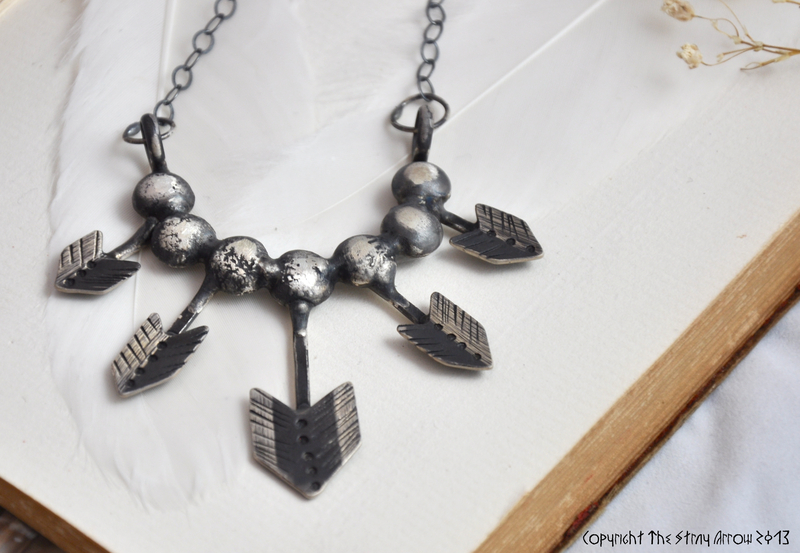 I had a thick arrow sawed out on the bench for another Robin Hood necklace. While listening to Paganini’s 6th Caprice, somehow the shapes of violins, cellos, and violas entered my mind. All those lovely curves while staring at the arrow immediately brought my mind back to bows. 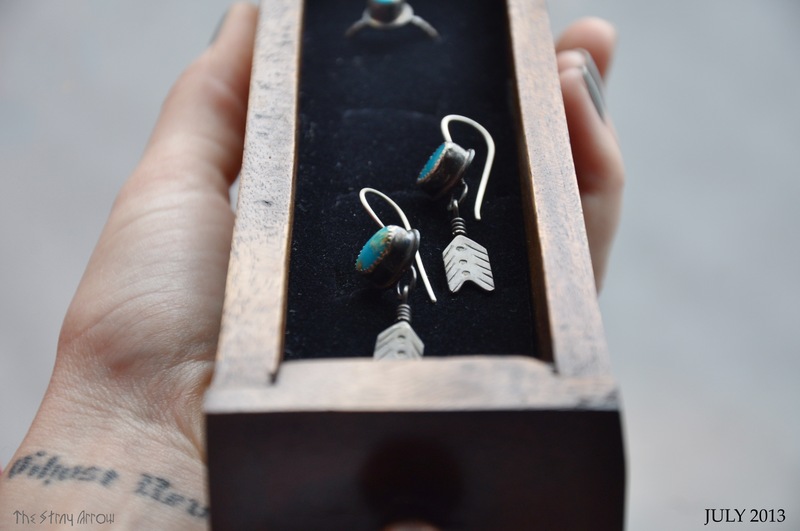 I’ve been craving to make some kind of arrow earring for awhile now. Over the past couple months arrows seem to have BOOMED in the world of popular shapes. Thinly walled base metal castings of basic arrow designs are everywhere. It’s time for something of quality and substance, don’t you think? 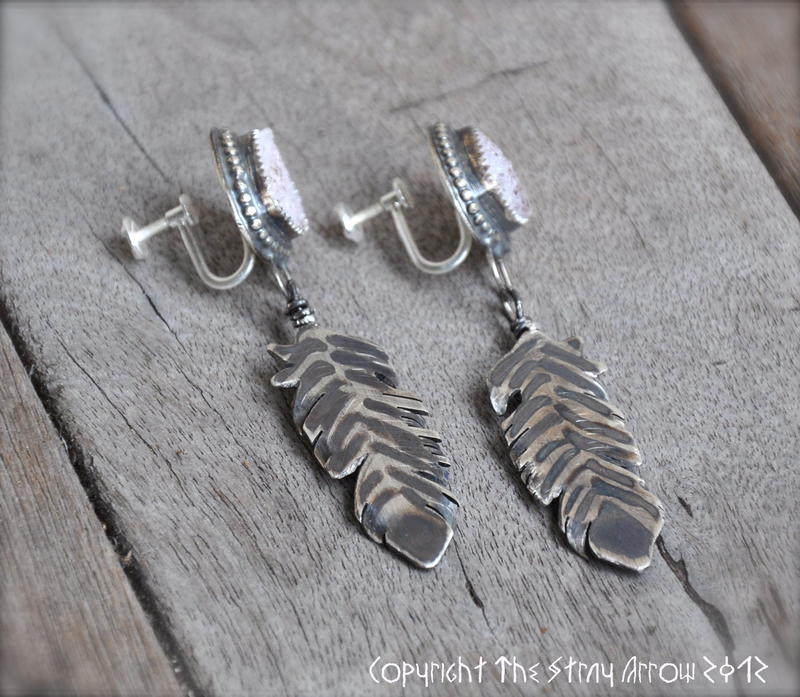 These earrings are completely hand sawed, and stamped with tiny details reminiscent of obsidian stone arrow heads. When everything used to be made by hand, and it was necessity. 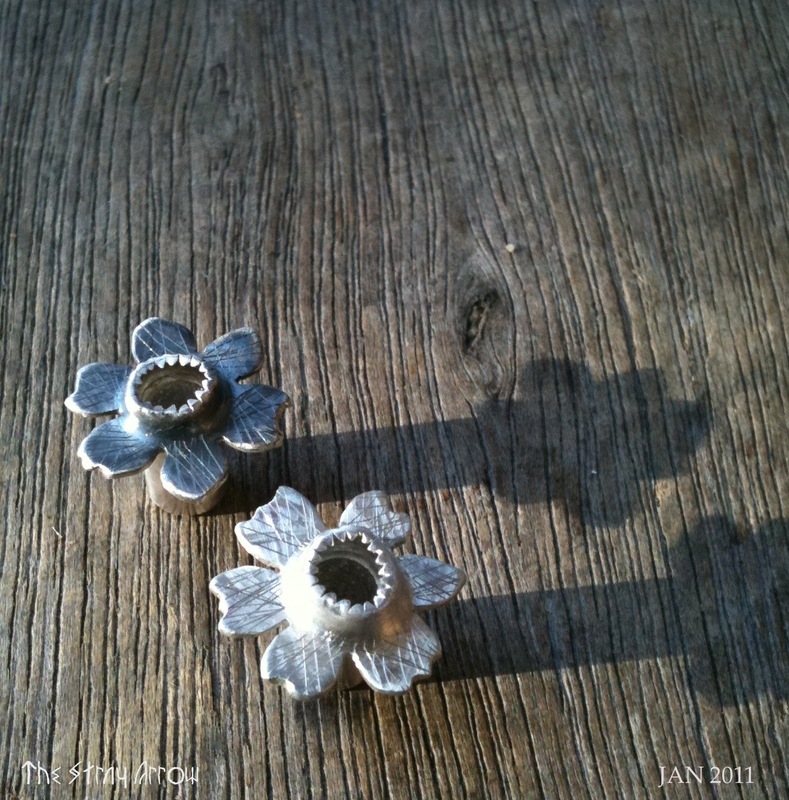 All sterling silver, these are totally darkened. 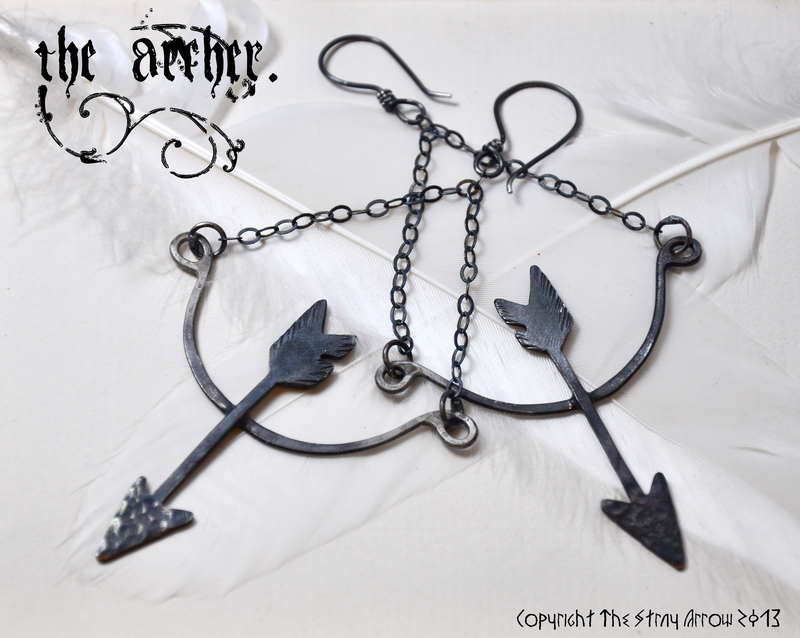 Thick arrows rest on bows, with their sterling silver chain “strings” pulled back. This is a simple, unique design. 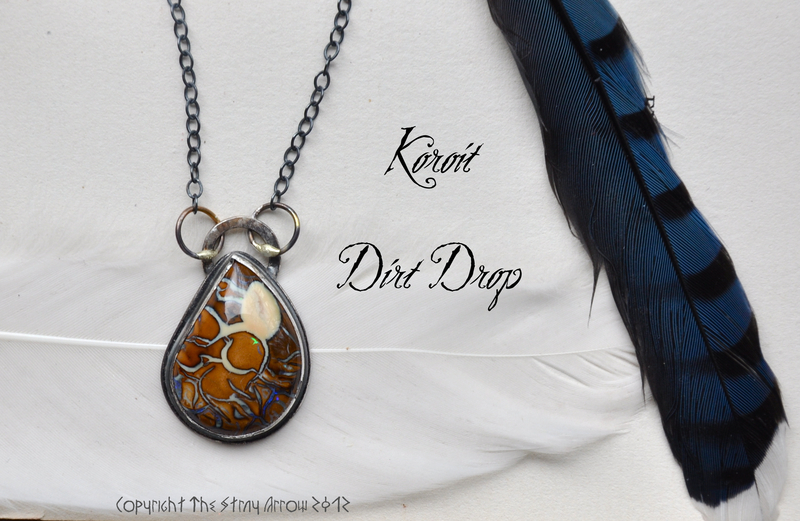 A companion necklace will also be in the shop Sunday. Close friends always have a handful of nicknames for each other. One of my favourites given to me is “Cave Lady”. My hair is fluffy and curly, made up of separate tendrils/tentacles that jut out in spools of crazy. Over the years (and through much trial and error) I’ve found a couple products that “tame the tentacles”, but I’ve come to terms with this nickname in all it’s appropriateness. Cave Lady for me also ties back to the primitive (note: I am NOT using this term in a derogative fashion as it so often is when applied to tribes or nations). When I was little I was obsessed with cave paintings (Lascaux), and trying to find arrowheads. 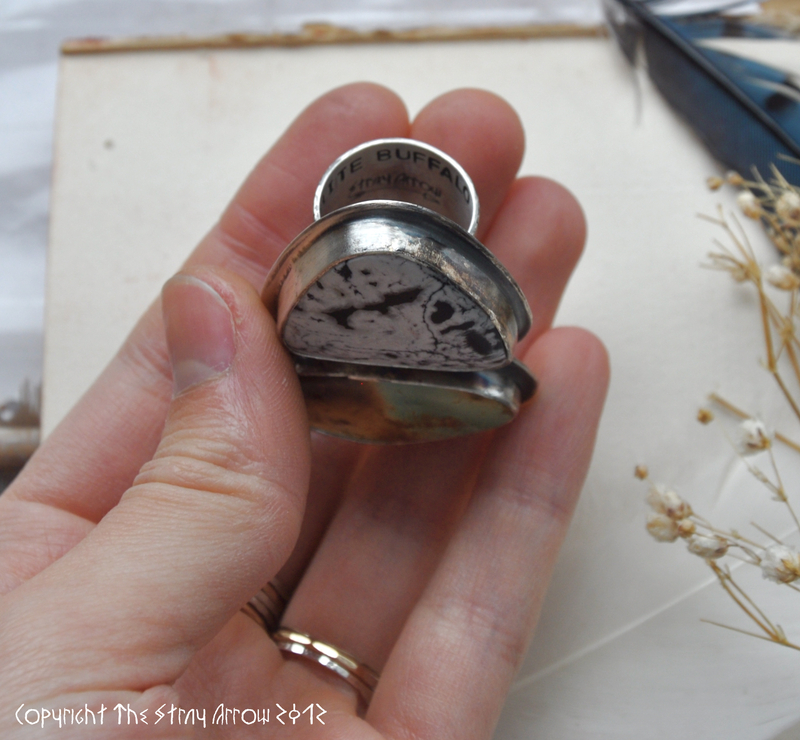 Just the idea of putting that much time into the making of such a small object was fascinating. Fast forward into the future and I am now the creator of small things. 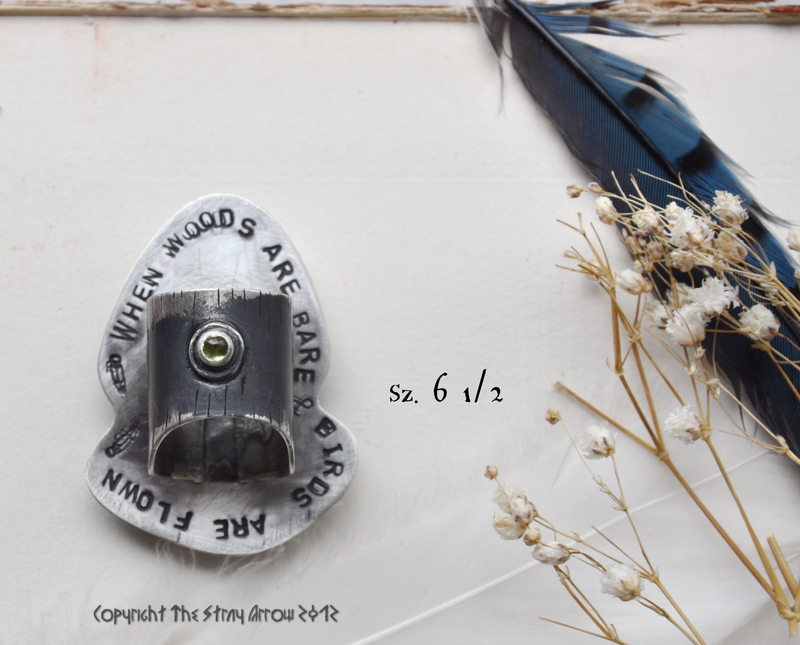 I truly adore sawing and making these little arrow vane shapes, and thought…why not COVER something in it? 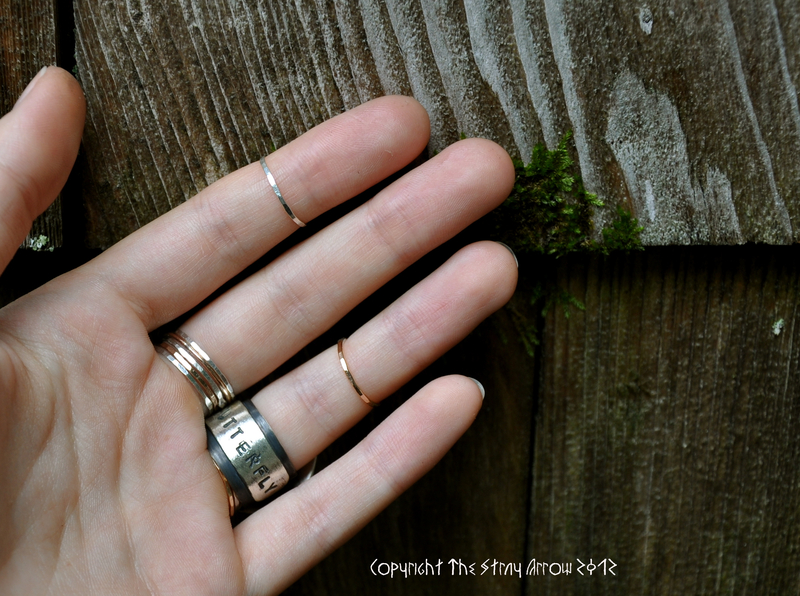 So, in homage to the nickname, the old ancestry that ties us all together, and of course my obsessive love of rocks, I give you Cave Lady Rings. 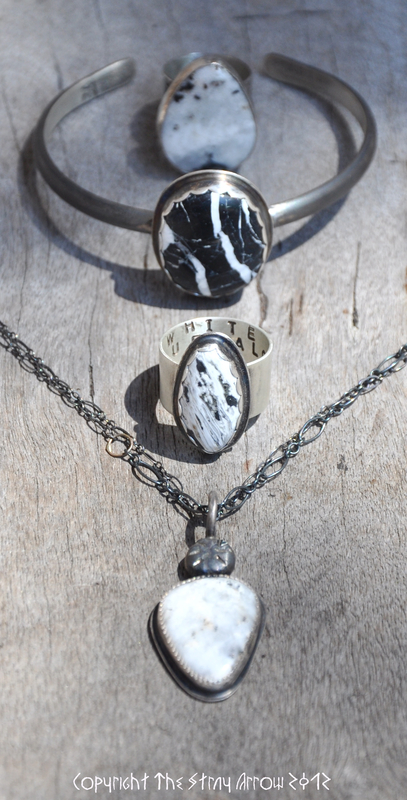 Two are currently made, one using a beautiful White Buffalo Turquoise stone and one a unique Koroit Opal stone. 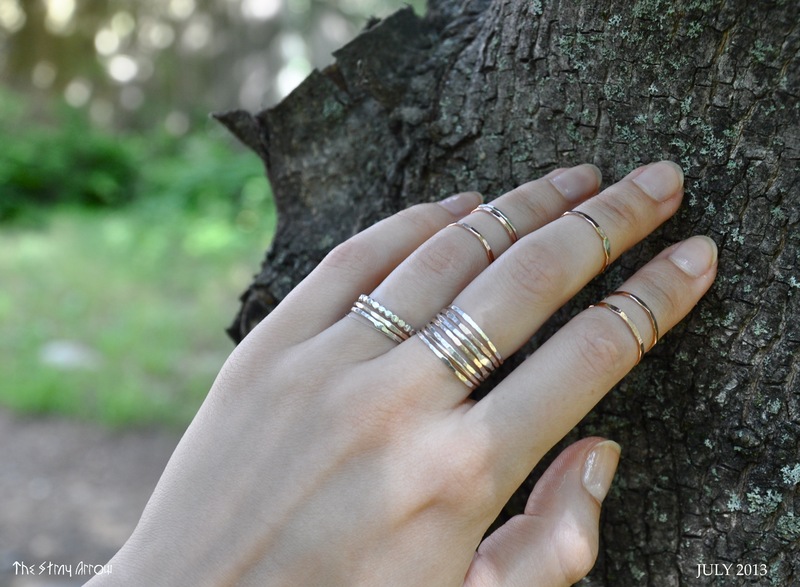 These rings feature little dangling Arrow Vanes, that also give them a Gypsy feel (another obsession, as a chunk of my family are from the Carpathian Mountains). 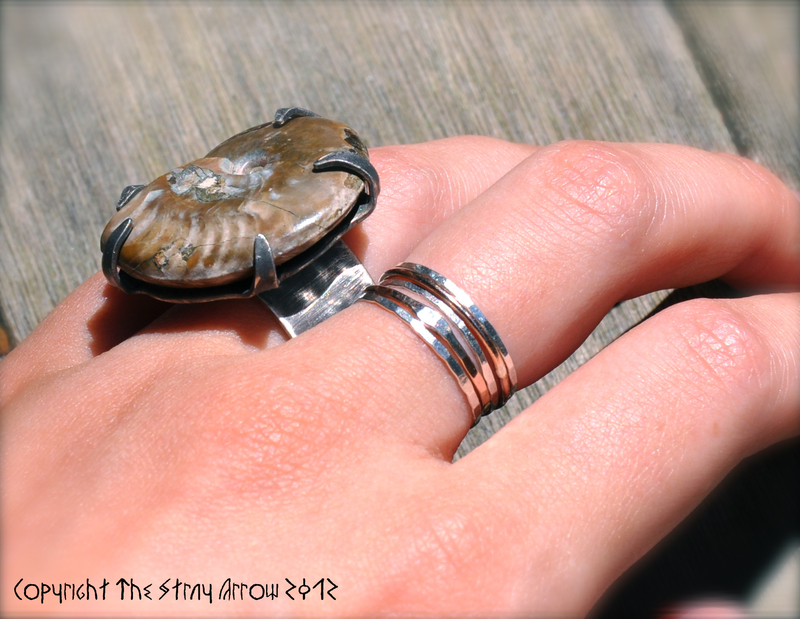 Each ring has a wide band with “Cave Lady” stamped on the inside. 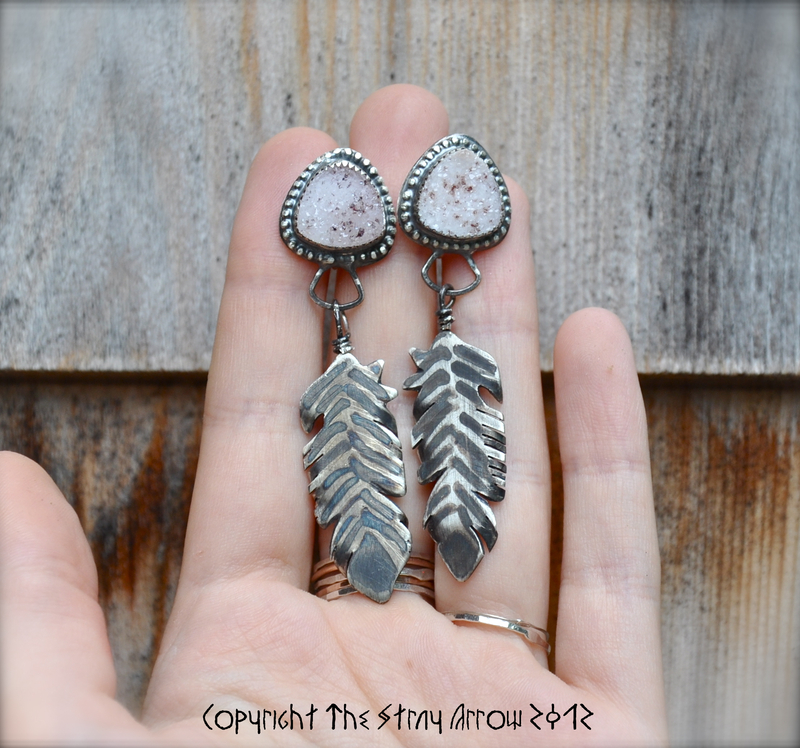 These can be custom made with your stone choice in your size. 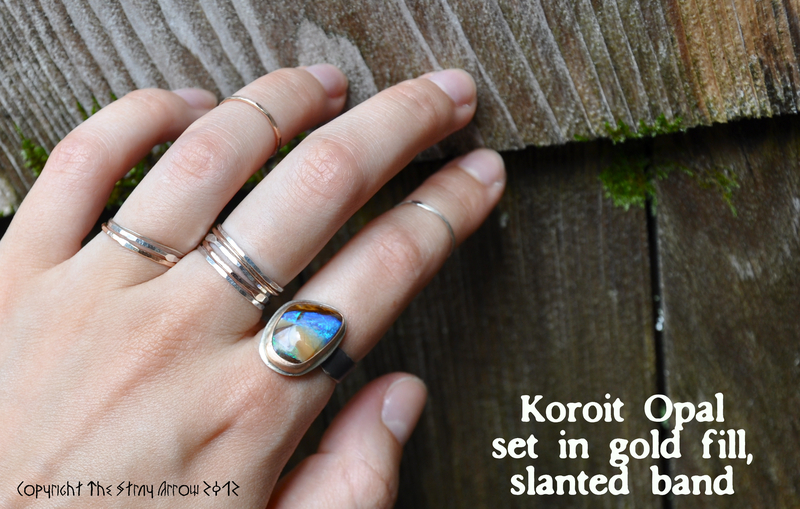 The two current rings will fit a US size 5.5-5.75 (Buffalo), and US size 8 (Koroit). This piece is pretty substantial. 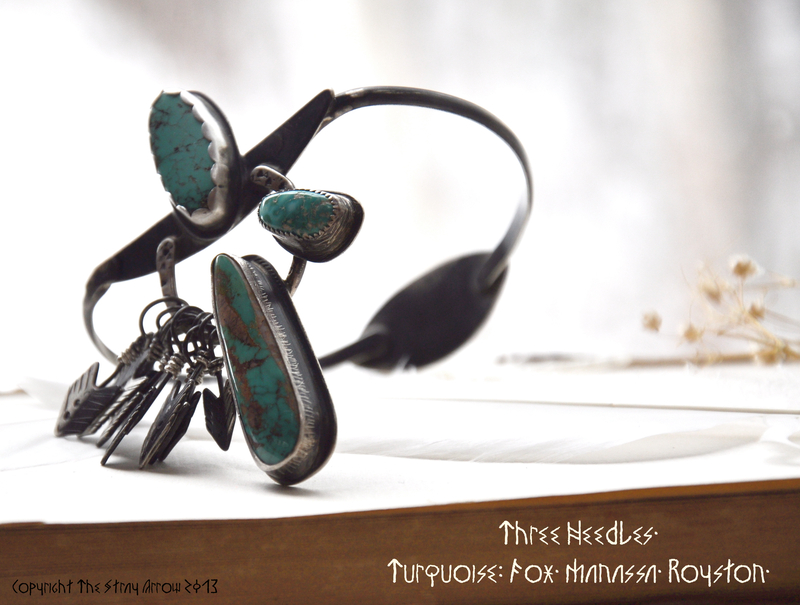 The Three Needles (as in Pine tree needles), features three different kinds of old stock, natural, rare and collectible kinds of American Southwest Turquoise. 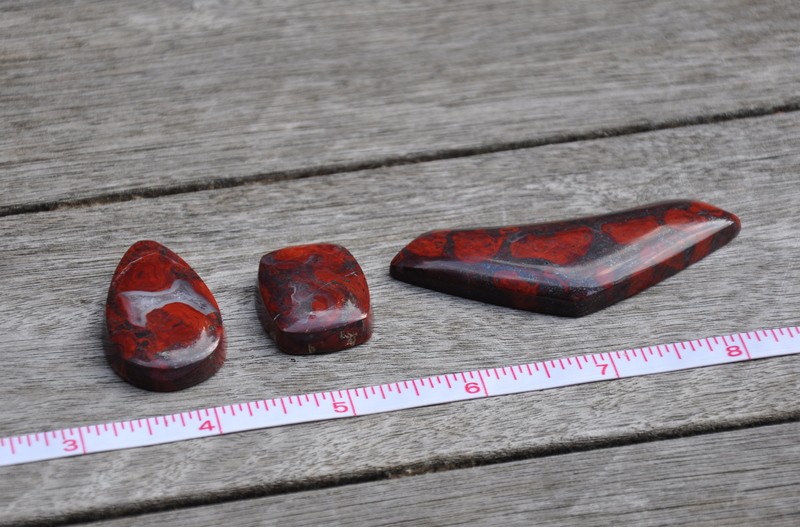 I obtained these three stones from a man who deals directly with the mine owners, so these are from old stock collections of the owners themselves! 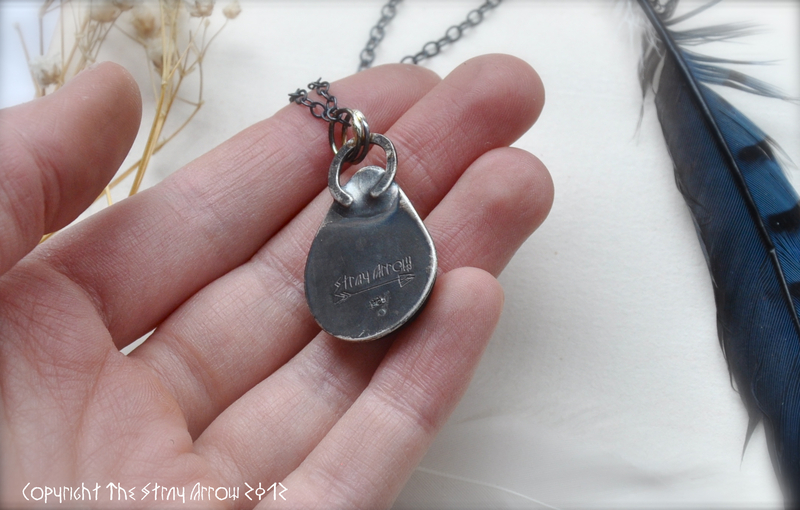 Each mine name is stamped on the back of it’s respective stone. 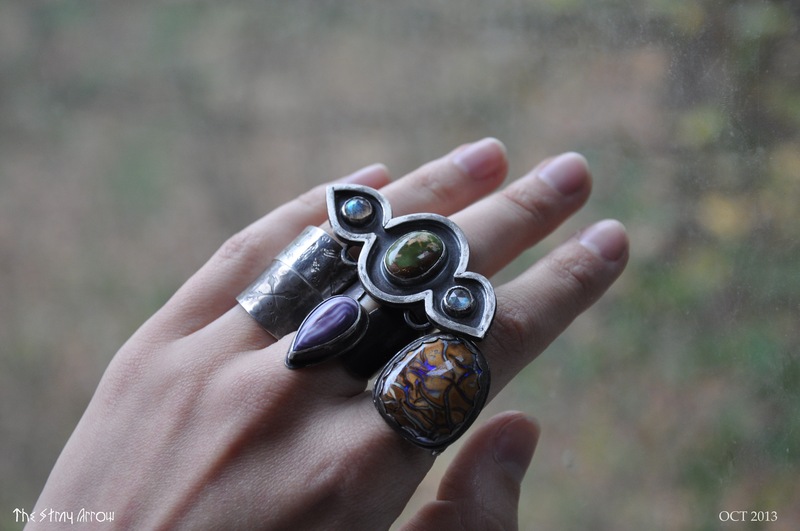 Each stone has a different bezel type, with a different etched in textural design around the bezel. 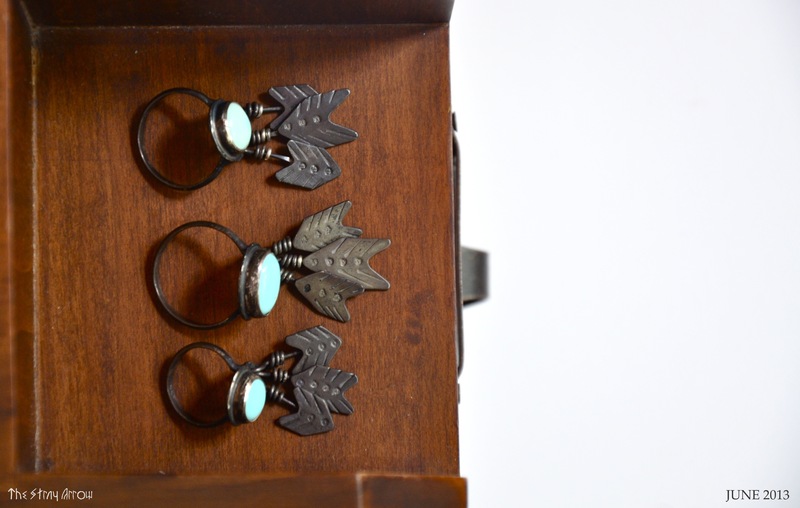 The horse shoe shape that two of the turquoise stones rest on is also filled with dangling hand sawed arrow vanes. 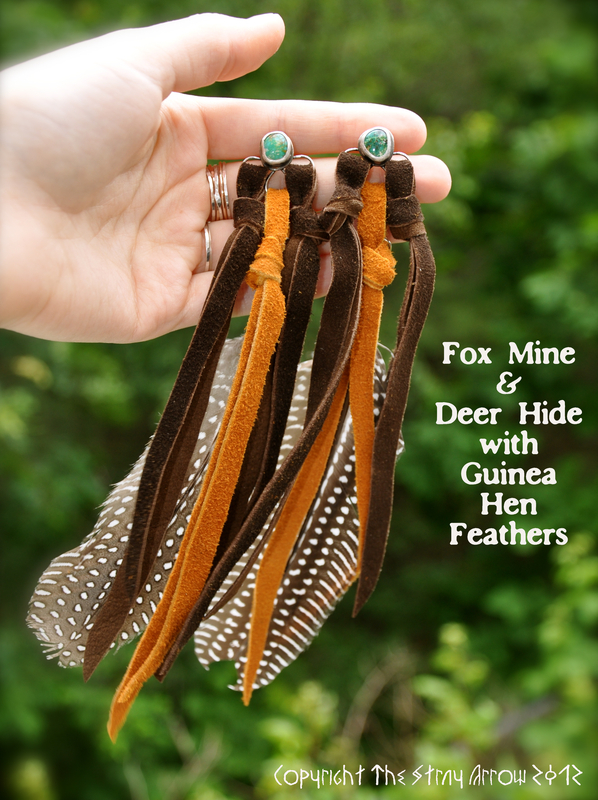 These make a fantastic light noise when in motion, and add a little movement to the piece. 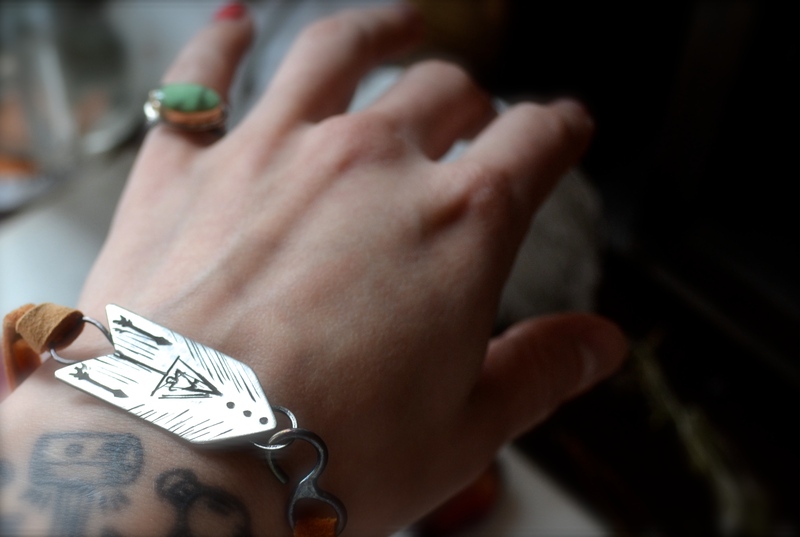 It will fit a small to medium wrist. 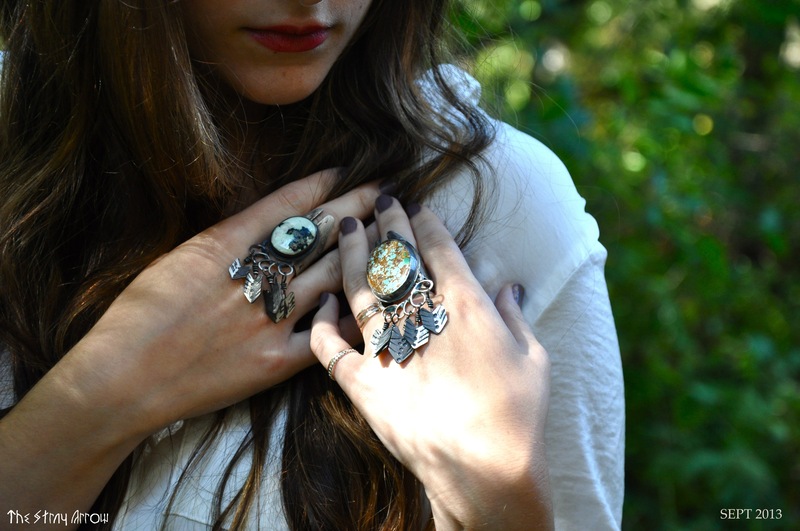 This is a serious unique statement piece. 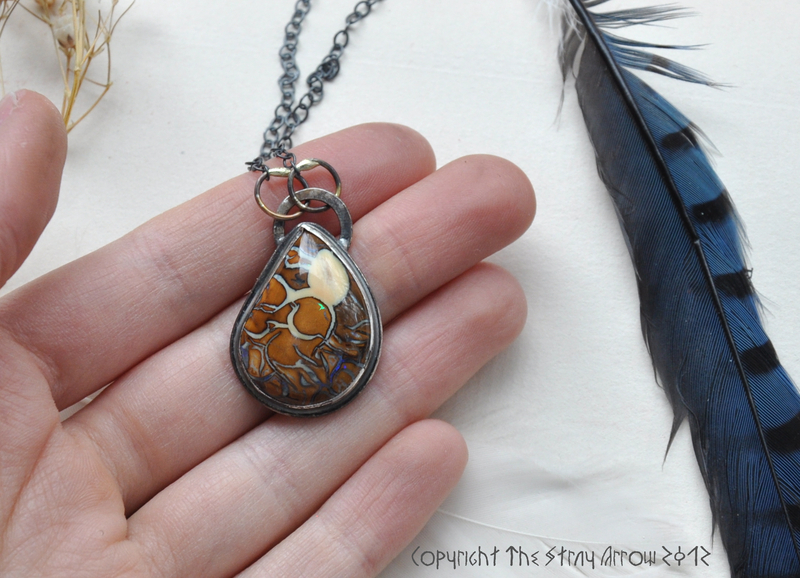 This necklace has been on the work bench half finished for a long, long, time. It ties back to my Romantics Line, featuring quotes of poetry or literature. The quote is from Ralph Waldo Emerson’s, “The Humble Bee“. 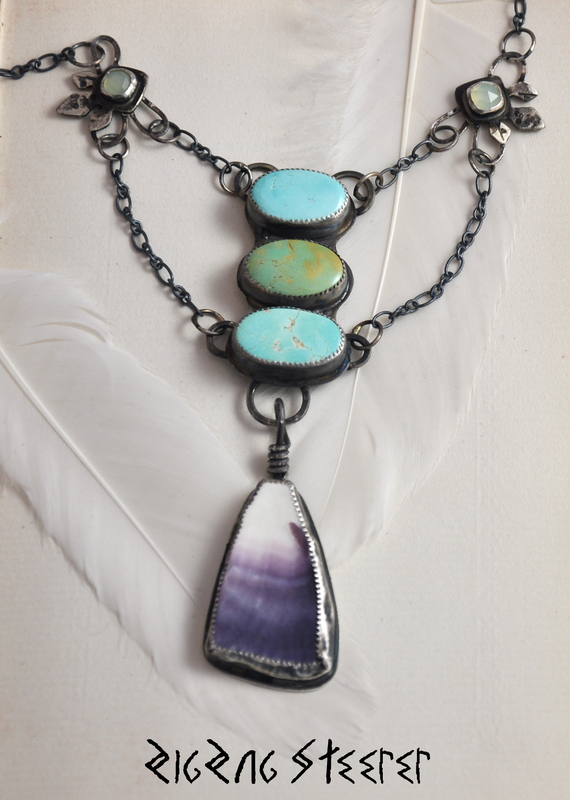 Featuring three nicely coloured old stock natural Royston Mine turquoise stones, wampum, and chalcedony gems, this is a massive piece. The wampum is an amazingly coloured chunk that my mother actually found on the beach last year. 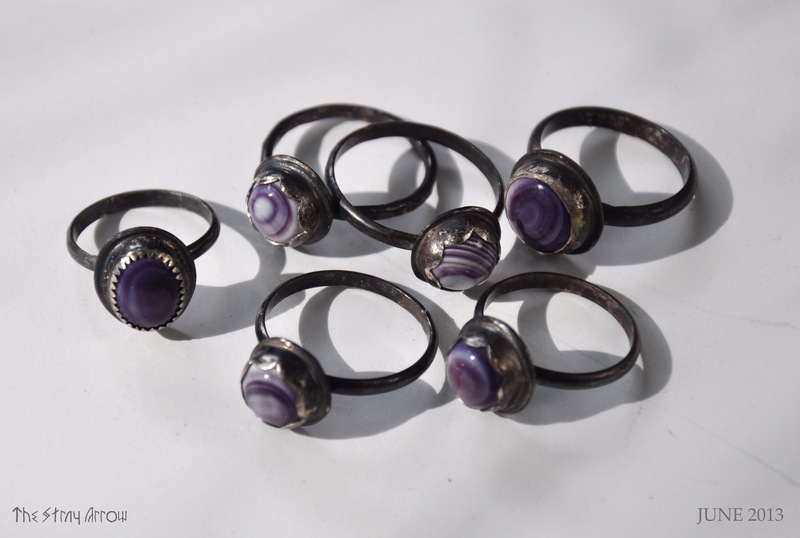 For anyone out there who knows about wampum, you know what an impossible feat that is! 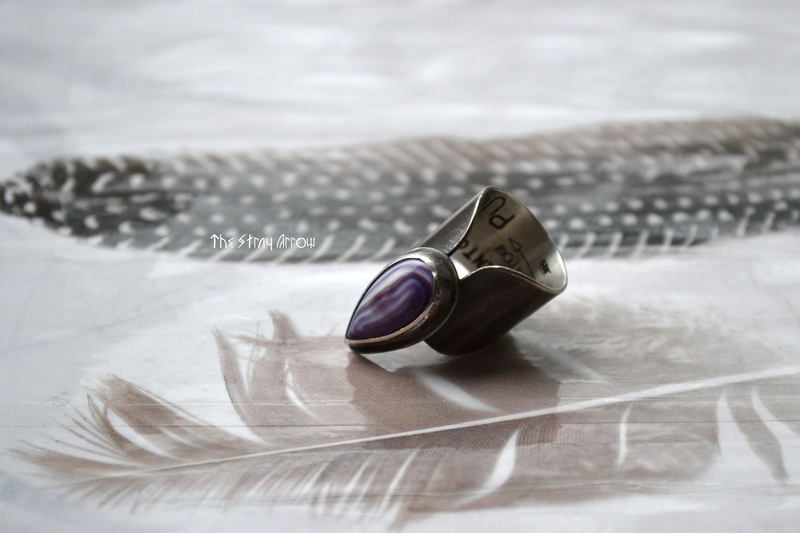 I set the wampum in pure silver bezel on a sterling backing just as it was found. 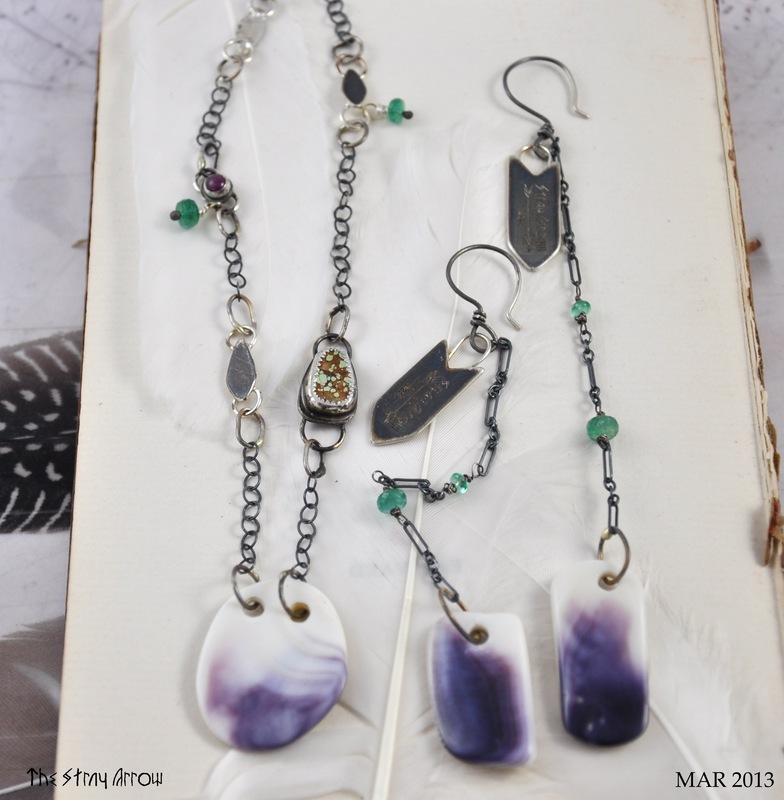 The wampum dangles from the massive three turquoise stone pendant. 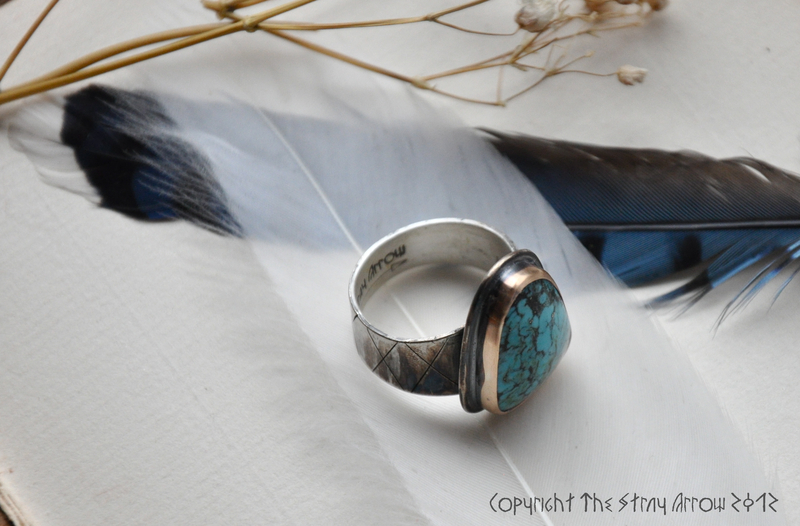 The great quote from Emerson’s poem, “Zig Zag Steerer, Desert Cheerer“, is stamped on the back of the turquoise and wampum. Little oceanic flowers of faceted sea foam chalcedony gemstones join the pendant on the blackened silver chains a ways up. 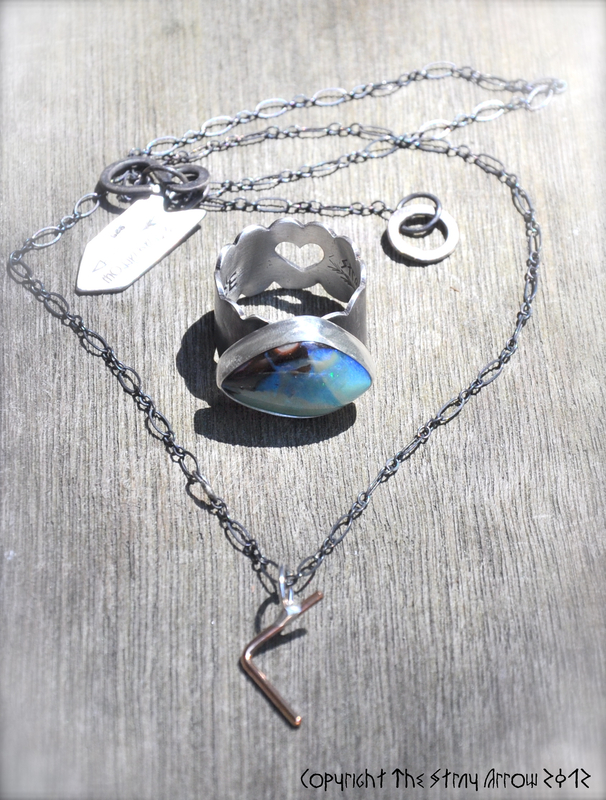 The necklace length is adjustable by using the tiny amethyst gem clasp, or the plainer silver clasp at the end. 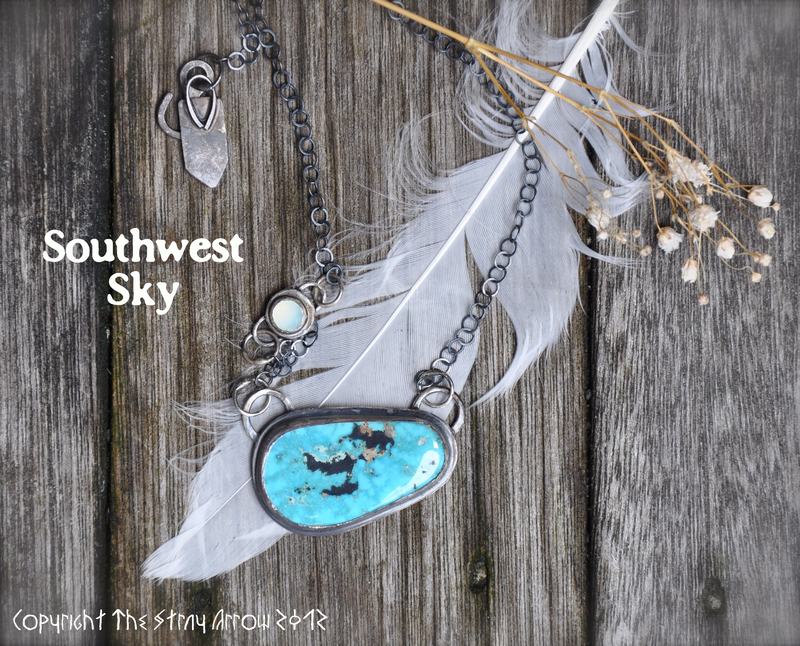 This piece oozes feelings of royalty, beach colours, bookworm appeal, the Southwest, and even latches on to my “Along The Dark Shore” themed pieces that combine turquoise and wampum. There’s something in it for everyone, and it has an amazing weight and presence to it. All of these fresh lovelies, PLUS MORE, will be in the main shop on Sunday. 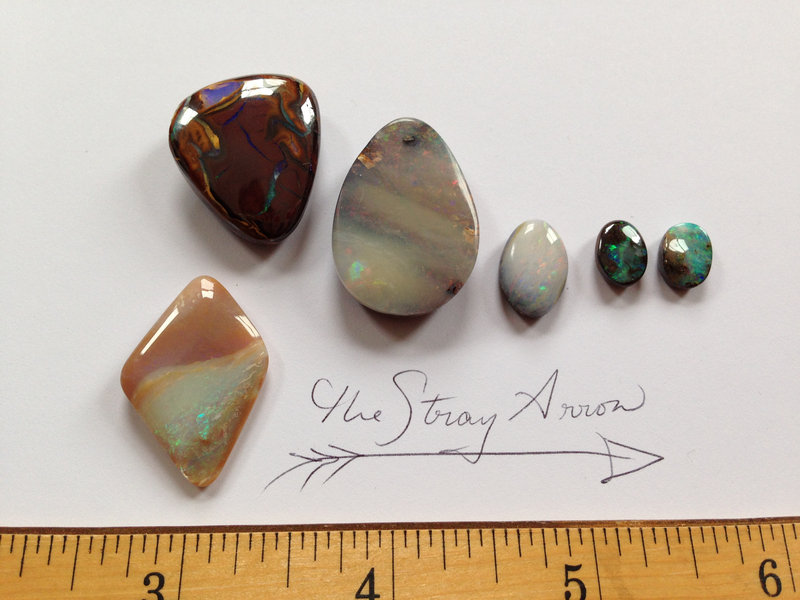 Any new pieces joining those that have been previewed here may make an appearance on my FaceBook Page or Instagram (username: TheStrayArrow). Anything can be reserved ahead of time if you have your heart set. 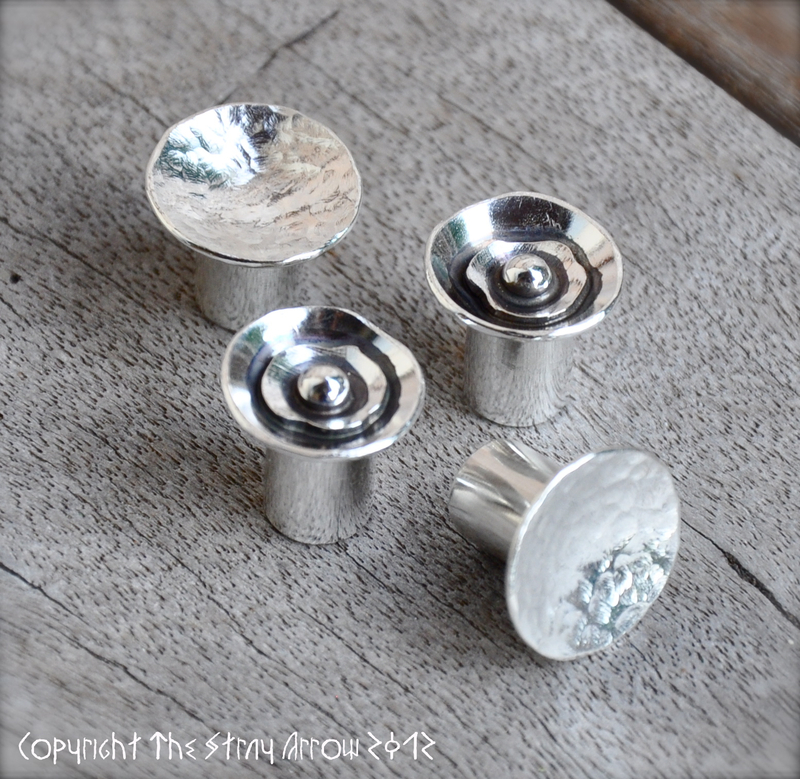 I have been neglecting the shop for those with stretched ears, and will be pouring my efforts into breathing back some life into it in the coming week. Stay tuned. 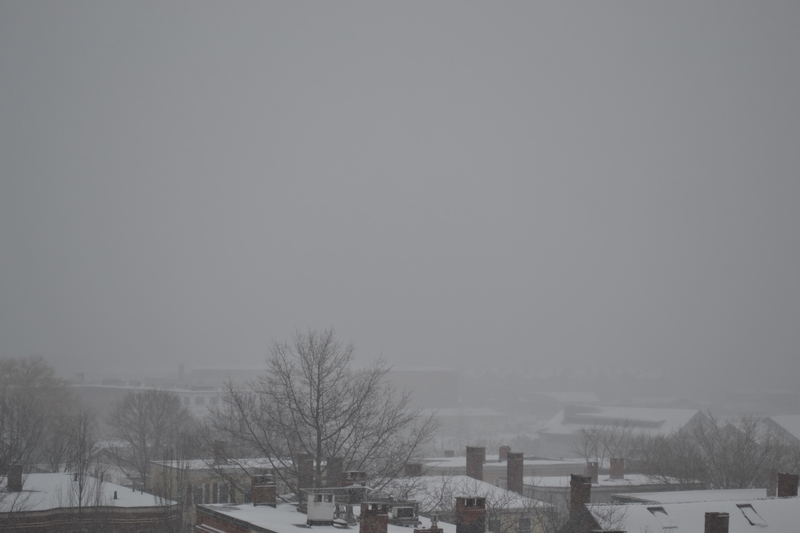 In the meantime, it looks like we’re expecting ANOTHER snow storm here in New England this weekend. For those in it’s path, stay warm. A DISCLAIMER: I am an enthusiast. I have gathered all of the information here by myself over years spent drooling over and collecting rocks. 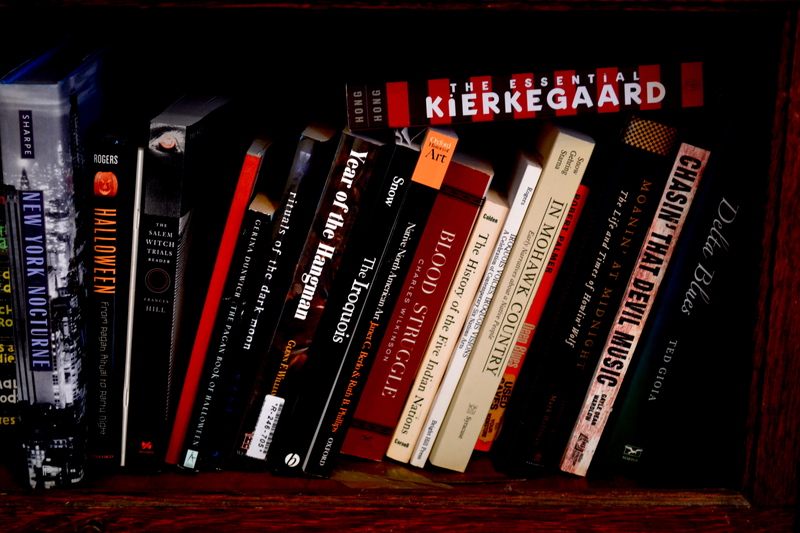 I have not been trained, schooled, or educated beyond my own research. I am not a lapidary artist, mineralogist, gemologist, mine owner, or any other kind of authority on gems, stones, or minerals. I am simply sharing information I have gathered through reading and observation, and my opinions. If you see something mislabeled please –kindly- let me know. 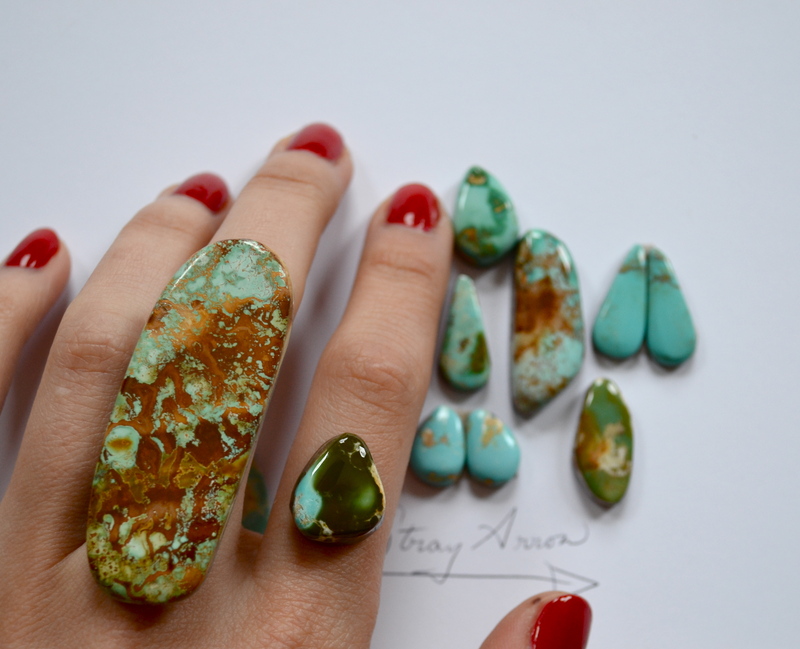 For this Turquoise Guide, the main aim is to educate anyone and everyone who would like to know how to identify the quality of what they’re buying (many of these factors can be applied to all stones, not just turquoise). 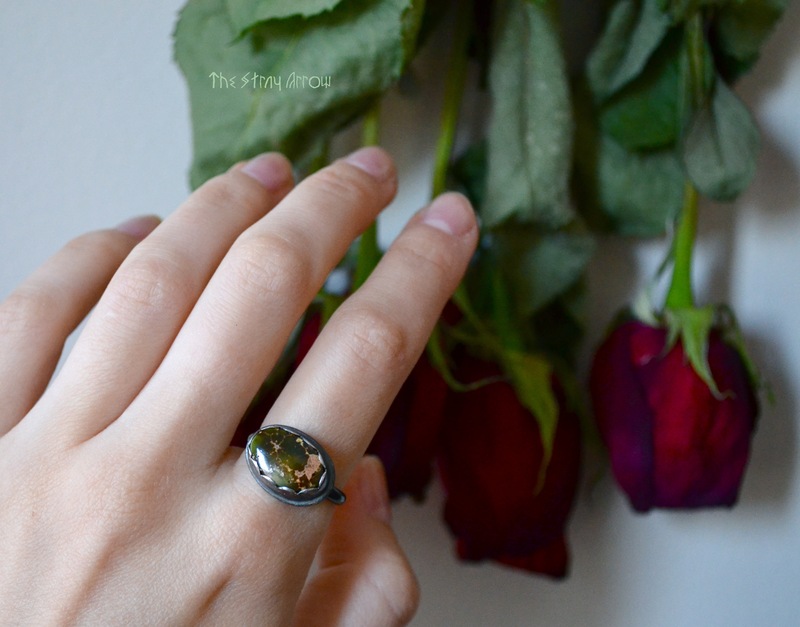 A three star grading system will be used solely within my shop for my own jewelry pieces, and will be explained with examples towards the bottom of this post. Rough/Nugget: when a stone is in a nugget or chunk rock form straight from the earth. Slab: After the rough/nugget stage rocks are cut into working slabs (from what I’ve seen around ¼” thick), that a lapidary artist will trace in pencil where to cut cabochons. Preform: The shape of a cabochon cut from a slab and roughly started. 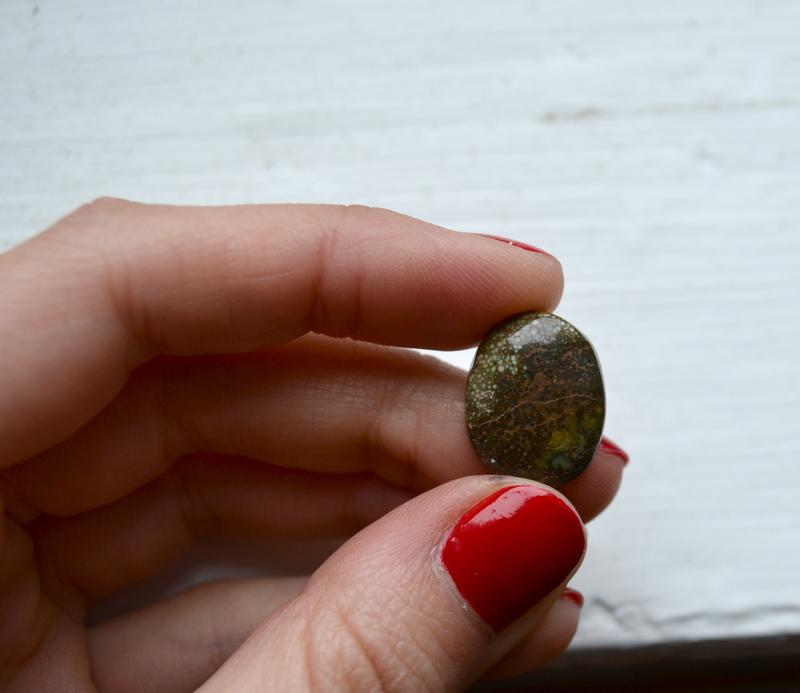 Cabochon (cab for short): Stones used in jewelry, mainly for bezel setting. 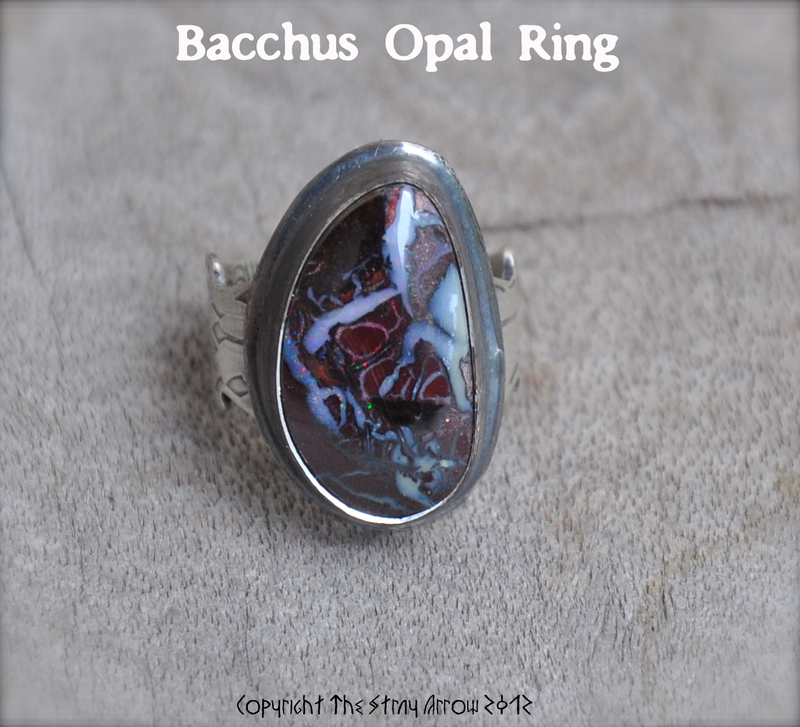 Cabochons are flat on the bottom and polish domed on the top for easy setting. 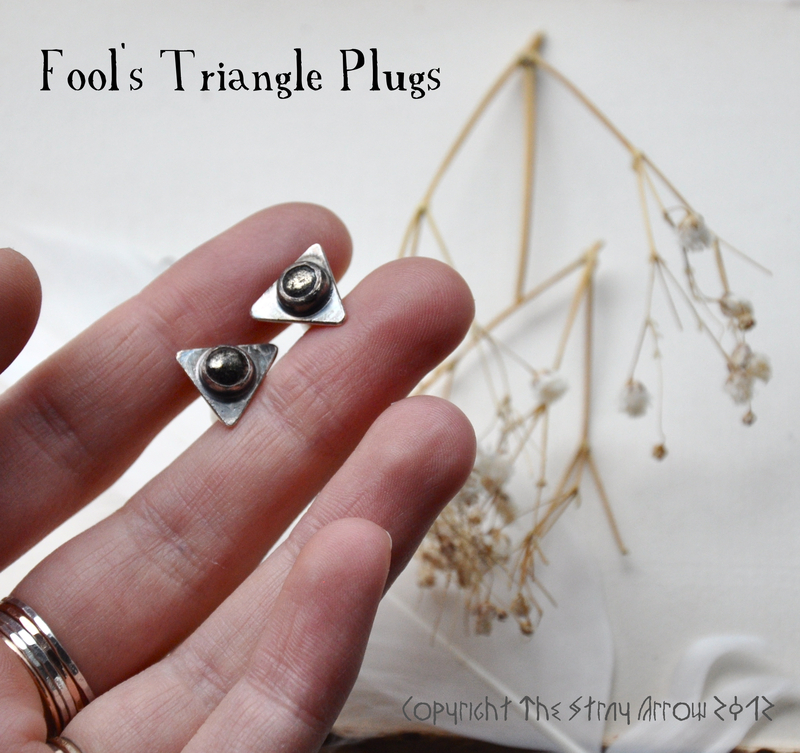 Doublet: When a stone or gem has some kind of backing. This can been seen in “opal doublets” or triplets-which is done to save money. 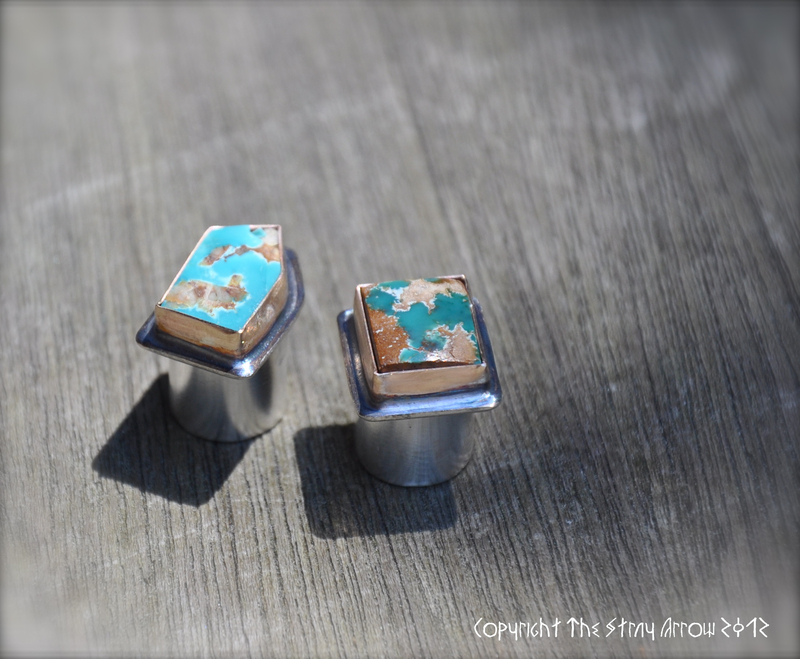 In the case of turquoise, however, it is often done in the lapidary process to work with the stone when shaping and polishing. 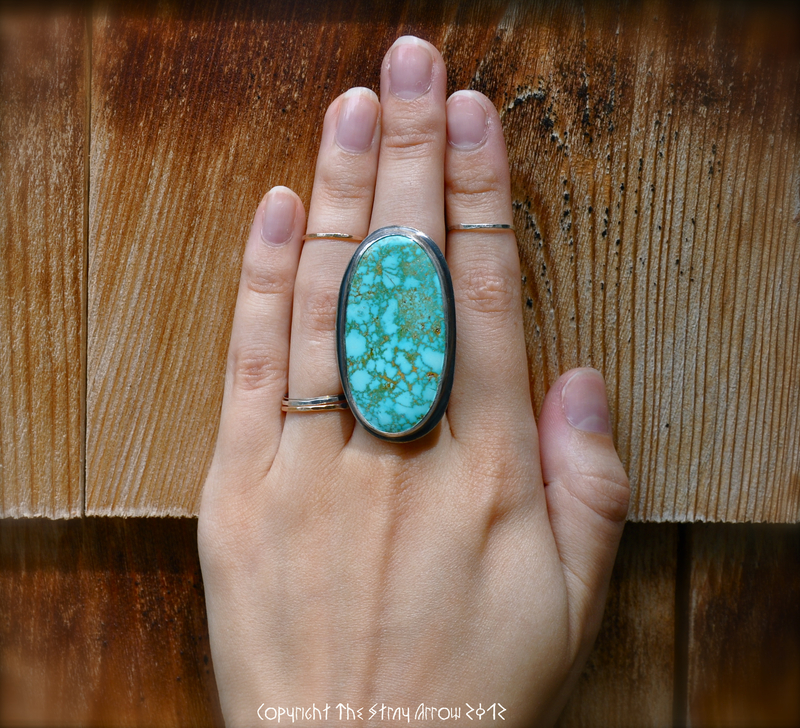 Turquoise is very soft compared to other mineral types, so many natural turquoise stones will more often than not have a resin backing. 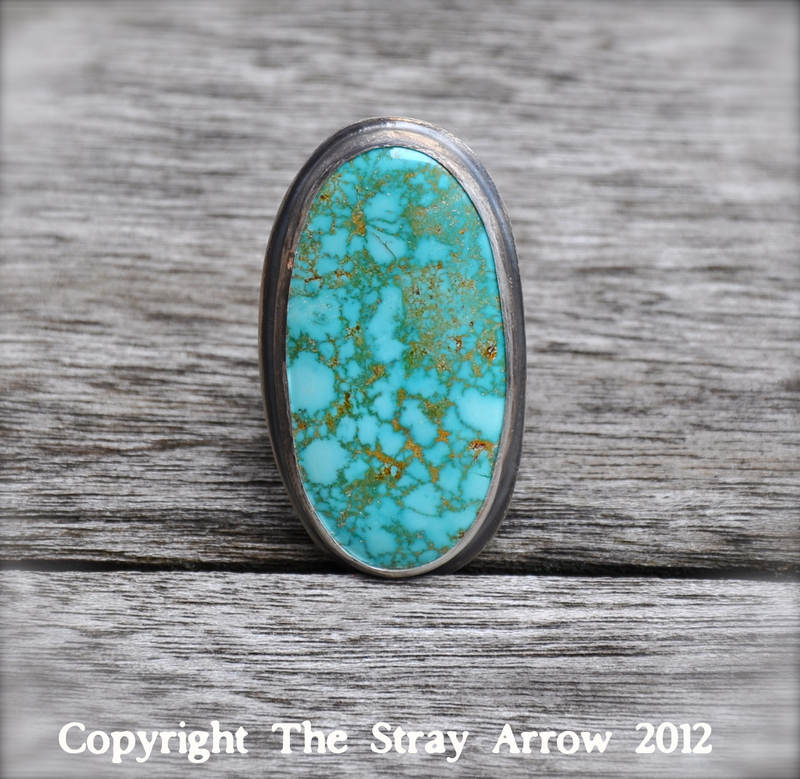 This can actually be handy when buying turquoise because stabilized, or enhanced turquoise won’t have any resin backing. Enhanced: When natural stones are treated to improve colour, finish, strength, or other characteristics. This lessens quality as “natural” is more desirable. Enhancement methods can include surface coating, filling cracks, oiling (usually done to emeralds to hide fracturing), waxing, dyes etc. Stabilized: A form of stone enhancement where plastic resins are forced into the pores of a stone to harden and brighten colour. The only way I know of to test this is to take a heated pin to the stone and see if you smell plastic. Fracture: A crack or break in the rock. 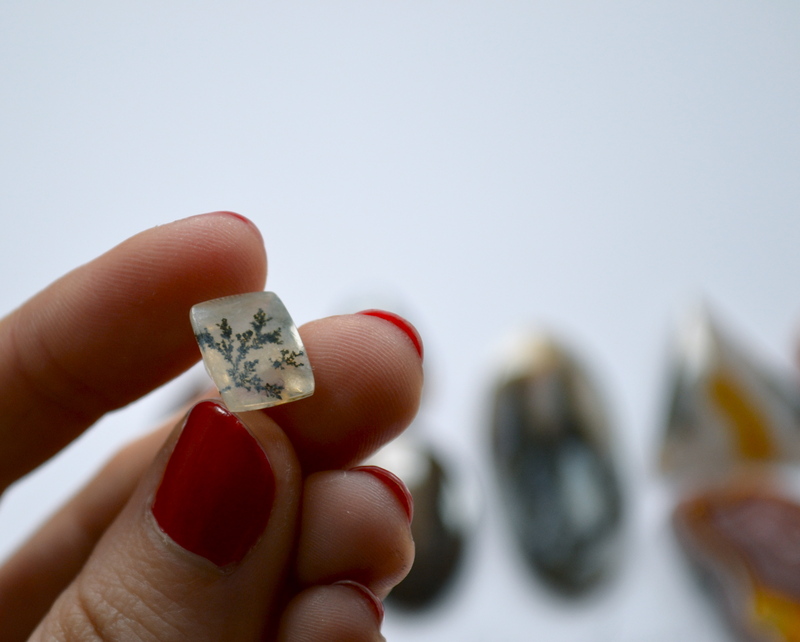 Fractures can also be teeny tiny river shaped cracks in the surface of a stone, which is common among older stock pieces, natural pieces, or especially soft pieces. A stone can often still be used with fractures as long as there is no chipping, but they are not desired. Porous: A stone with tiny holes in the surface. While these can still be beautiful, things like water and oils from skin can get into the rock and change it’s colouring over time. Value: Spectrum of light to dark. Saturation: The intensity, depth, and vividness of colour. Chroma: Purity or intensity of colour. Luster: State or quality of shine. 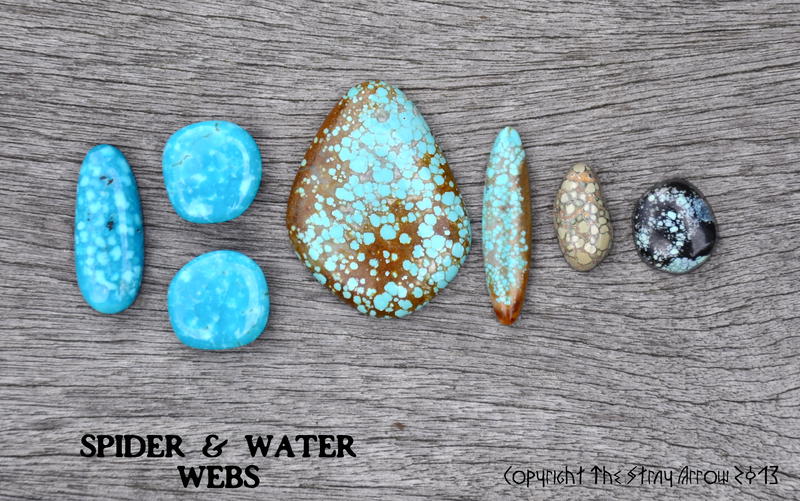 Water Web: When a stone features a webbing pattern of two different tones/values of turquoise without a host rock. 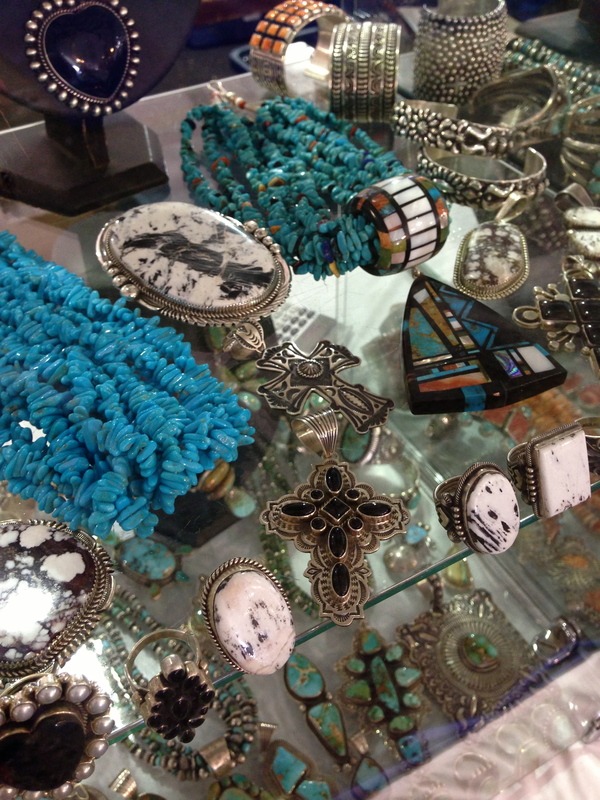 All of the turquoise I collect comes from the American Southwest. 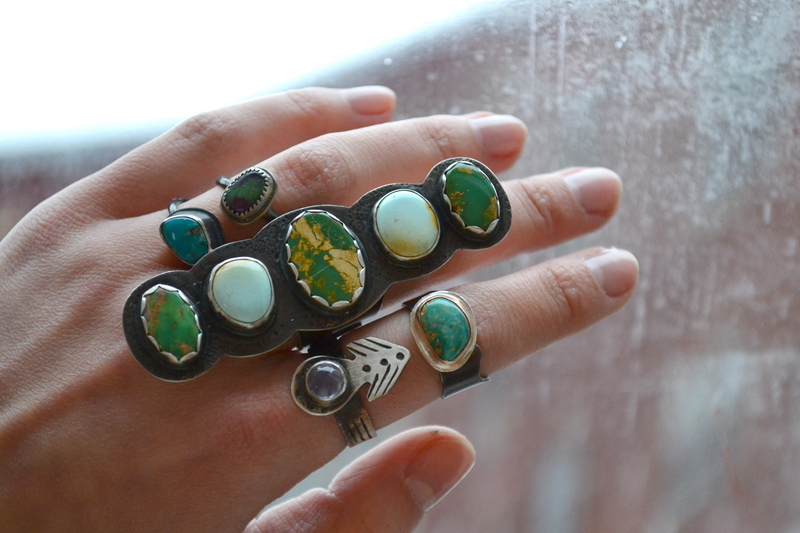 Other turquoise hubs that I know of are China and Persia. 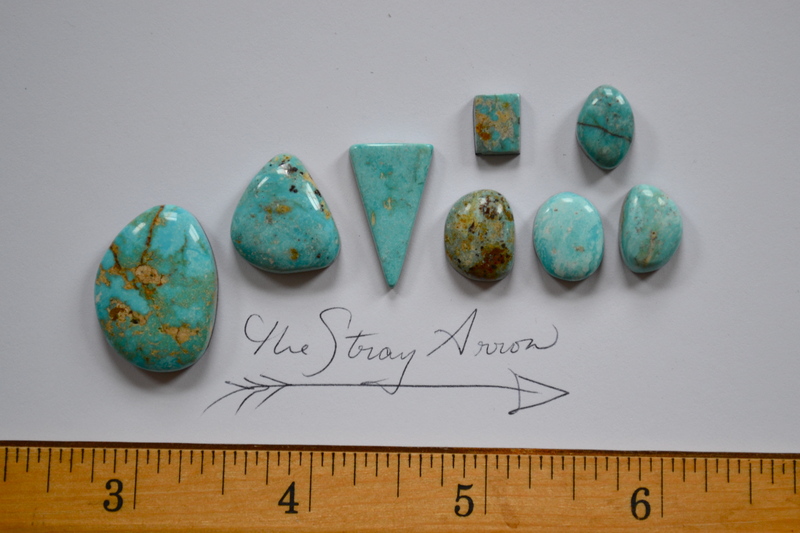 Persia produces a lot of great quality blue turquoise that can also sometimes be seen in Native American Indian jewelry. 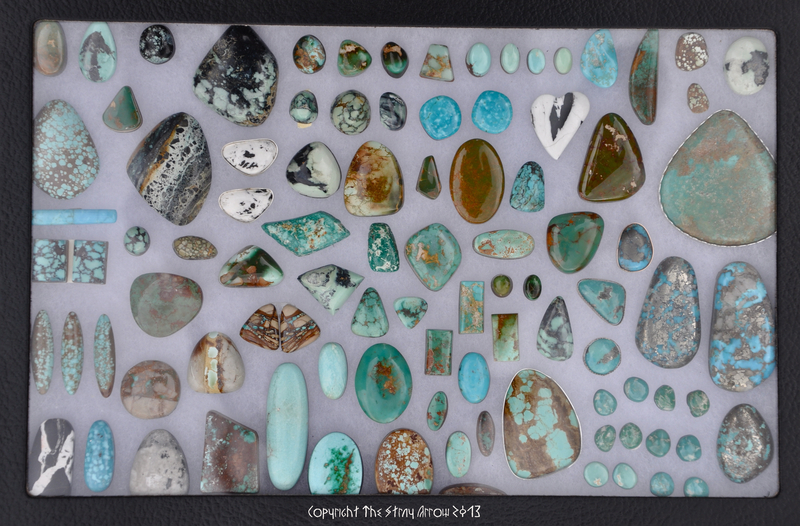 China produces a lot of enhanced or stabilized turquoise, as well as quality turquoise like that of the Hubei Mine. I’m sure there are other “hubs” that produce turquoise, but these are the prominent three I’ve been exposed to constantly while rock roaming. 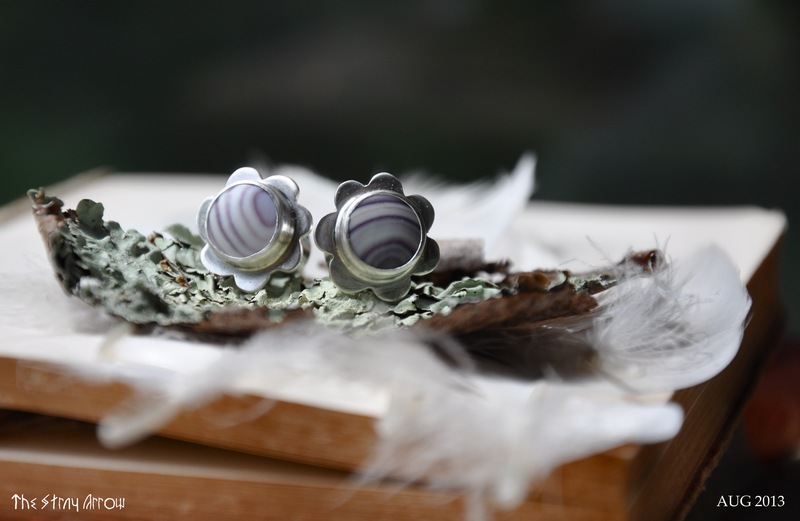 In theory, a mine owner or their employees will sell rough to lapidary artists who then create cabochons or other stone styles from the rough. 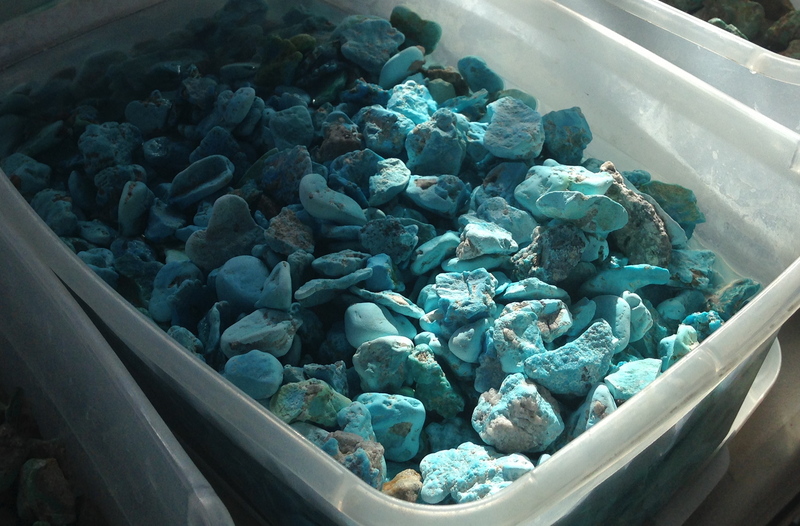 Sometimes a mine will produce turquoise in several stages for sale (rough, slabs, cabs). 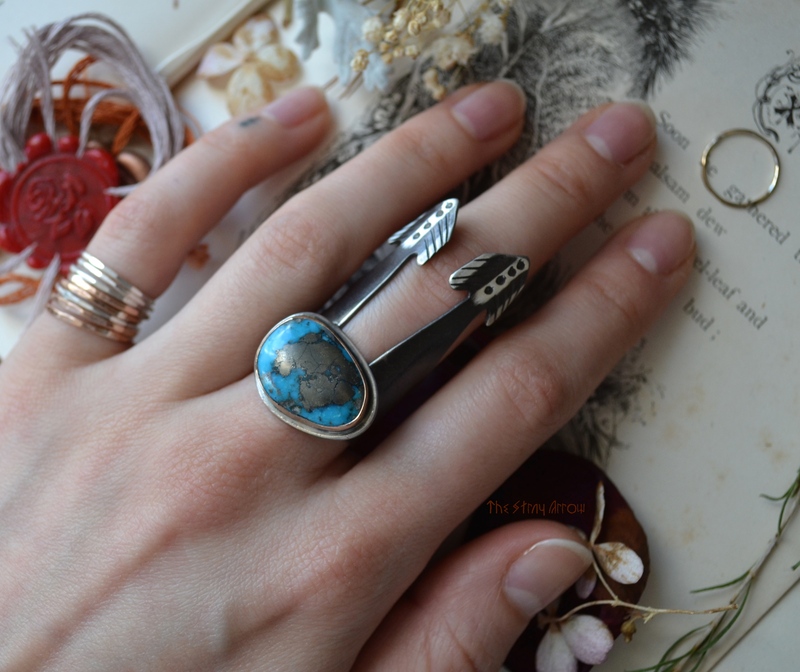 Essentially what it comes down to is it is on the mine owners, operators, employees, buyers, lapidary artists, and any other middle folks between digging the rock out of the earth to the hands of a jeweler to keep the Mine location of the turquoise properly labeled. This is a very hopeful practice. Many people say you can never really know where a stone comes from. I met a man once who could tell you the exact Mine or Mine pit a stone was from just by looking at it. It really depends on how much exposure you have to turquoise, and how close you are to the source. Sometimes a stone origin can be evident if a mine has signature characteristics that NO OTHER MINE HAS. Damele and Lander Blue come to my mind (watch out though! Highly prized Lander Blue is often poorly faked. Anything that isn’t sold for hundreds a carat ain’t real folks). Mines that are really close in location and colour qualities are harder. For instance Crow Springs, Ajax, Royston, and Pilot Mountain mines can be confused very easily. 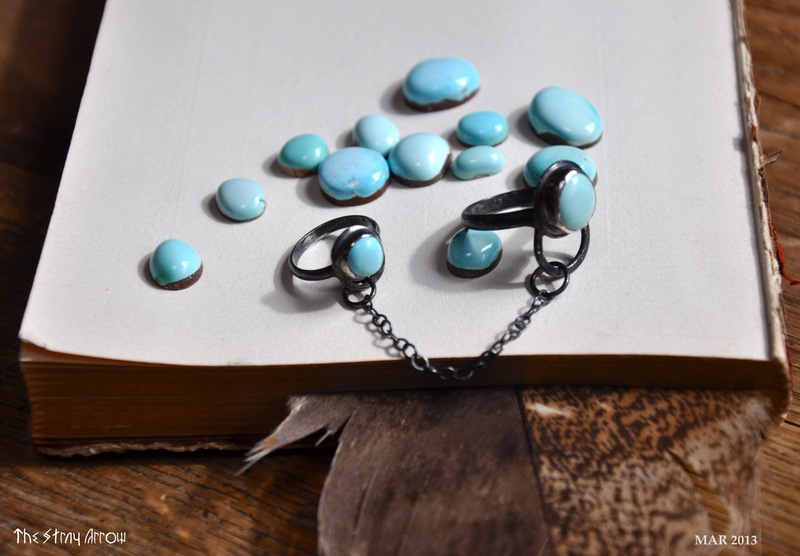 While most stones are only graded in quality based on the condition of the stone, turquoise also factors in location and colour. Colour is always subjective. Back in the day deep saturated blues were considered prized. Solid colours were considered higher quality. 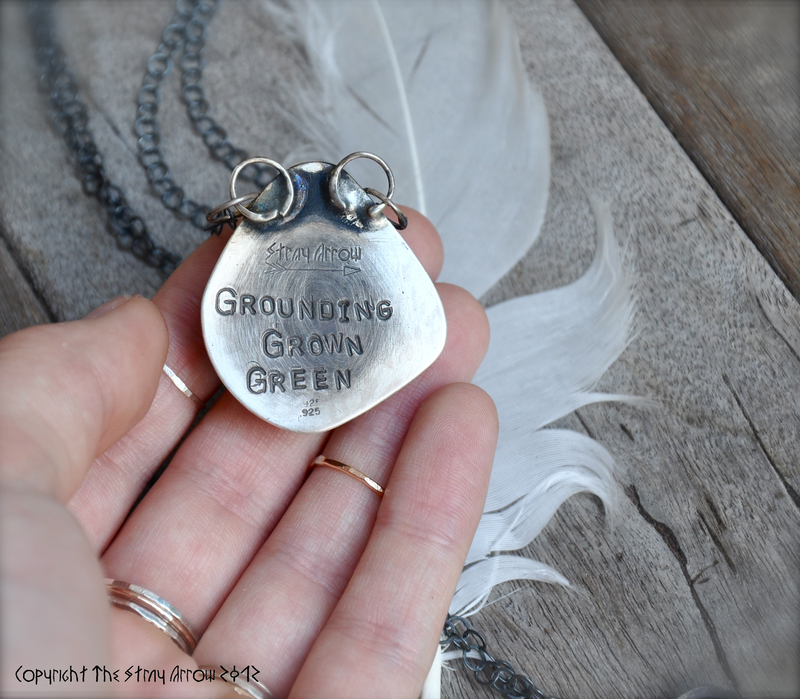 Nowadays pale blues, deep greens, and everything in between has become collectible. 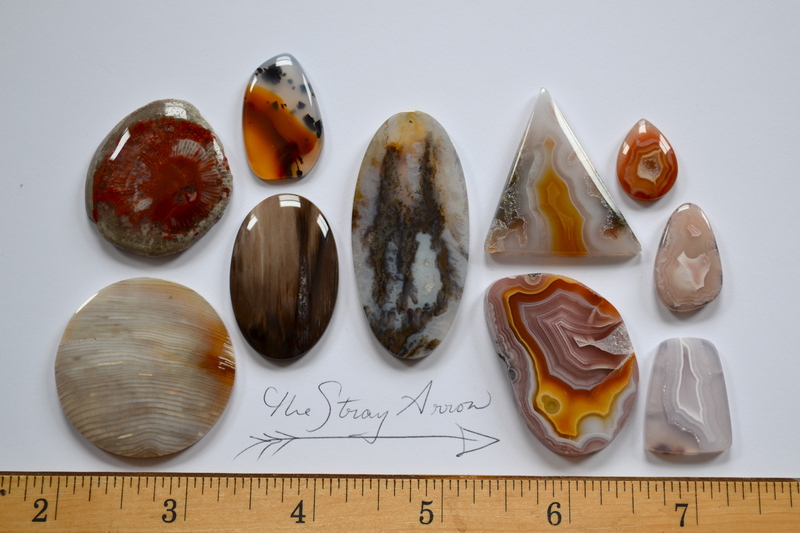 Patterns make for more unique stones, and unique stones are always more sought after. No matter what, a mainstay in quality is spider-webbed turquoise. A clear webbing pattern is always the highest quality. What I look for in colour is uniqueness and chroma/saturation. 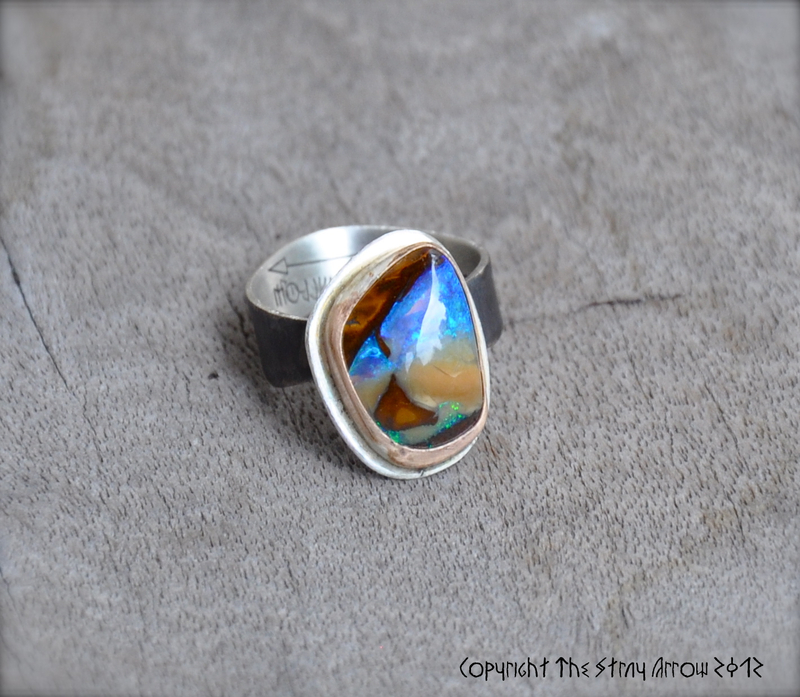 The deeper colour of the stone the better in my book. Different hues, like mixed blues and greens, are also a hit. 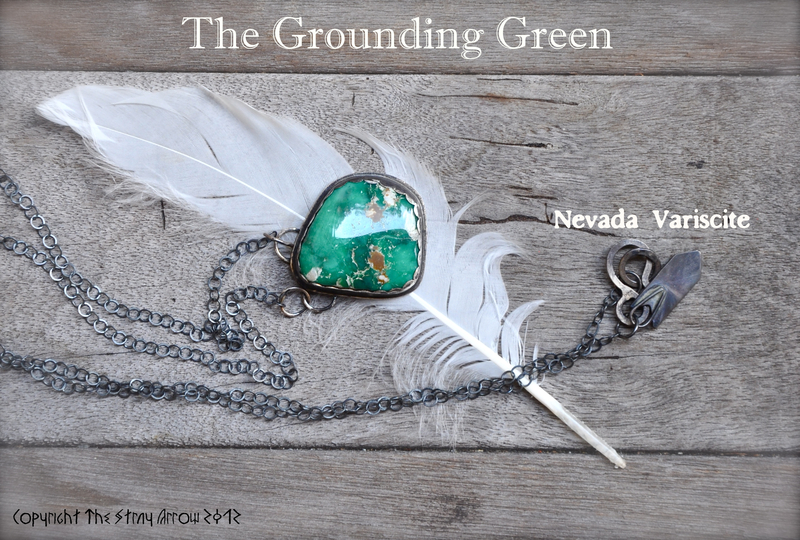 I veer towards the collectible “military greens” often seen in Manassa, Blue Gem, and Royston turquoise. Rare hues are also what I cherish, as I’m a bit of a colour nerd. Anything topographical or “earthy” I’ll jump on. 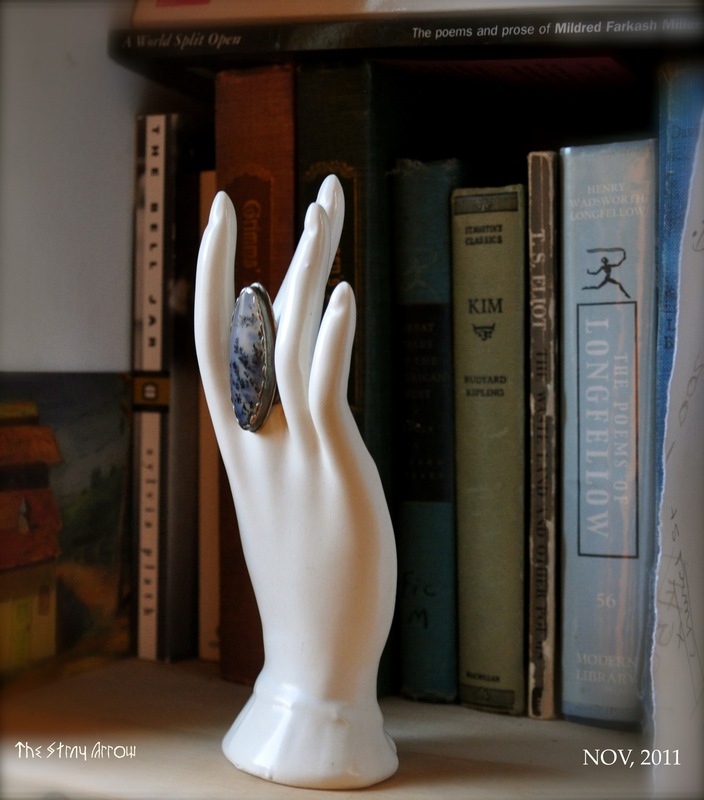 Pale blues can also be beautiful, especially the “white turquoise” of mines like Dry Creek. Any kind of webbing, boulder cut, or water web is always special and a bit harder to come by. If a colour looks “chalky”, or less saturated, I’ll personally consider it lower quality. 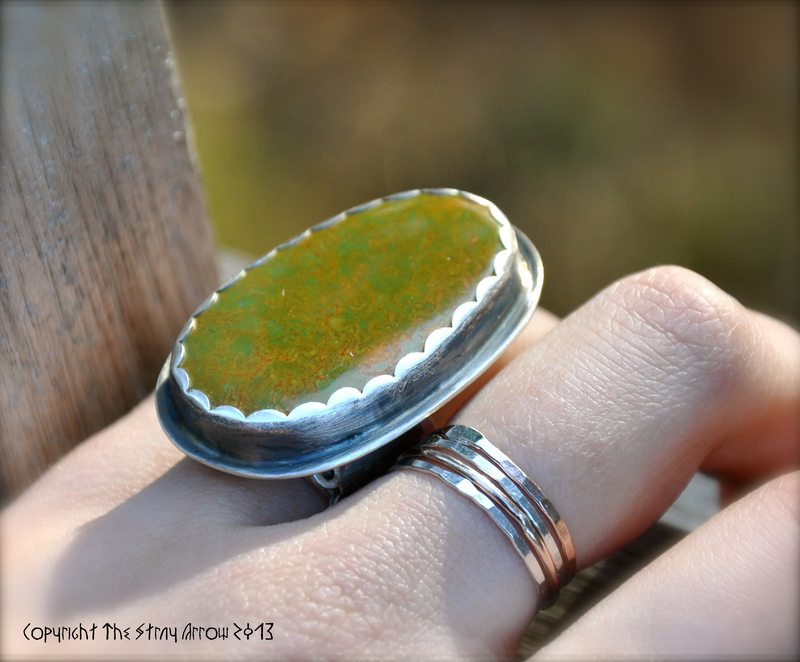 An example of this is two different rings I made in the same “Green Grasses” theme. 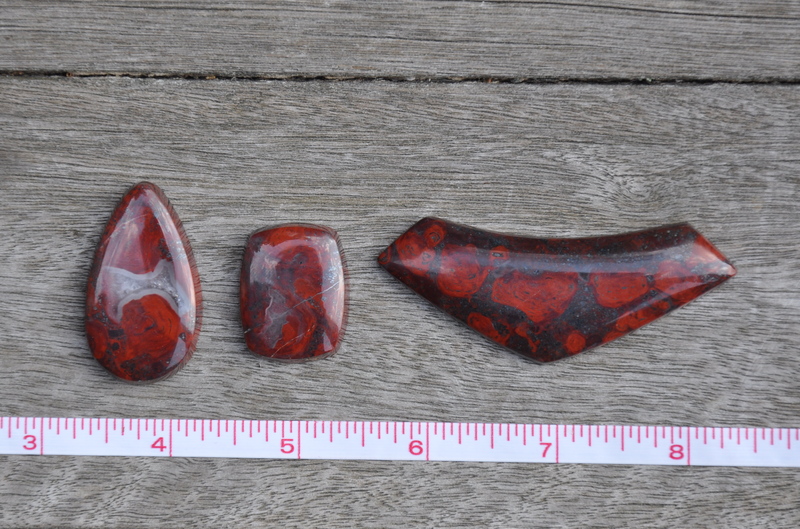 Both cabs were natural from the Crow Springs Mine. 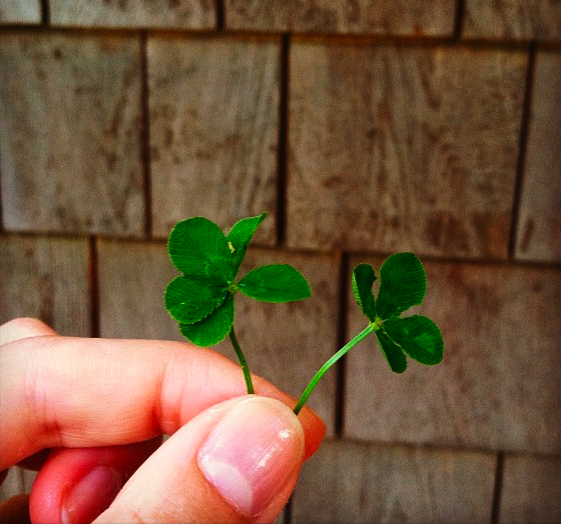 One is a deeper green and I considered that to be more prized. 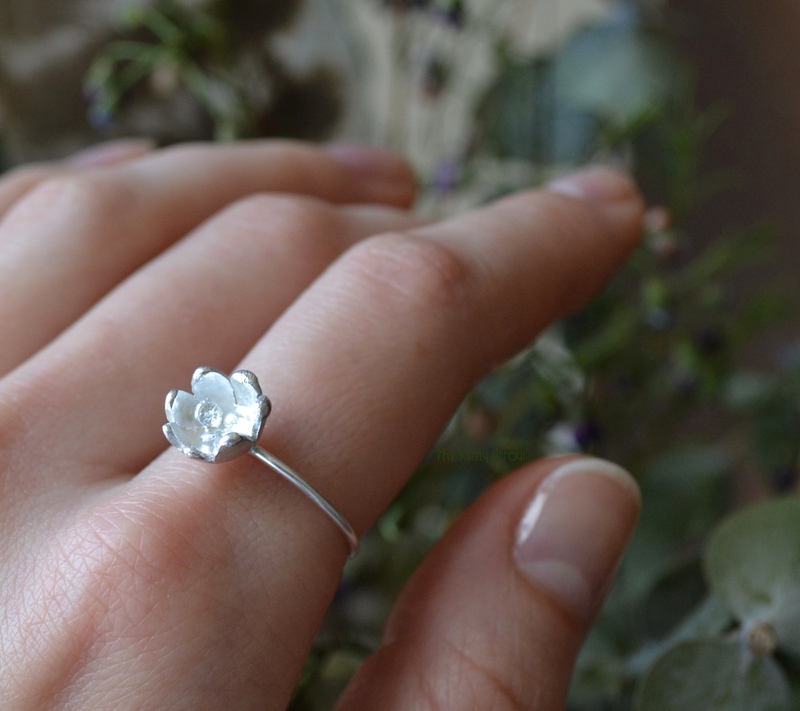 The highest quality stones are natural. Always. 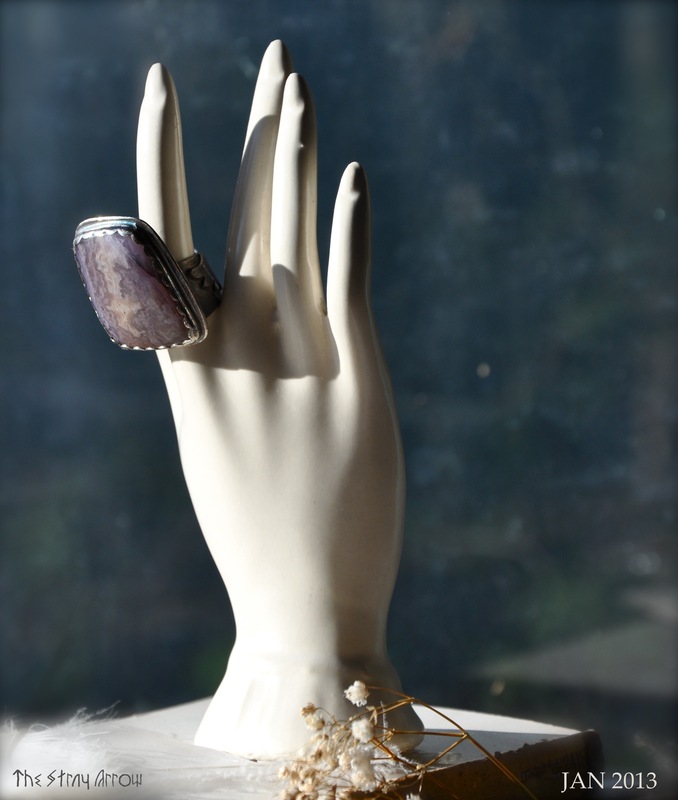 Natural stones are often, but not always backed or mounted. If a stone is too soft it is often stabilized or enhanced in some way. 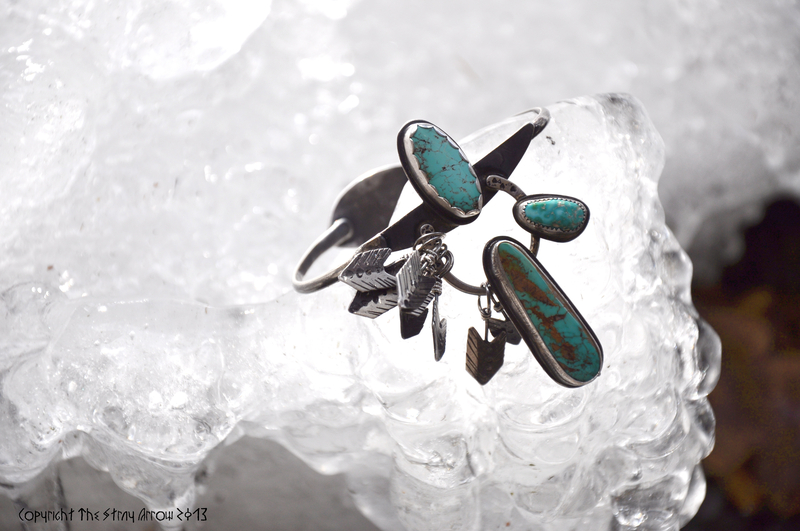 High Grade natural turquoise is a small percentage of turquoise produced from a mine that is hard and can take a good polish. There are always exceptions based on location. 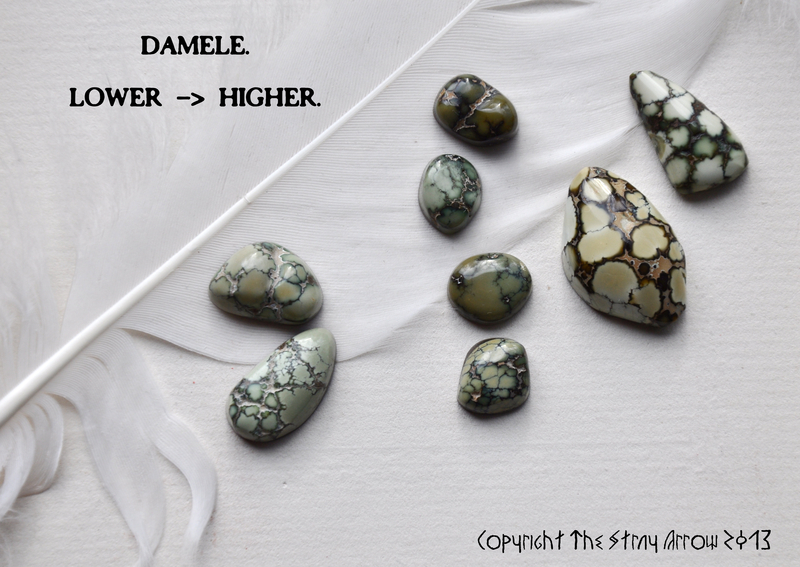 For example a webbed Damele turquoise with one or two chips may be prized more than a hard, high polished Kingman mine stone. There is always subjective compromise based on location, pattern, and colouring. The general consensus is natural>treated every time. The difficult part for many is being able to tell when a stone is enhanced in any way. For me, I think stabilized stones look dulled out and more plastic like. While it is done to strengthen and brighten colour, the overall appearance is waxy and too high polished to be believable. Then again, there really is no way of knowing unless you know and trust the source or get it professionally tested. 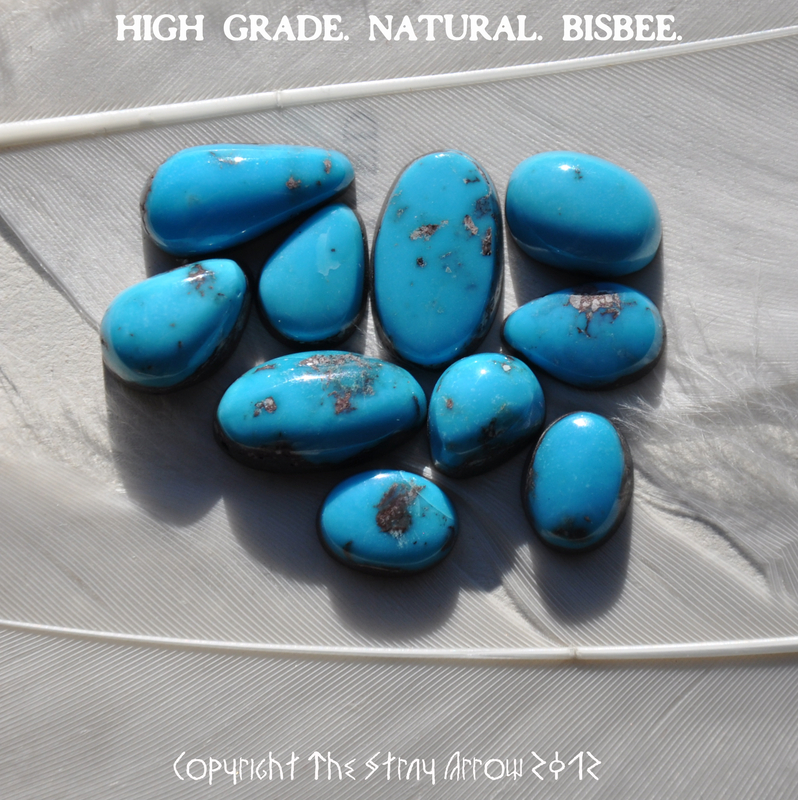 The highest grades of turquoise will be either the perfect hue (robin’s egg blue), spider-webbed, water-webbed, birds eye, include pyrite, fossils, dendrites, or be extremely rare based on mine location. 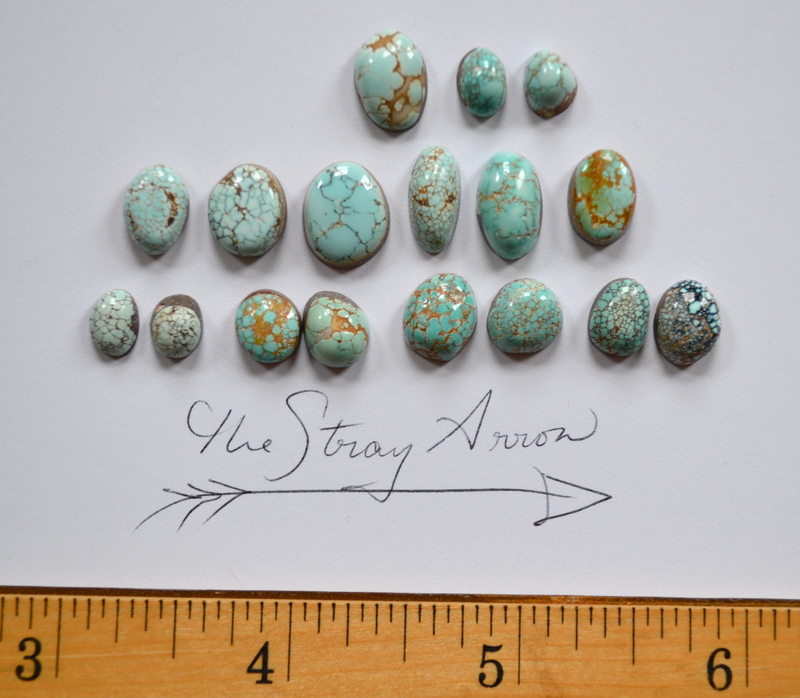 Few are able to obtain and use turquoise of this grade and it is what I would consider to be “museum” or top quality. 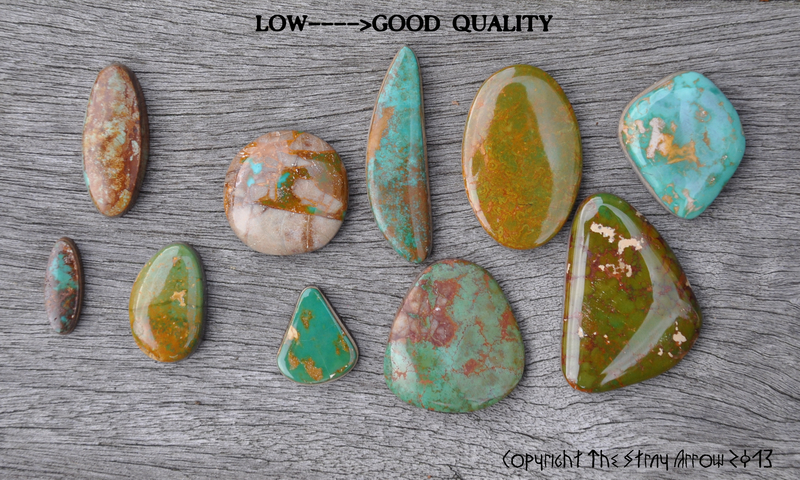 Any of these types of turquoise that aren’t extremely hard, cut well, and polished I would consider to be “good/decent” quality. 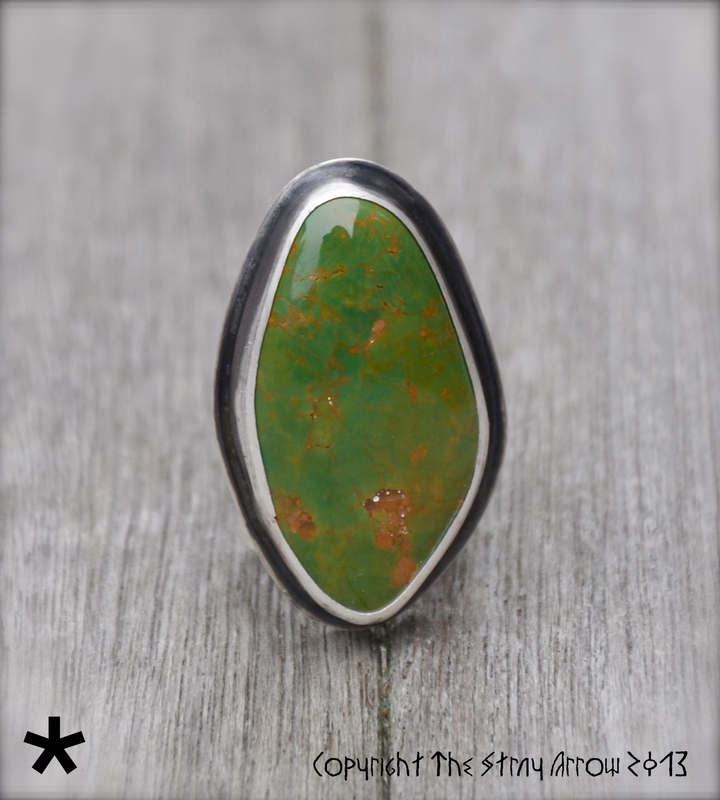 Natural turquoise that is a jewelry standard usually features one solid colour or decent matrix. 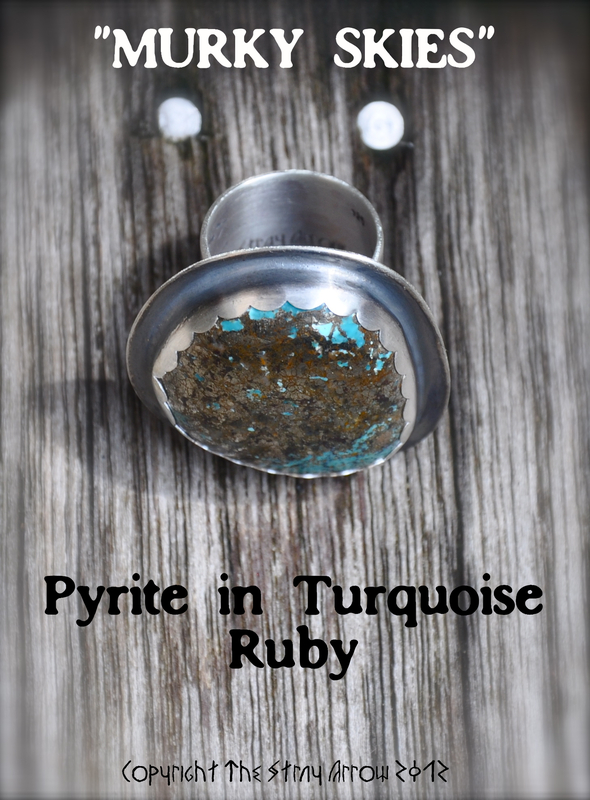 I prize turquoise with pyrite, tight spider and water webs, and rare mines. 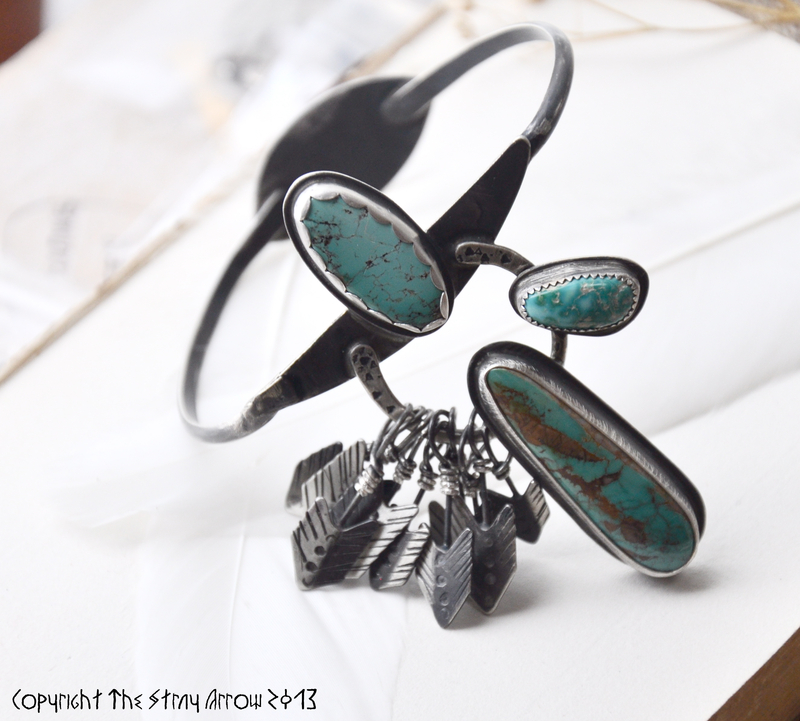 A three star (***) system will be seen displayed with each piece of jewelry I create involving turquoise. 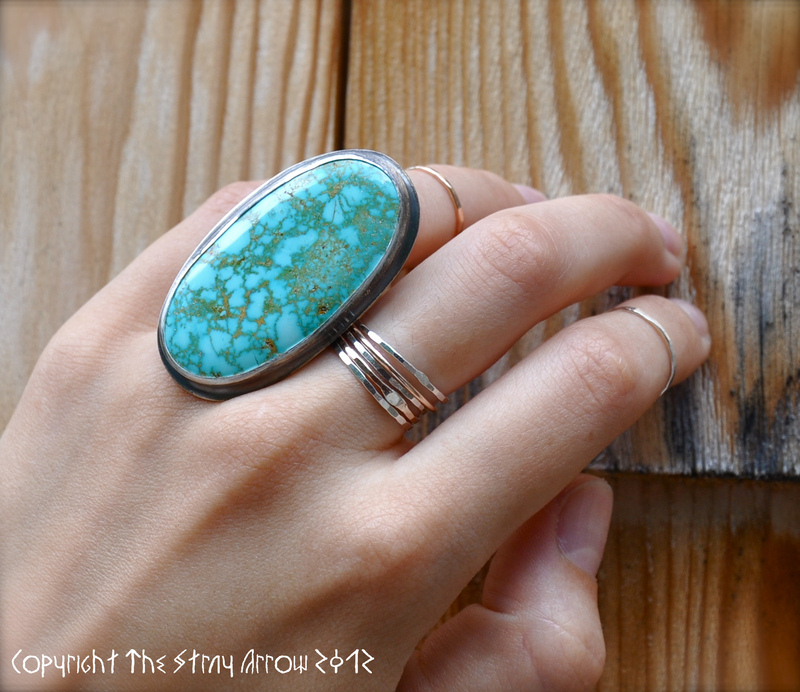 A single star will encompass the majority of turquoise used. To the best of my knowledge, this will always be natural turquoise. One star will stand for wholesale to decent grade turquoise. 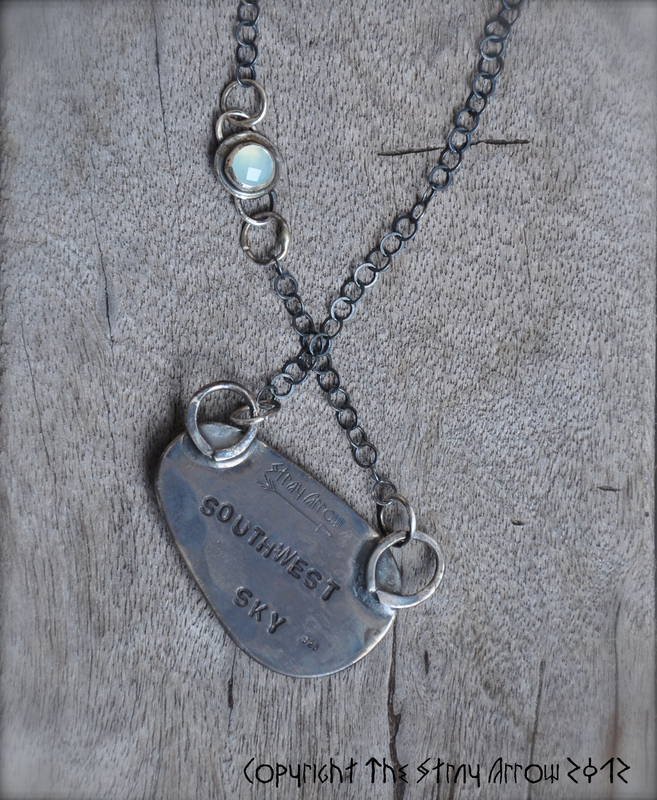 Two stars will stand for higher grade turquoise or rarer mines. 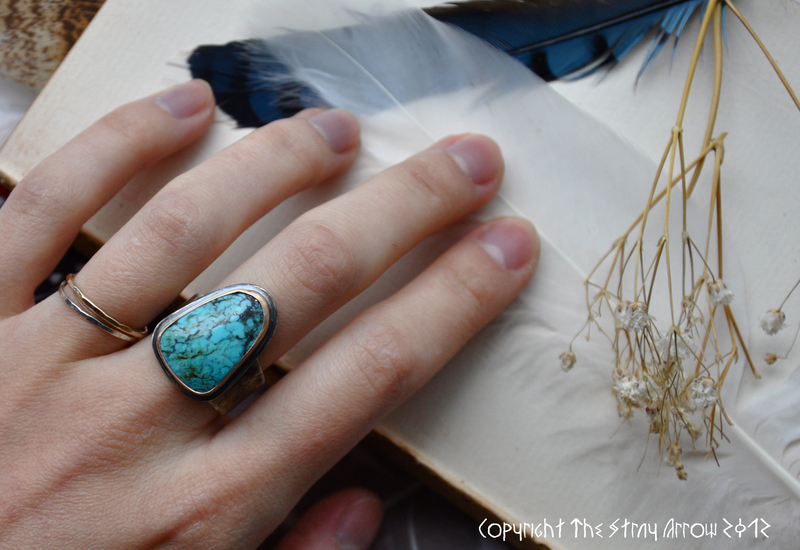 Three stars will rarely be seen and reserved solely for my best top-notch turquoise stones collected and used. 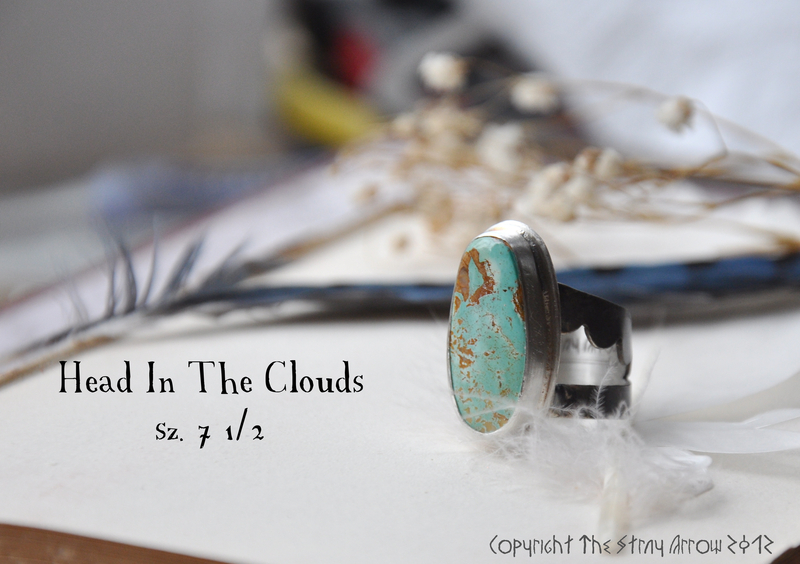 These stars will appear at the bottom left corner of the first photo for every Etsy turquoise listing from now on. 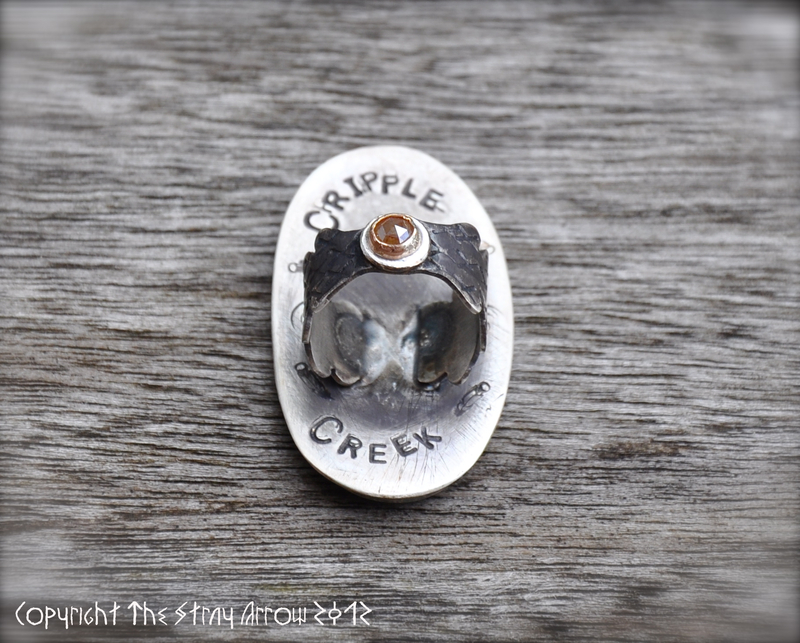 The star shown is how I will be grading the stone in the jewelry piece. If you see a stone and fall in love, but it is low quality-it doesn’t matter! Anything has the potential for beauty. This guide is merely to inspire confidence in any customer, to establish price points, and for sharing information. I care about what I use, produce, and offer to people. There’s nothing better than someone enjoying something I’ve created. 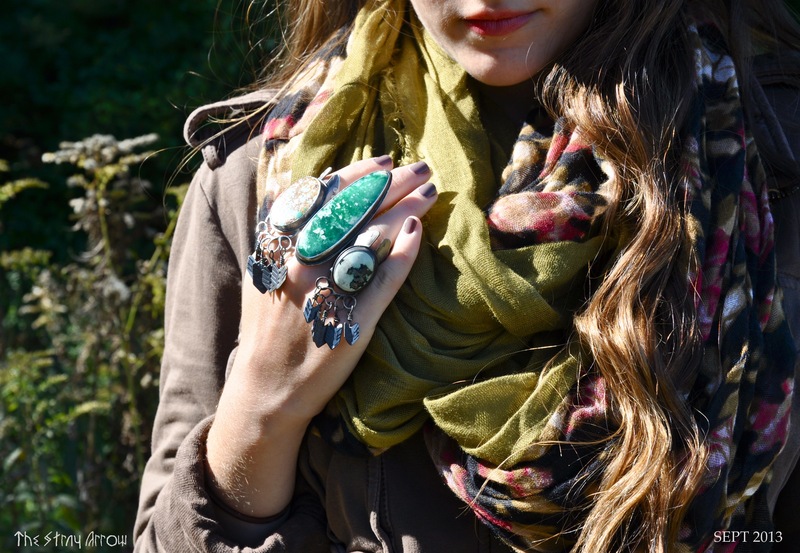 I love turquoise, and I want you to love it as well. 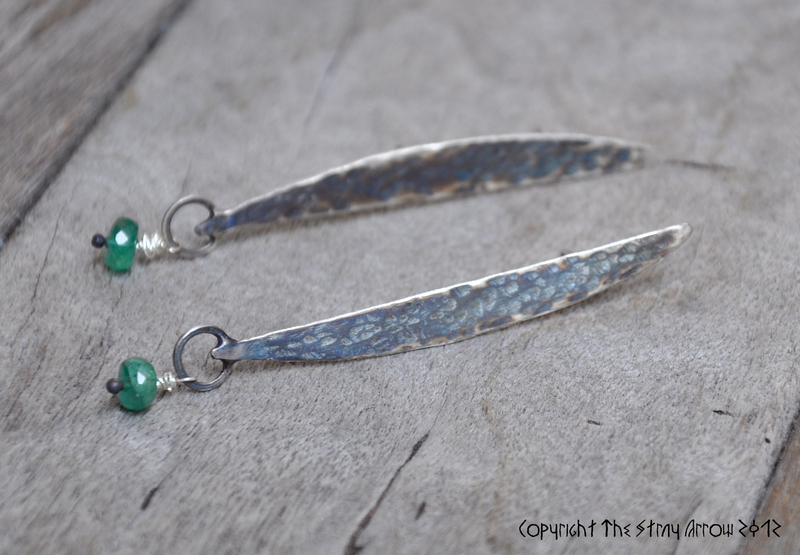 Sometimes I also use rough, uncut, or unpolished turquoise. These stones will also be graded with one star. 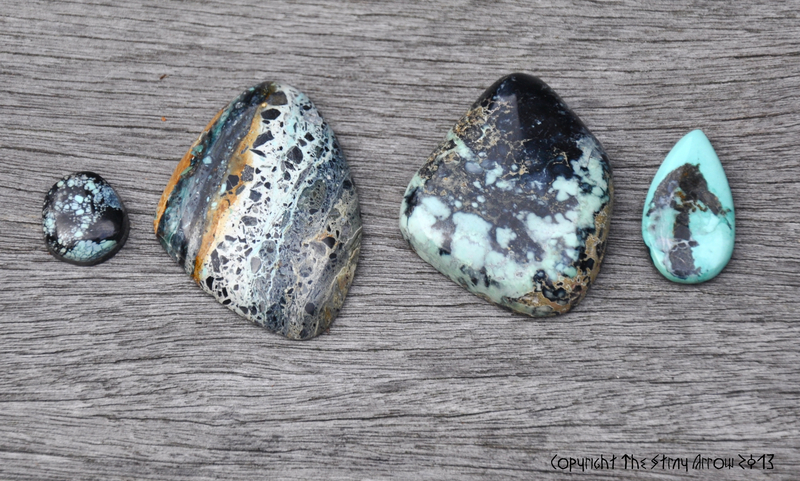 I use these because of either where they come from, the colour, or just because they are really, really cool rocks. 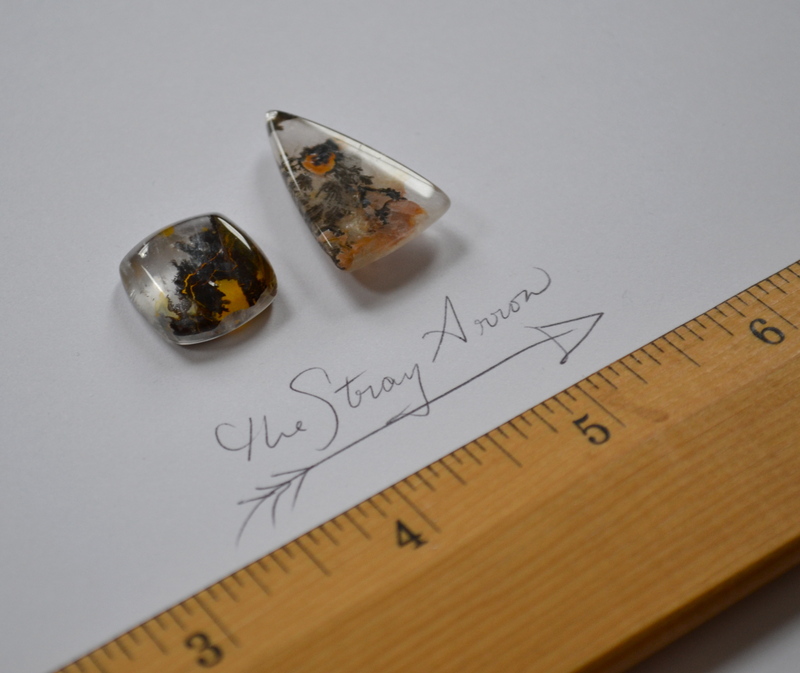 I love the thought of the process they go through coming out of the earth, and capturing it in an early stage for jewelry use is exciting. 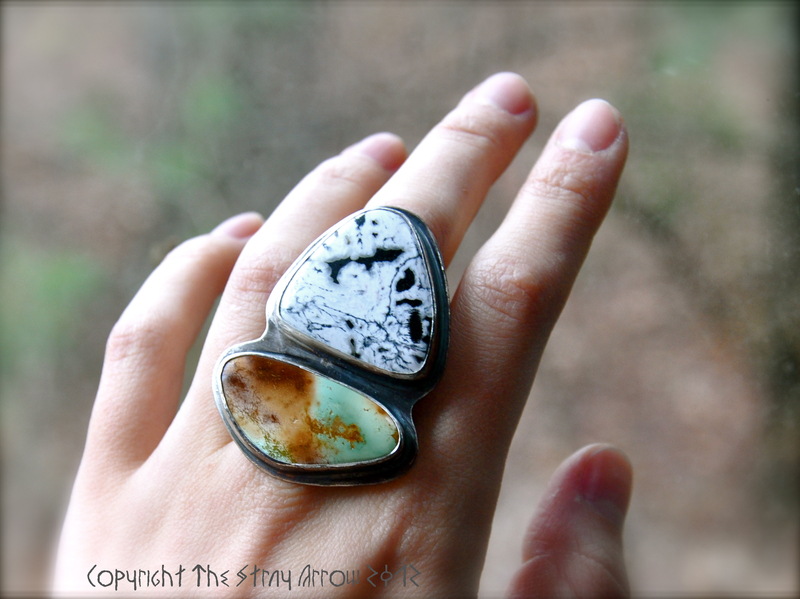 Sometimes I will actually snag and use a turquoise stone when I do not know, or am not sure of the mine. 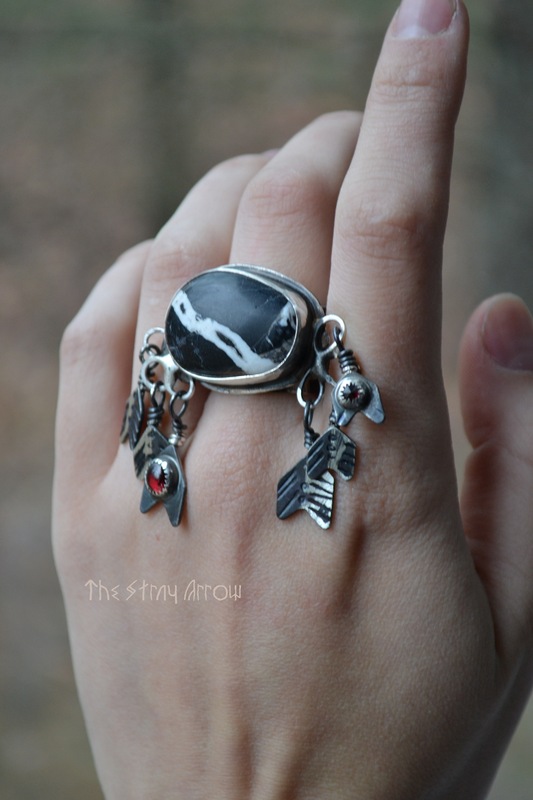 This may be because the stone is obviously of amazing quality, or because I just think it’s darn nifty. A stone is a stone, after all. 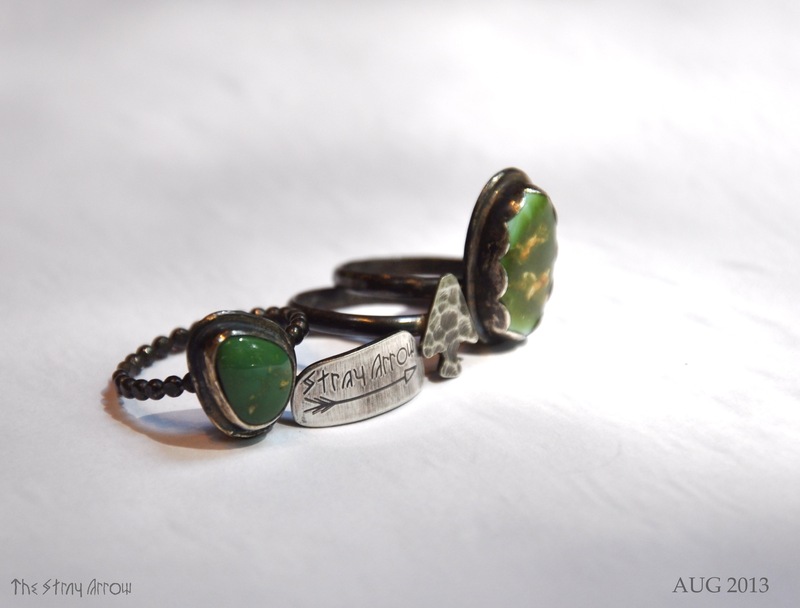 When you buy jewelry, from me or any other jeweler or place out there, make sure people tell you what you’re getting! 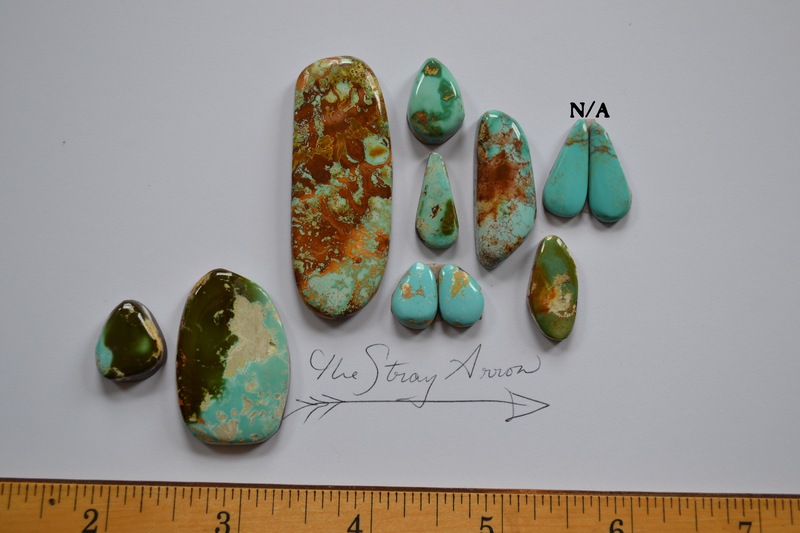 If the “main stone” of a piece is listed as Sleeping Beauty mine, do NOT assume this covers any other turquoise stones in that piece that are not identified. 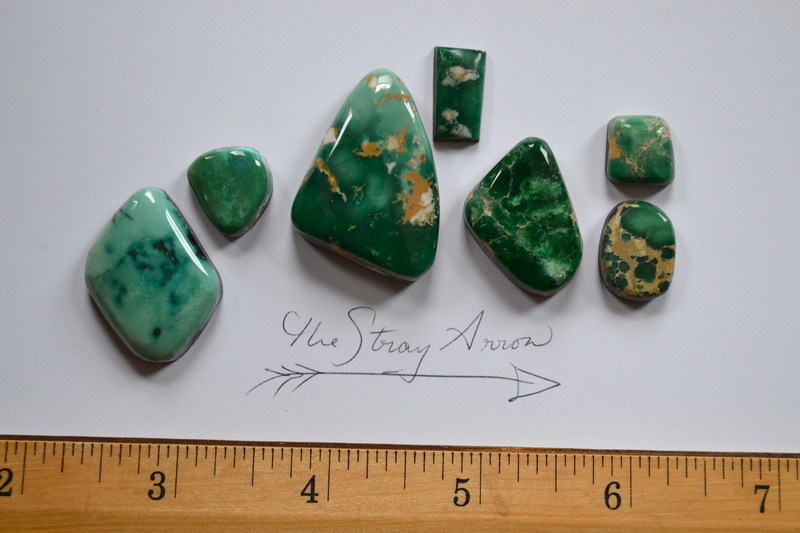 I’ve seen this a lot where someone will use one nice stone, and surround it by cheap stabilized Chinese turquoise. If they don’t know where it’s from, they should tell you. 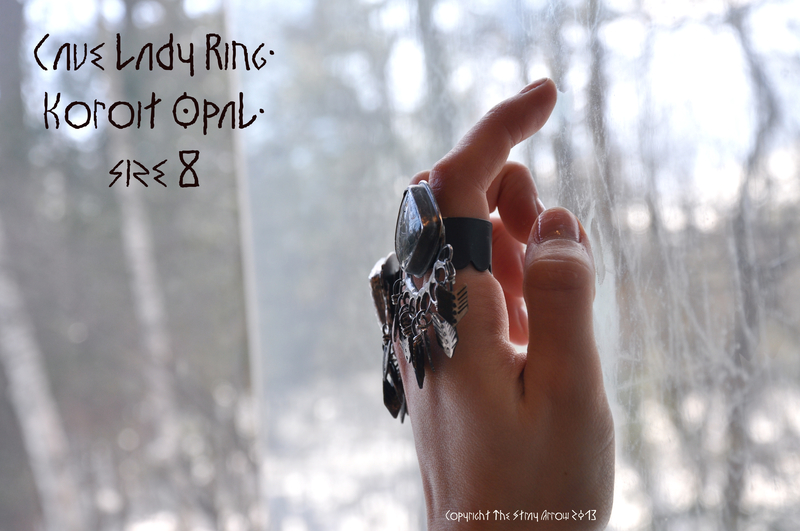 It may or may not lessen the personal value you project towards that jewelry piece, but you should have all the facts. Most people do not know the mines of the stones they use, and it should not take away from the piece unless you’re aiming to collect a mine. Secondly, all sides of what you are planning to buy should be seen. Sometimes there is a limit to how many photos of each item a seller can post depending on the selling platform. If I do not post a picture of the back of an item, it is usually because of this reason or lack of detailing on the back. Never hesitate to ask for more photos from anyone to see all views. If the price is too good to be true, it usually is. 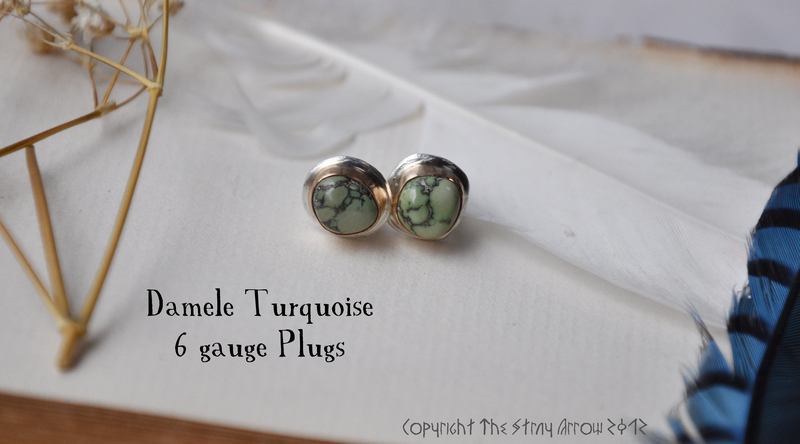 Rare turquoise is RARE, and thus expensive. Once a mine is depleted, all that is left is uncut rough or old stock cab collections on the market to be used. 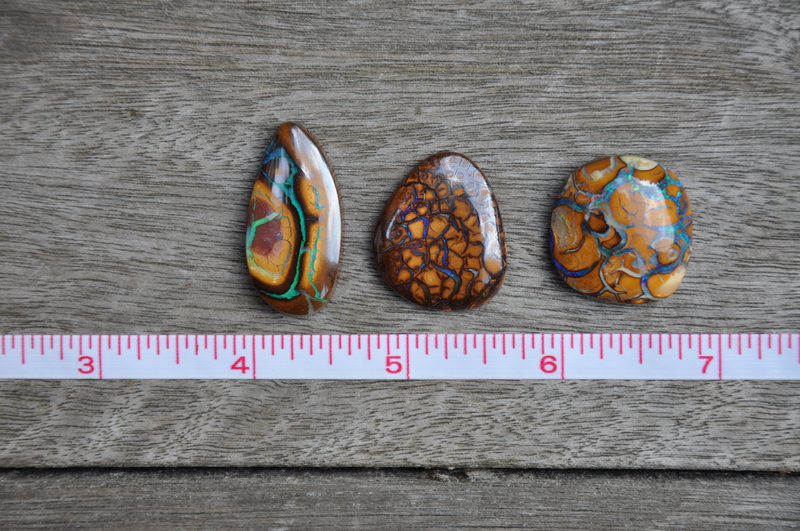 If someone is selling “natural”, “rare” turquoise, or anything from a specific mine, at a low cost, they are either not making any money or being dishonest. 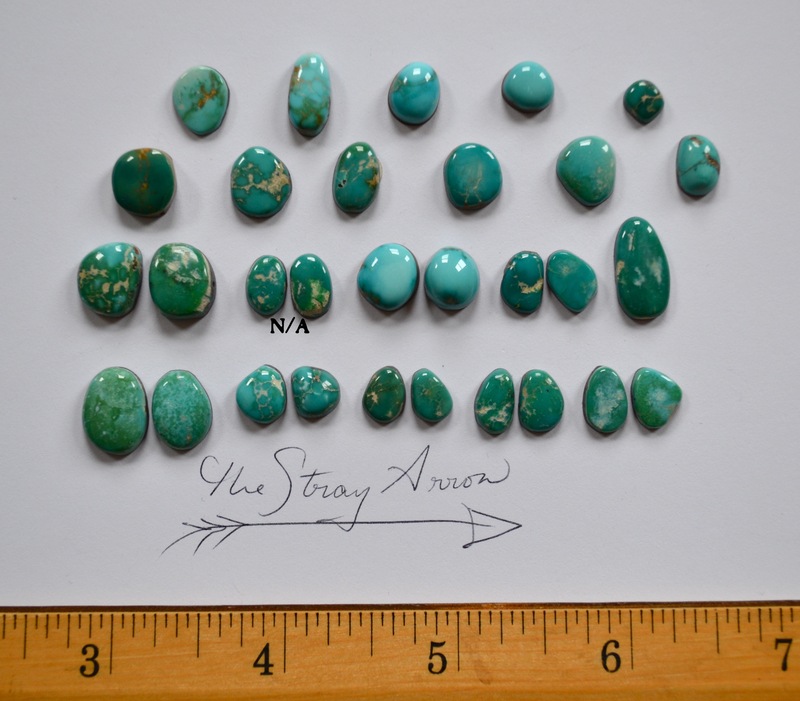 My particular prices are extremely fair for what the turquoise stones themselves alone retail for, or cost for collectors. I have worked for several years to search out reputable and trustworthy sources. 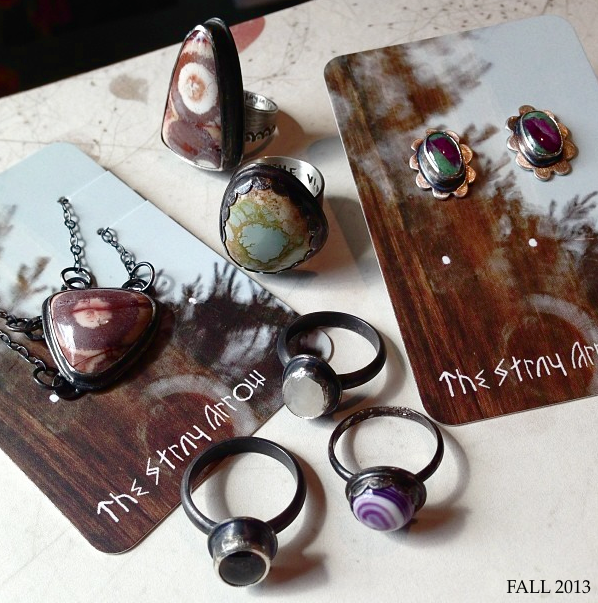 If you have a questions about a stone used in my jewelry, feel free to ask. If you have any questions about any of my work, never hesitate to ask me. Be nice though, and remember we’re all human. 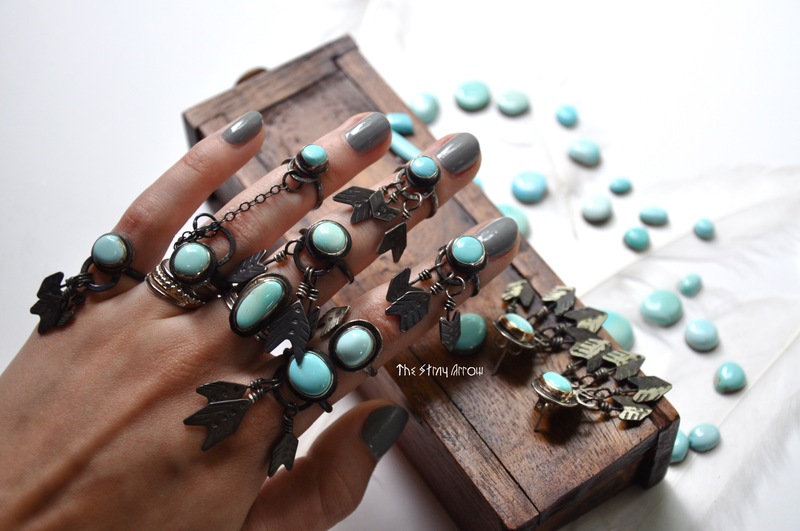 TURQUOISE EXAMPLES & TURQUOISE IN JEWELRY EXAMPLES. 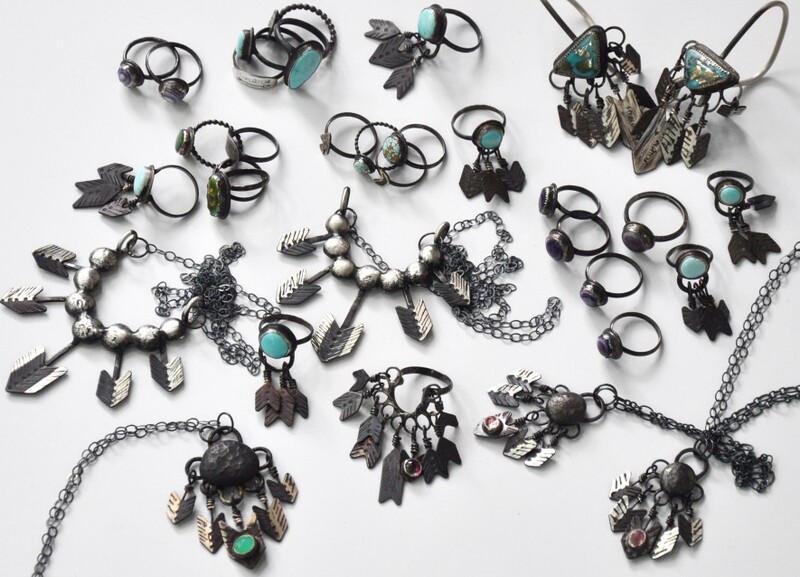 ^these are rough cabs from the Crow Springs mine. 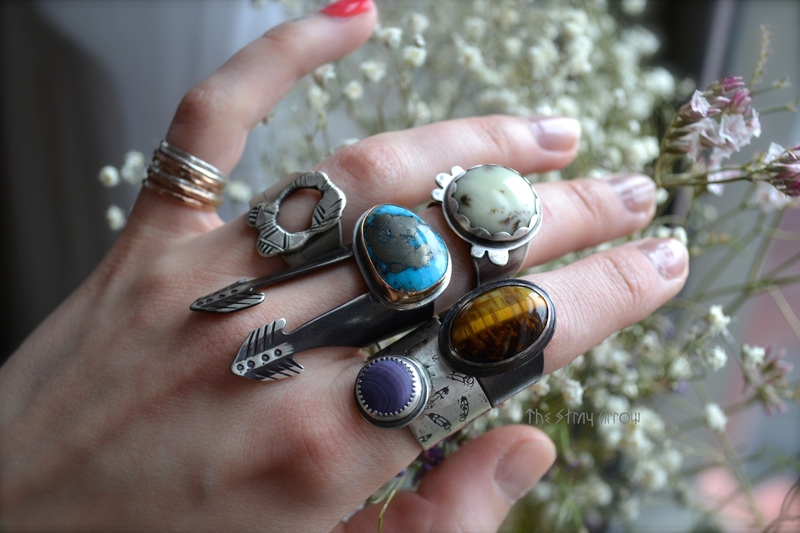 I would not use them in my jewelry but collect them because I like rocks and think they’re nifty. ^These four all look similar but are from different mines. 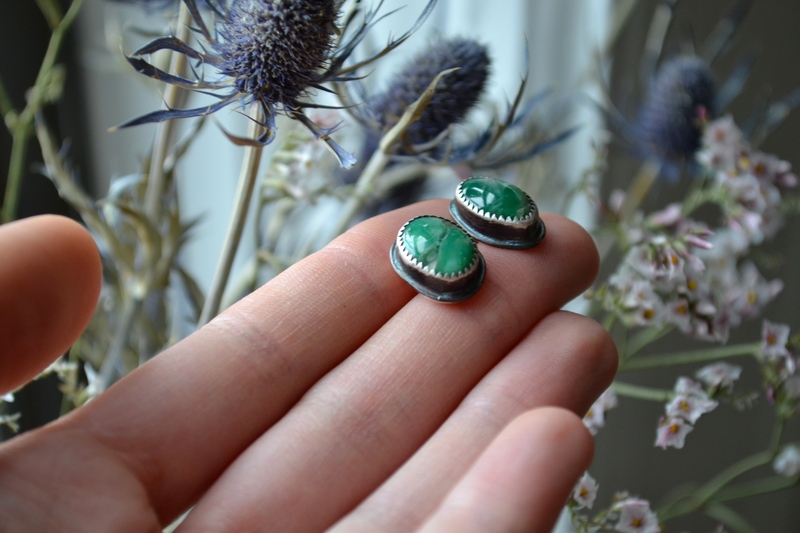 ^these little Manassa post earrings are of decent quality and have a lot of beautiful teeny patterning, hue, and chroma variations. 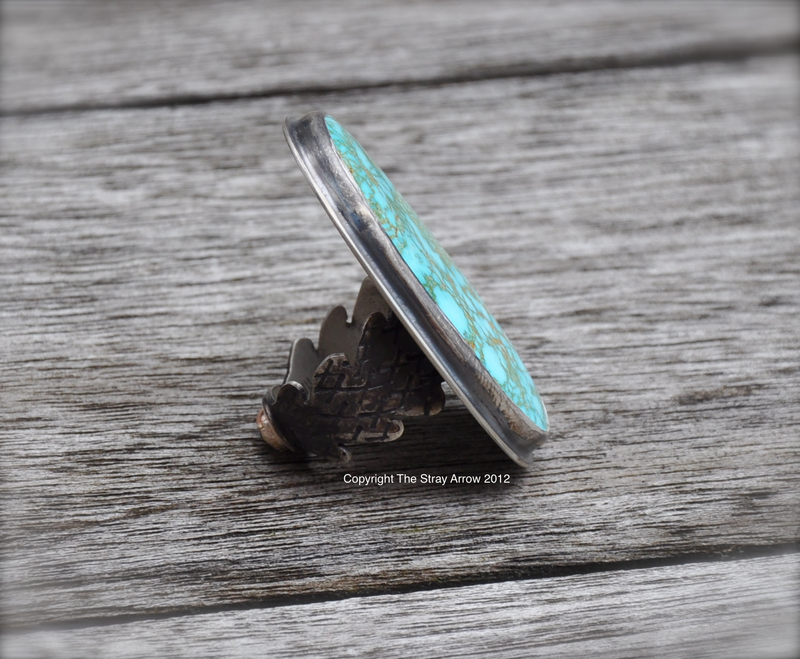 ^custom 1″ Manassa Mine plugs with solid and ribbon cut turquoise. 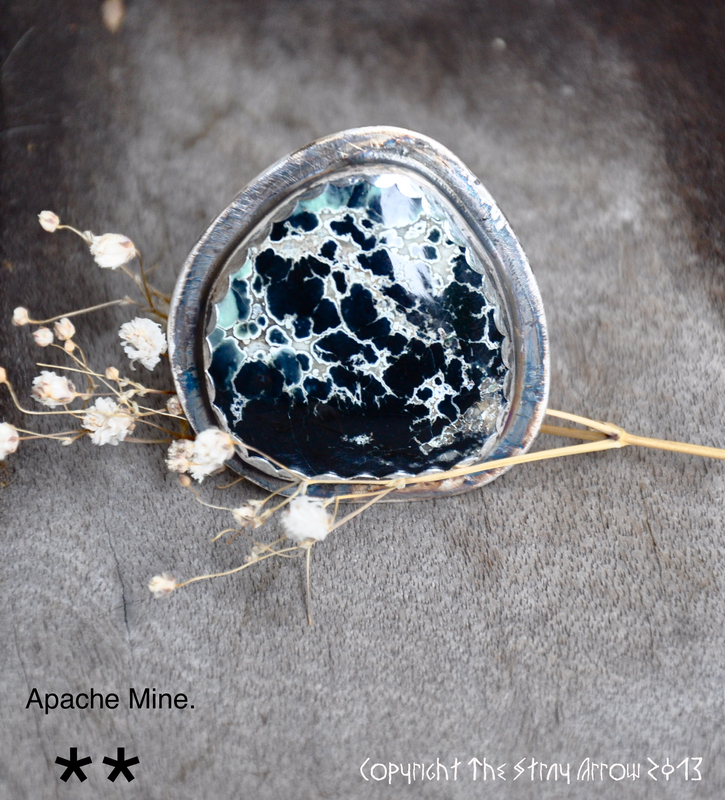 ^while the Mine is unknown, this is natural, webbed, Southwestern turquoise. ^certain Mines, like a lot of Kingman Ithaca Peak, are actually popular in this more “nugget like” form. They are collected this way and still prove of great quality. ^this last one is unknown, Kingman mine is usually more blue as seen in the two previous. 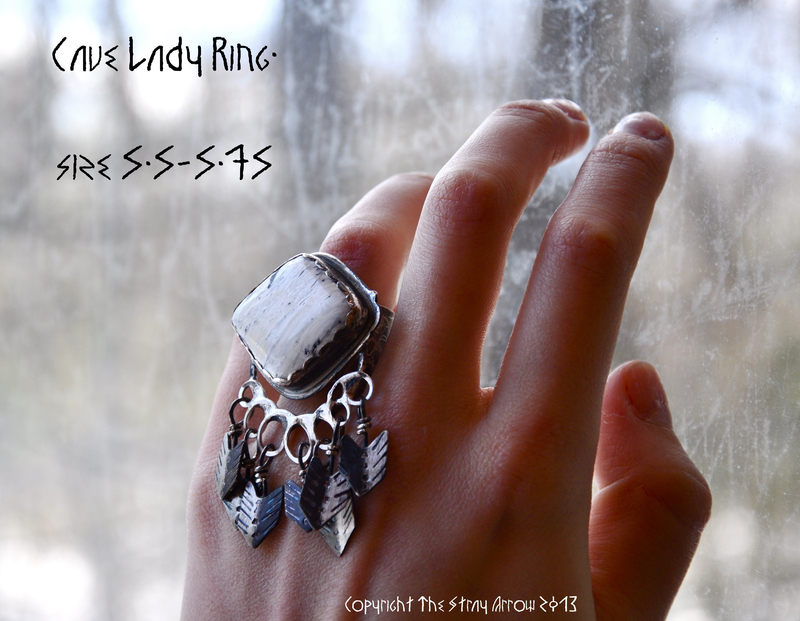 ^lower quality White Buffalo- this ring is one of my personal pieces i made for myself. 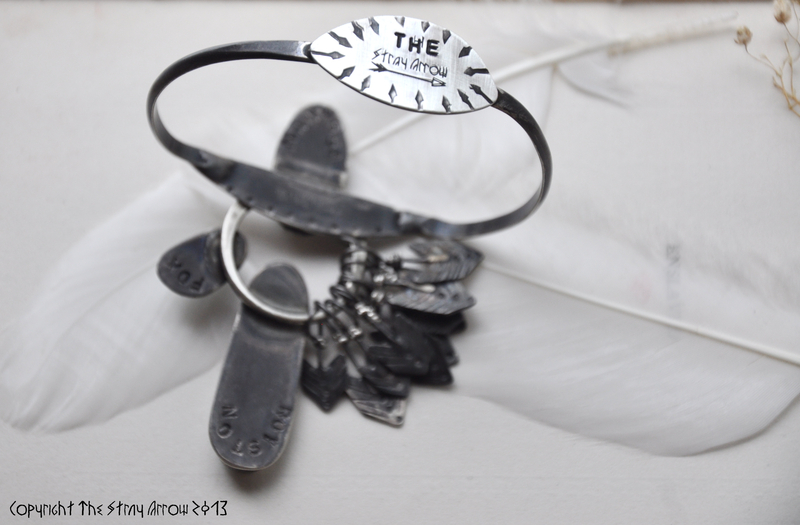 ^custom Buffalo&Crow cuff, with White Buffalo ribbon cut. 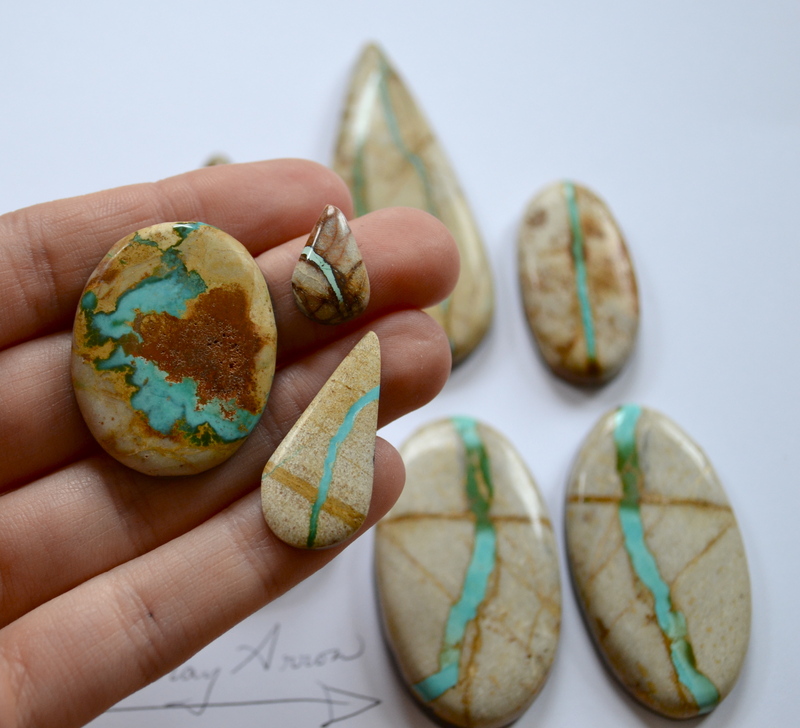 Ribbon cut and boulder turquoise is automatically considered a little lower in quality simply because there is less turquoise involved and more host rock. 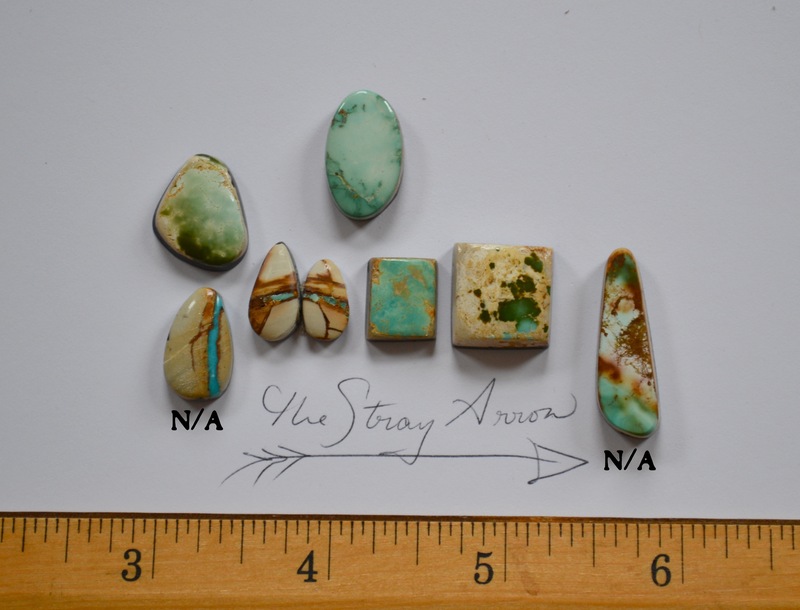 These types have become collectible in their own right for contrast between the turquoise and host rock, and patterning. 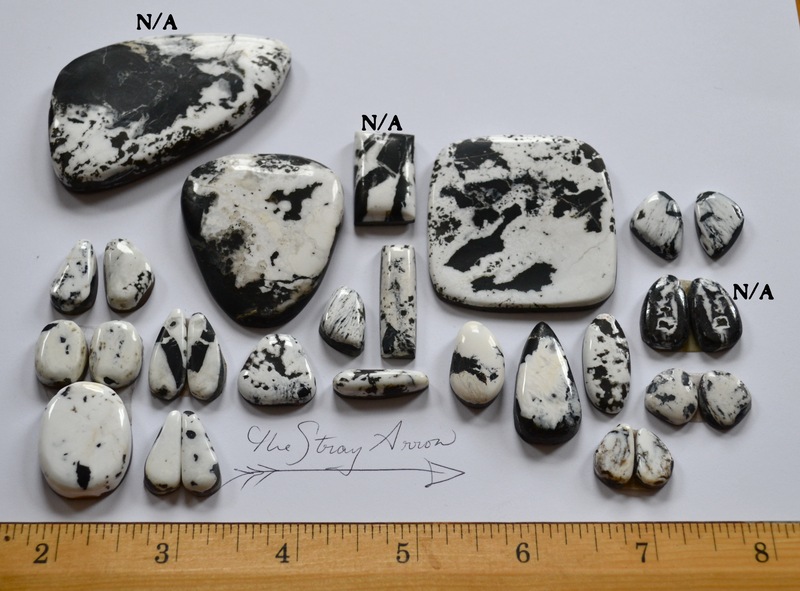 ^high quality White Buffalo, with smooth even polish, hard surface, and clarity between the white and black chert host rock matrix. As always, feel free to message me with any questions, concerns, etc. *these are my own notes from years of study and research. Copyrighted by Stasia Salvucci 2013. Please do not quote or use without permission. 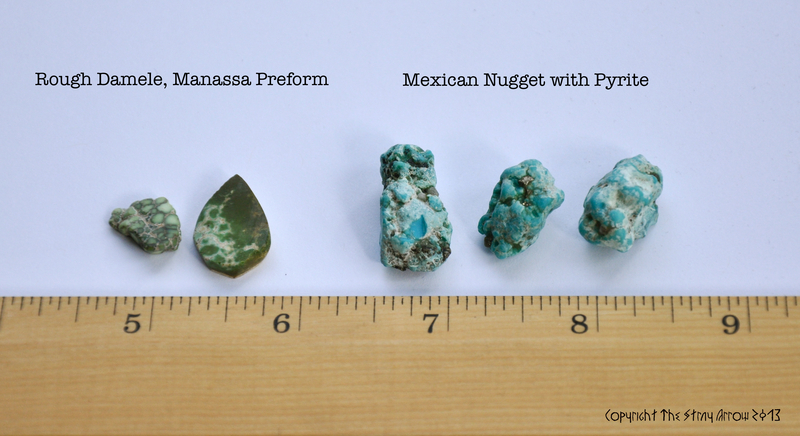 In replacement of the monthly “Rock Appreciation Day”, I have been working on a Turquoise Guide post. 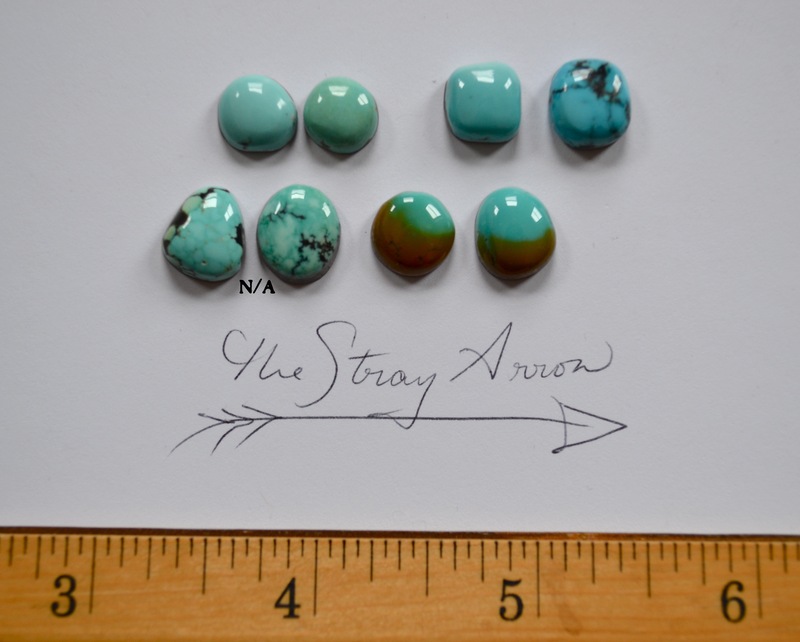 This will be for any turquoise enthusiasts, but primarily for customers to see examples and know exactly what they’re getting-whether it be Stray Arrow Jewelry or from elsewhere. 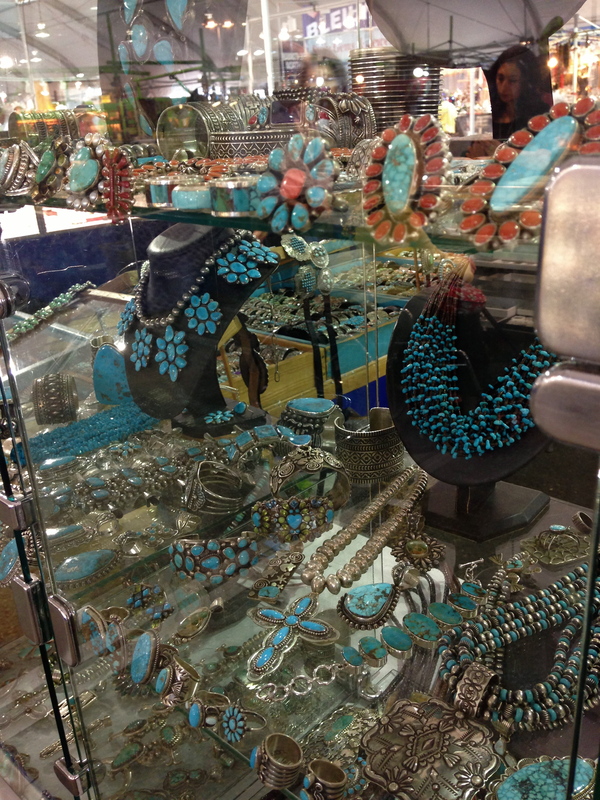 There is a lot of turquoise jewelry out there-as there should be! 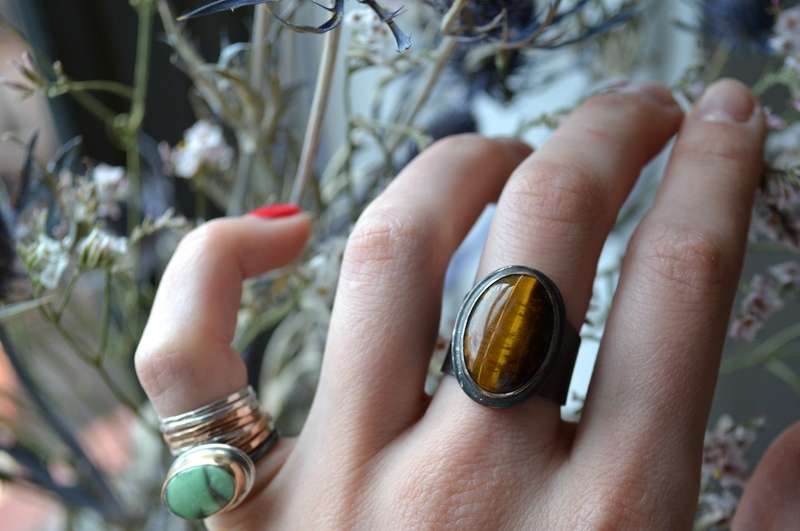 It’s an amazing stone with so many lovely variations. Unfortunately, it is often misrepresented, not labeled at all, or people just don’t know enough to know what they’re looking at. This identification stuff can get pretty tricky, after all. Even mine owners and lapidary artists can fight about where a stone came from, and the more time has passed the harder it is to tell. 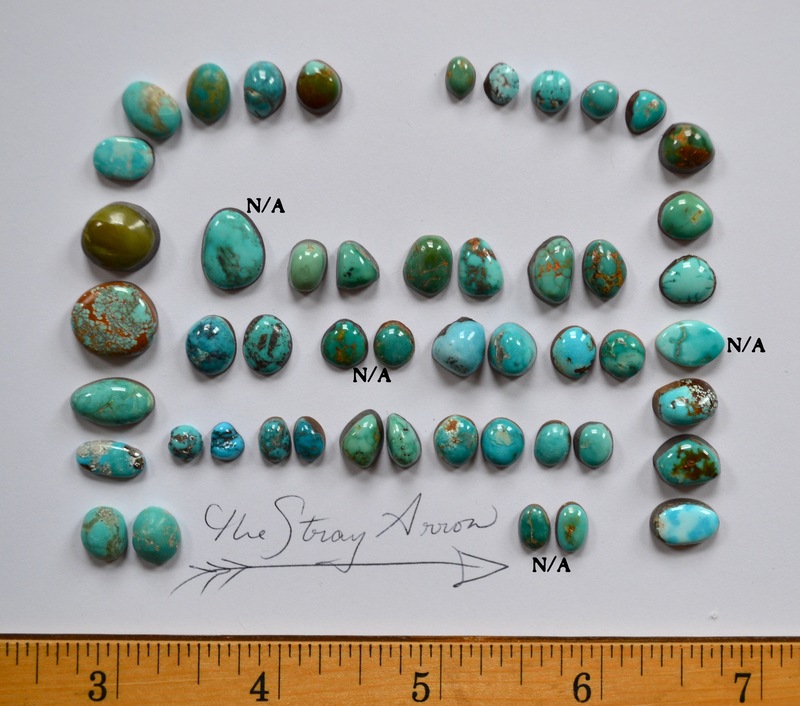 So, the information I will be giving you is how *I* pick the turquoise I use. Specific concerns that factor into stone selection. The post will cover: natural vs stabilized, location characteristics, and first and foremost quality. I’ll have examples from very low quality to museum quality. 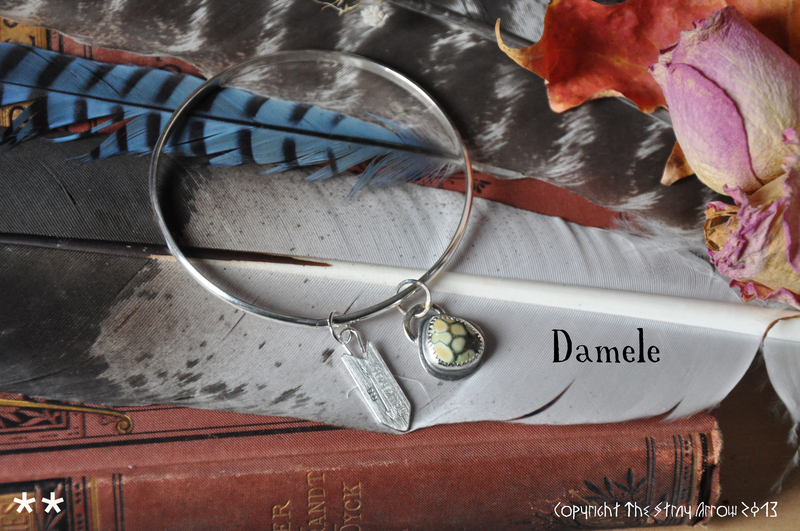 created by me for use only within my shops, for my pieces. This will consist of a three star system, and be at the top of every single turquoise listing I create. I’ll stand by it so you know what you’re getting, and can have confidence in your purchased treasures. Because this is going to be extremely extensive, please allow me one more day to finish it! 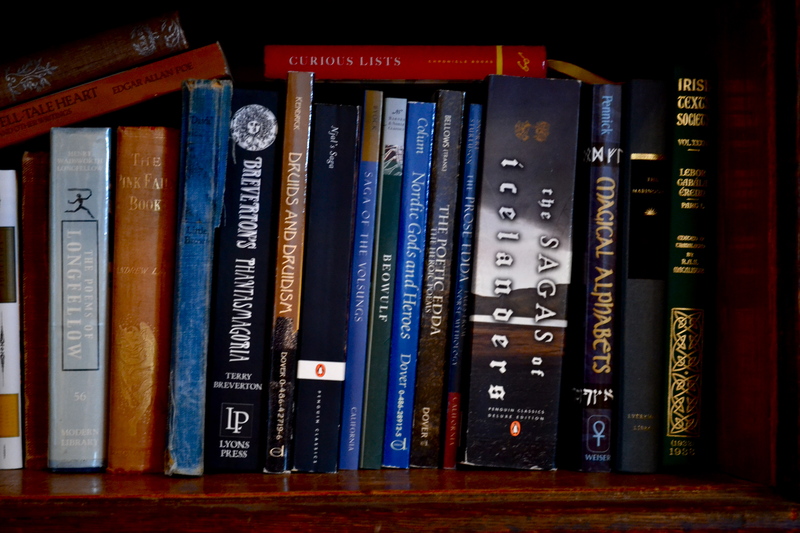 All of the examples are coming straight out of my own Treasure Chest from my collection. The post will be published tomorrow night and used as a reference point from then on. 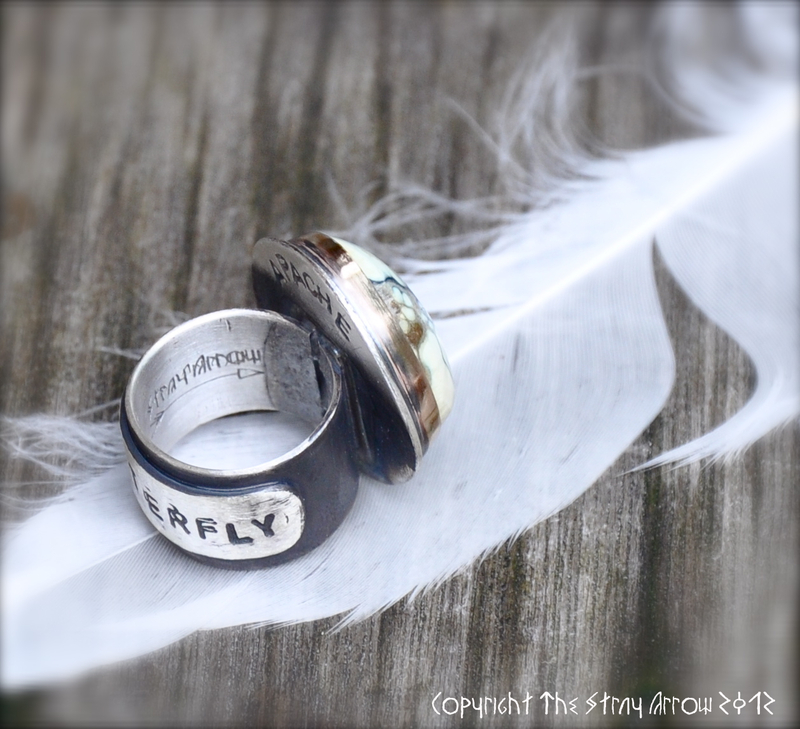 These goodies will be added to both Etsy shops tonight and tomorrow. And now, a new favourite. That’s it folks! 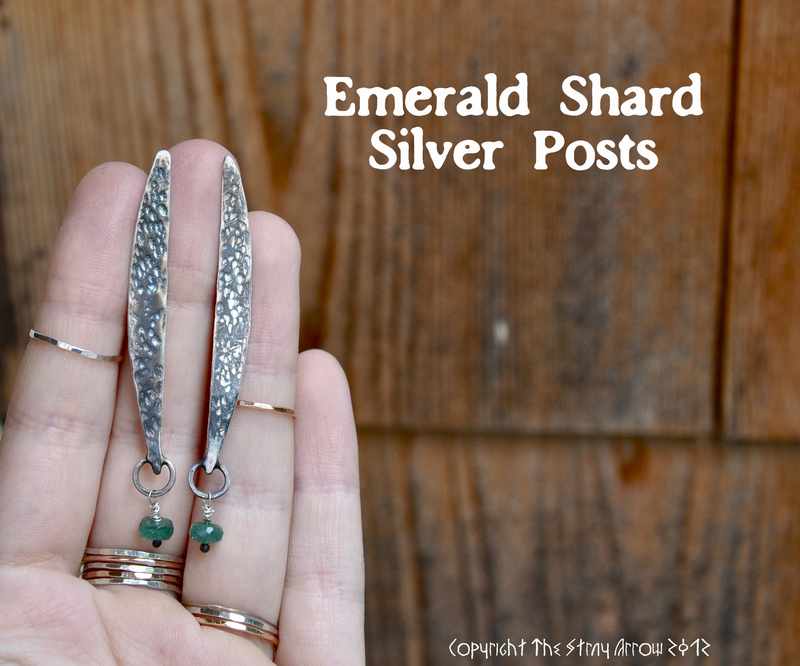 Check out the shops later on~Don’t forget Holiday shopping deadlines! It has been a little while since my last post, and I’ve had some amazing travels. It has also been raining the past few days, and I have been loving it. This is going to be a fairly long post. 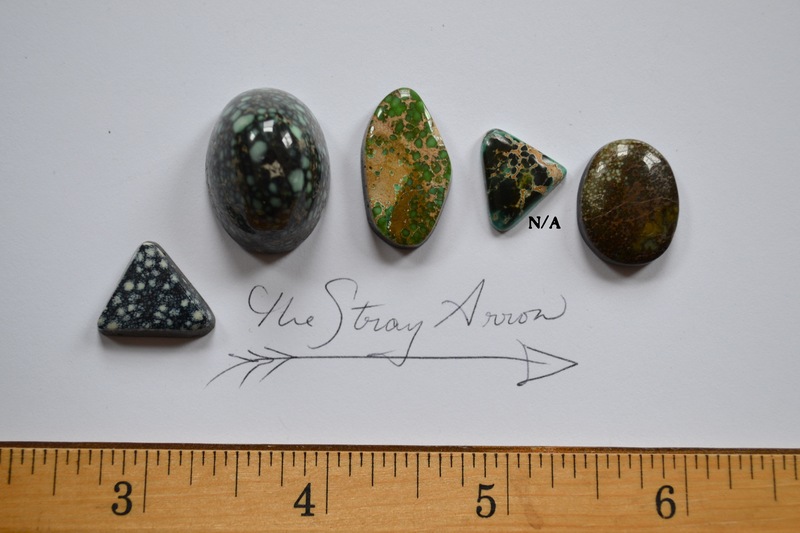 I have news to share, recent custom orders to show you, new pieces that’ll be added to the main Etsy shop tomorrow and Tuesday, as well as new stones! I’ve traveled before and left the Etsy shops open, but then it is never a true vacation. I always feel the need to respond to conversations immediately or think about all the sold items to wrap when I return. So, last week, I switched both shops to vacation mode. Thank you all for bearing with me! For all those who don’t know, I love to drive. I mean truly. If I am behind the wheel, I’ll go anywhere. I spent around 23 hours driving in a span of 6 days and it was AMAZING. Thanks to my friend, who never asked to take the wheel. We drove all around the New England and Tri-State areas following one band around. Who needs a fancy vacation when you have good music? 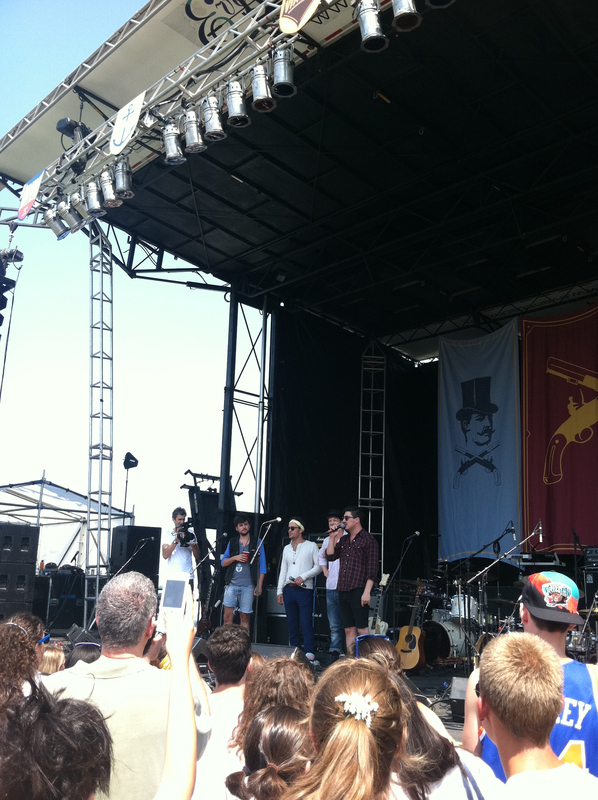 We spent all of Saturday at their festival in Portland, ME listening to new bands, and songs of other’s we could sing along with. 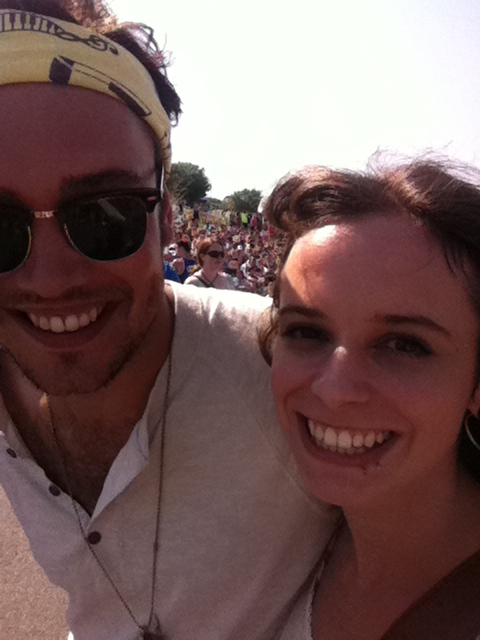 Through heat stroke, blistered feet, frizzy hair, hot and humid weather, the worst sun burn I’ve ever had, and most importantly a serious lack of caffeine-we had the time of our lives. We plan to do it again. 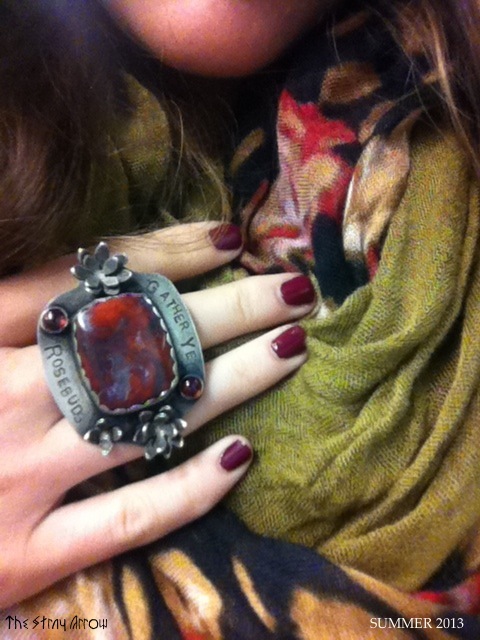 Now I know I missed “Rock Appreciation Day” this month, but don’t worry! I’ll be doing TWO rock/gem types next month on the 1st! 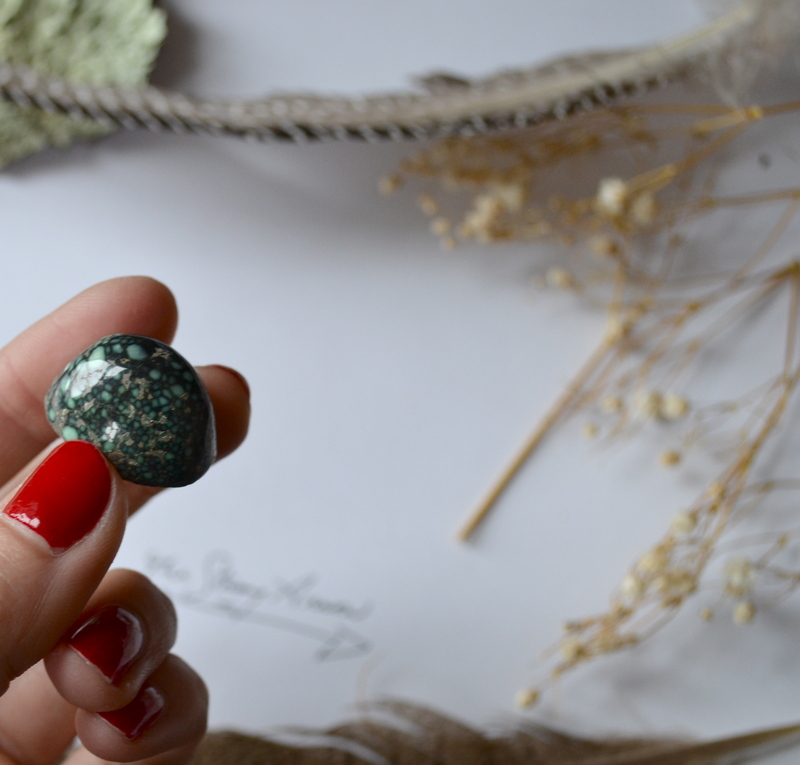 Although I am *not taking* any custom orders for this month, I do have new stones to share! 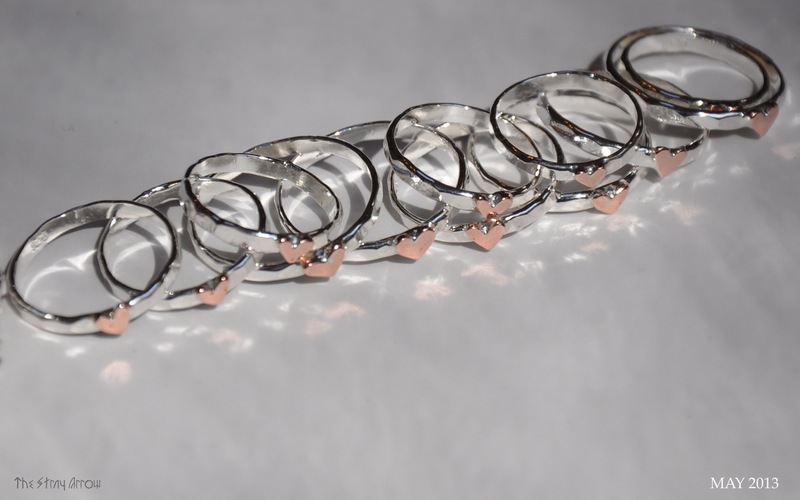 These can be reserved for custom orders which will resume next month. 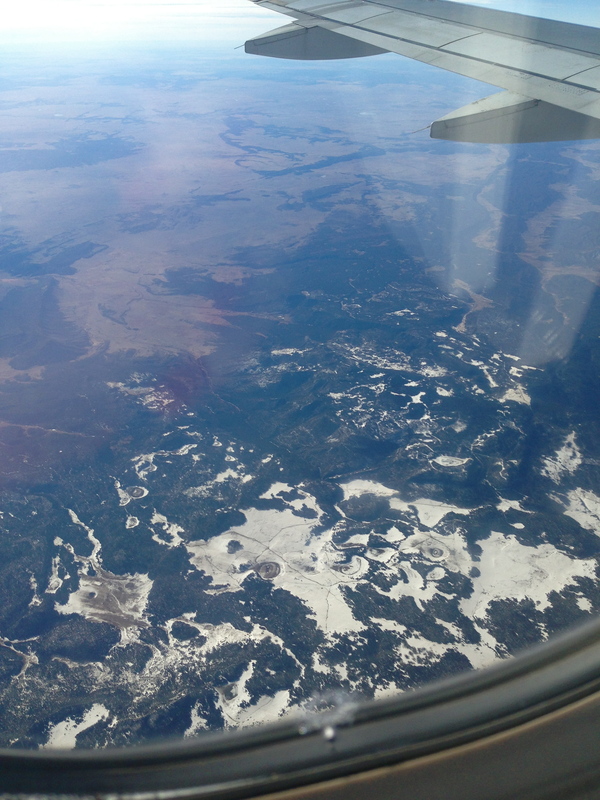 A peek of our travels…. Some new pieces shall emerge by the end of the month inspired by all that is Folk music, mainly old traditional Appalachian Folk ballads. *our night after an ADDITIONAL 4 hours of NYC traffic piled on to my 4 hour drive. *happy feet! A little leaf leaped into my shoe to join in our trek. I left him in there. A very nice gentleman was able to take two seconds of his time for a picture. 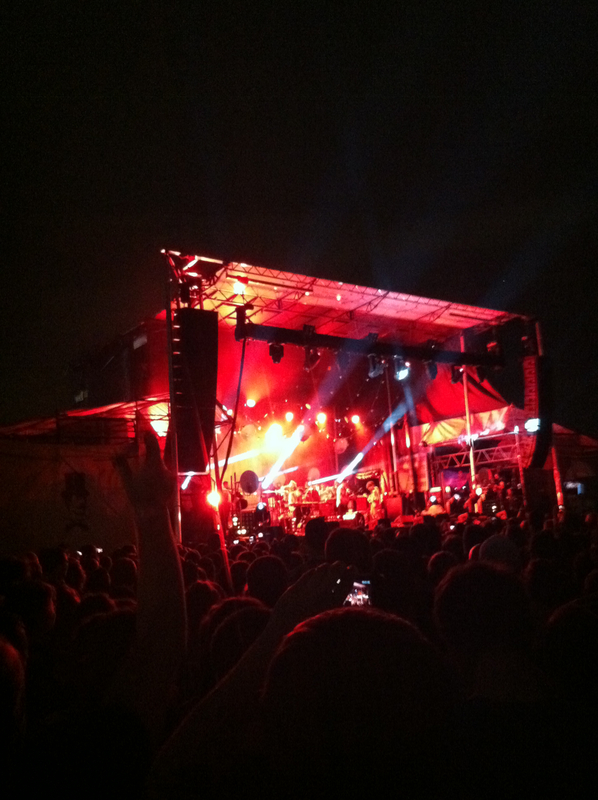 It is my one photo memento of the full week of music my friend and I shared. Everyone we met were exceptional, sweet, generous, and all around great folks. 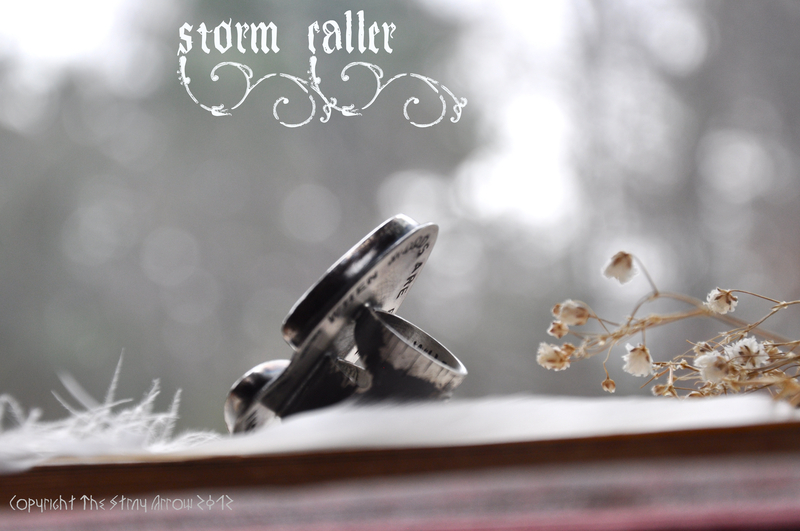 Well I am now back in the studio at full steam! 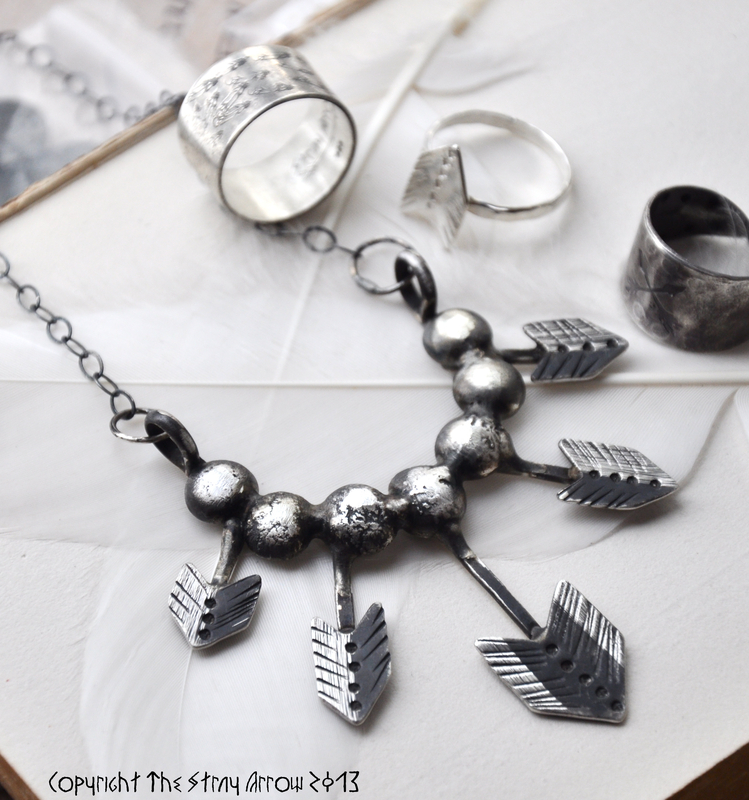 Prepare to see a lot of new pieces in BOTH shops in the near future. I wish you all the great luck bestowed upon my friend and I. [DISCLAIMER: I am not a lapidary (stone) artist, gemologist, mine owner, or any other kind of authority on gems, stones, or minerals. 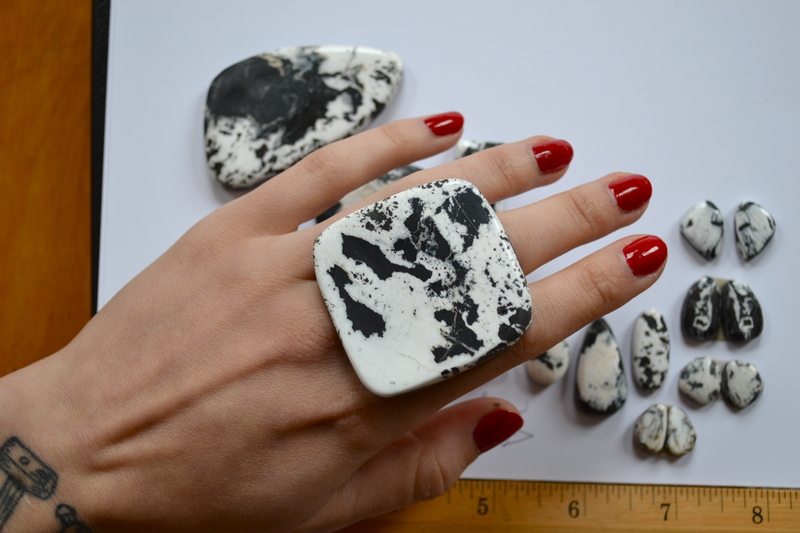 I am simply an enthusiast who likes to share the information I’ve gathered in my goal to attain the perfect rocks for my jewelry pieces]. 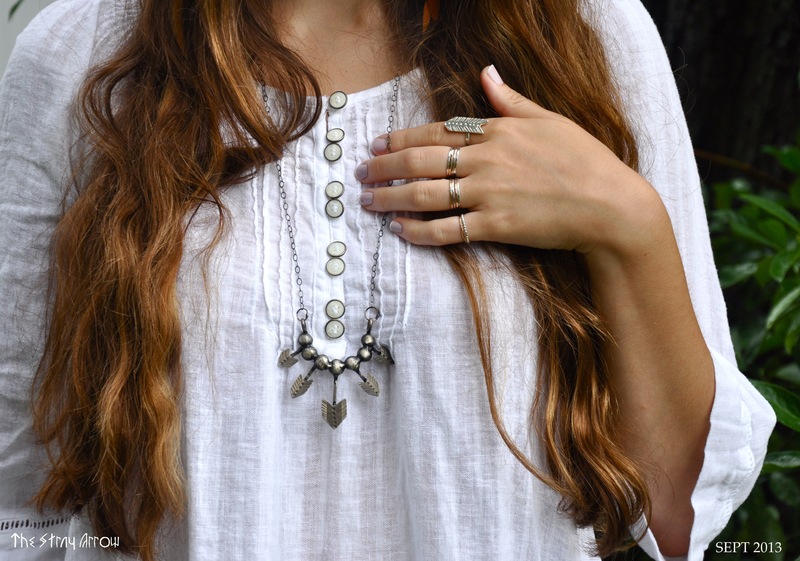 White turquoise is extremely rare and comes from a few different mines, mainly in Nevada and Arizona. 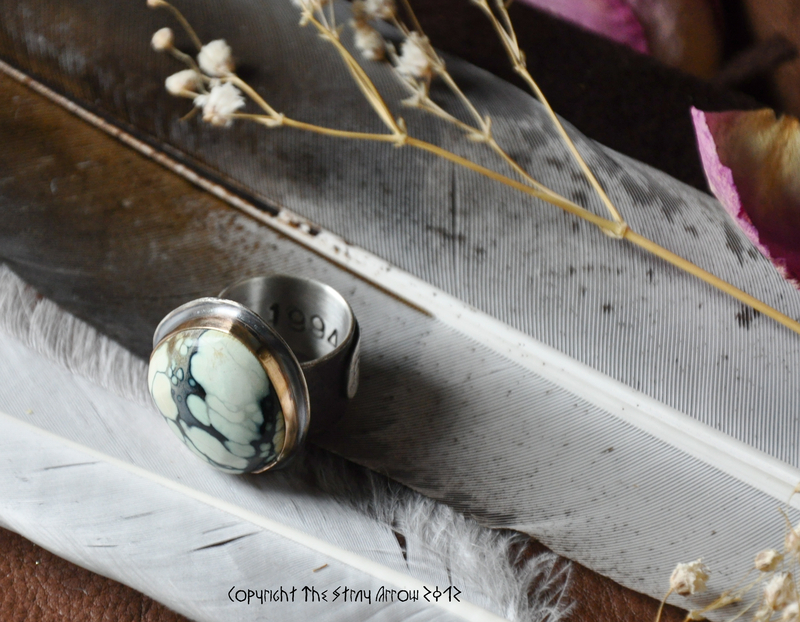 White turquoise is not actually “white”, but can be very VERY lightly coloured turquoise that comes in a variety of hues between the green and blue spectrum. A great example of what is classified as white turquoise can be seen in the Dry Creek Mine (also known as SACRED Buffalo Mine), or the White Stallion Mine. 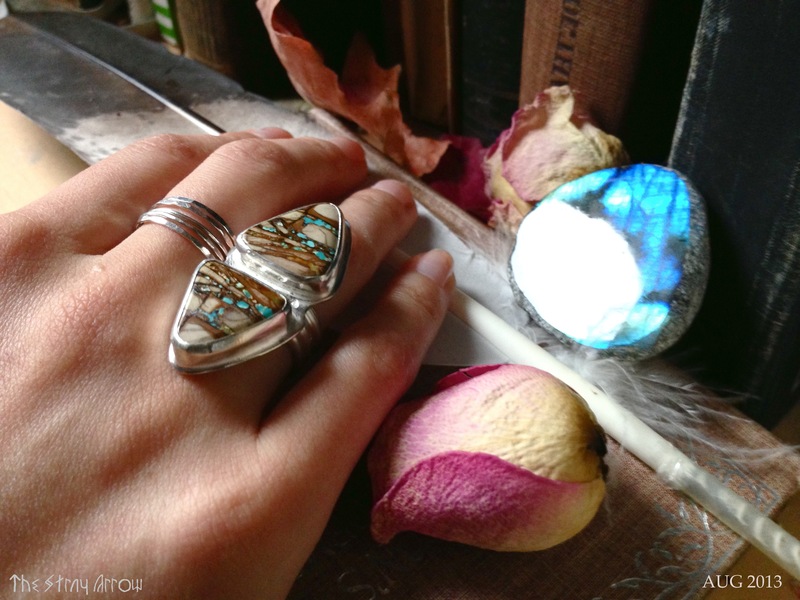 Actual “white” turquoise is so hard to find in quality jewelry because it is very low on the hardness scale and cannot take a good polish because it is so chalky (but it is not chalk turquoise!). 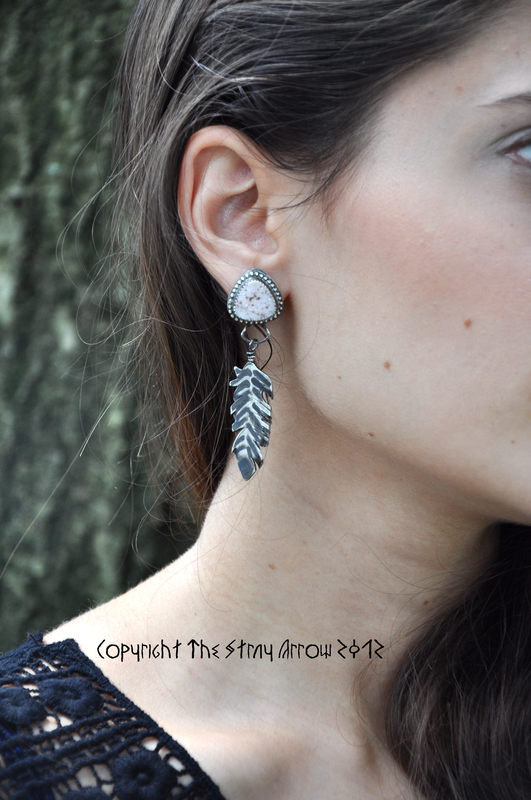 This makes the stone low quality as a rule no matter how rare or beautiful. 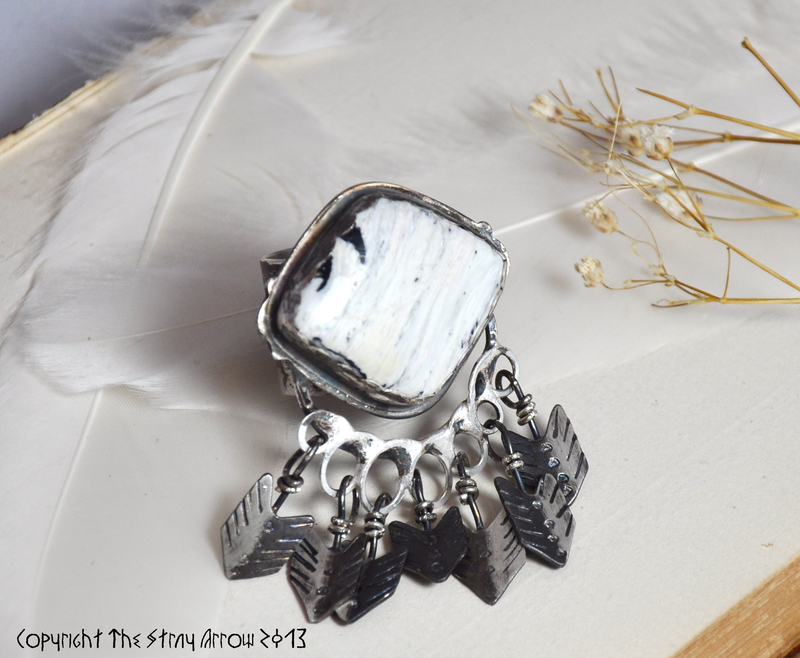 White buffalo turquoise is higher on the hardness scale than any chalk or white turquoise. It takes a great polish and is in actuality WHITE, or off-white due to it’s mix of black chert host rock. 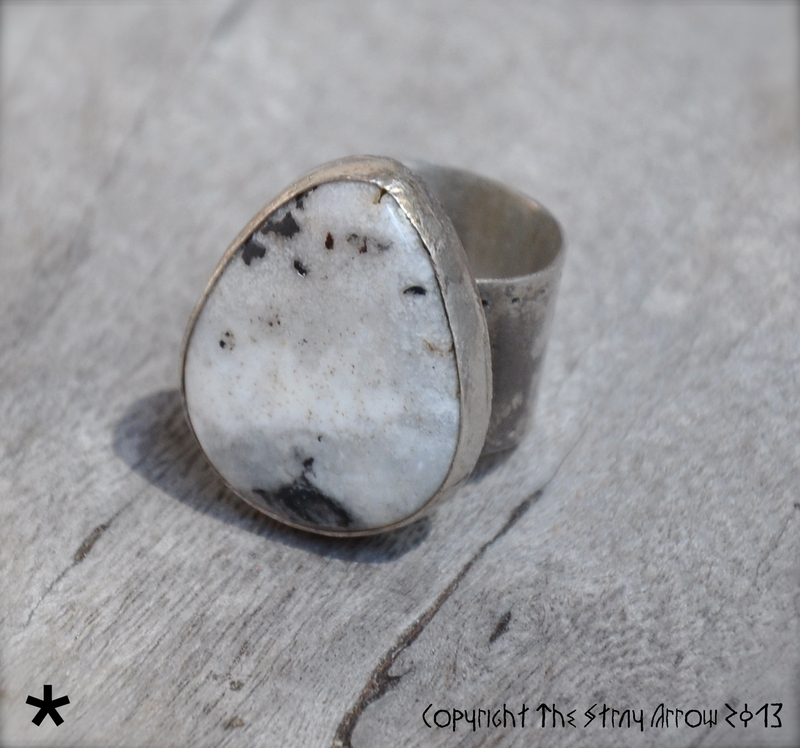 The white buffalo turquoise stone has been tested several times and has BAFFLED gemologists and mineralogists to date. 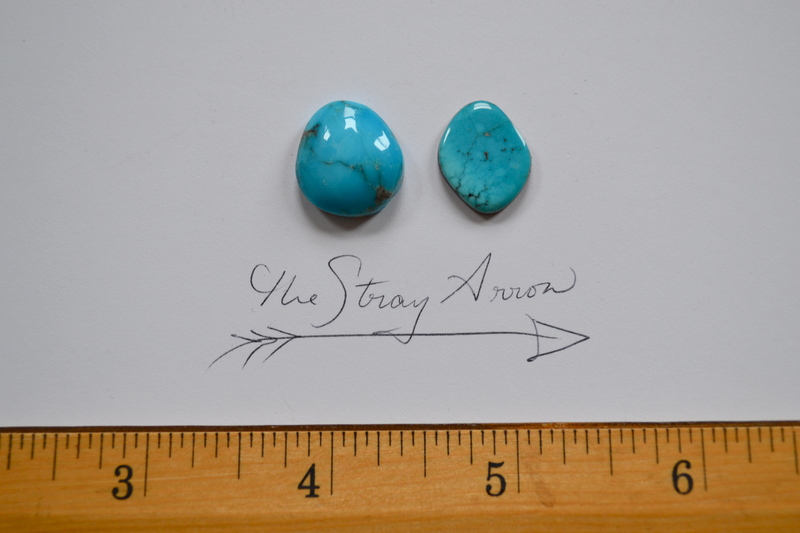 Originally, people thought it was a different stone type other than turquoise. 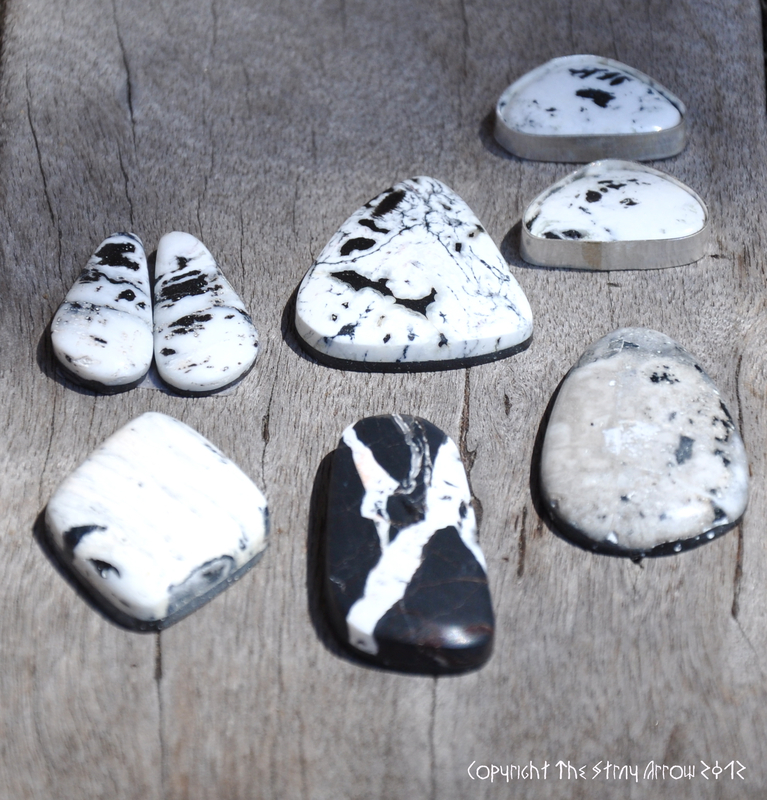 Similar stones are howlite, magnesite, planarite, etc. With each inquiry, each similar type has been dismissed. 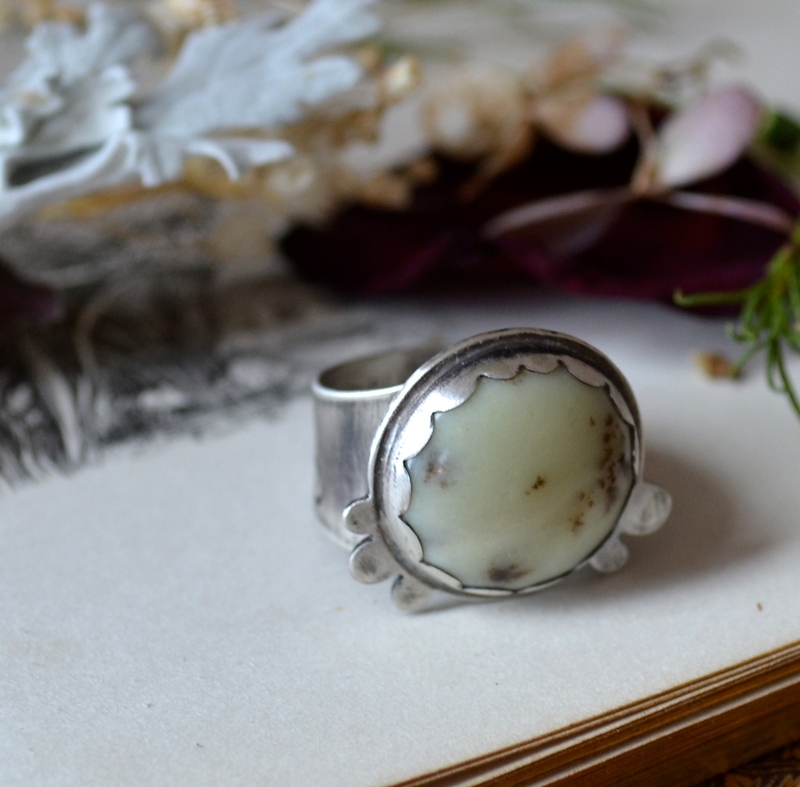 White buffalo turquoise has the same hardness of turquoise, is found in veins when mined like turquoise, and is found is black chert, which is a host rock of…turquoise! 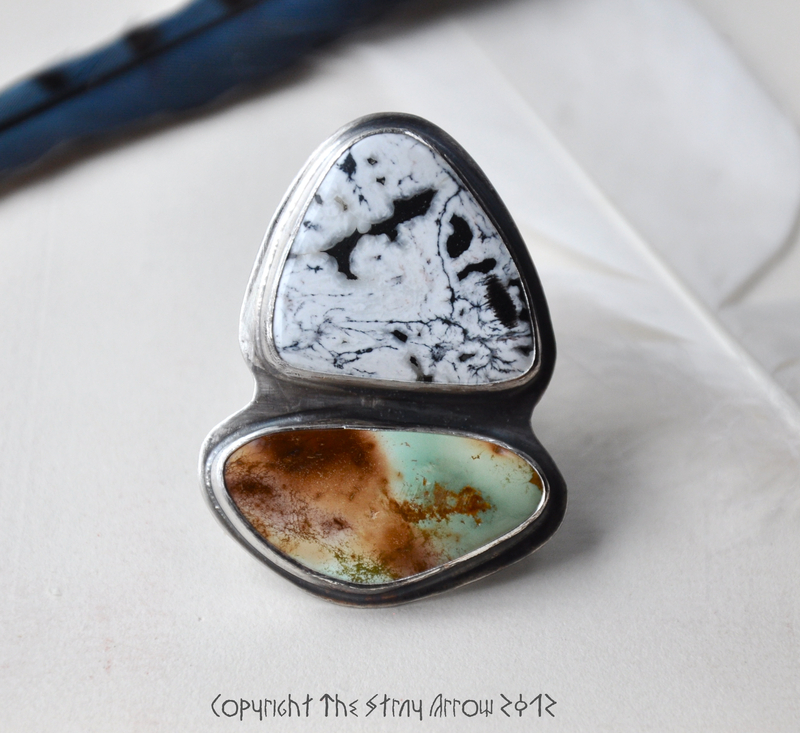 A great theory about the stones from this mine is that it is a kind of “albino” turquoise. 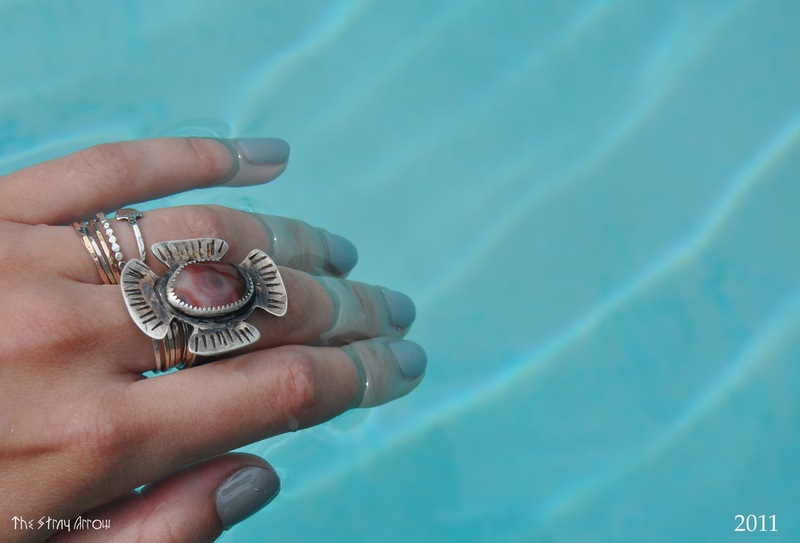 The authenticity of White Buffalo Turquoise is backed by the family who owns the mine; the Otteson’s. The Ottesons own several turquoise mines and have a long history and good reputation mining turquoise in the Southwest. 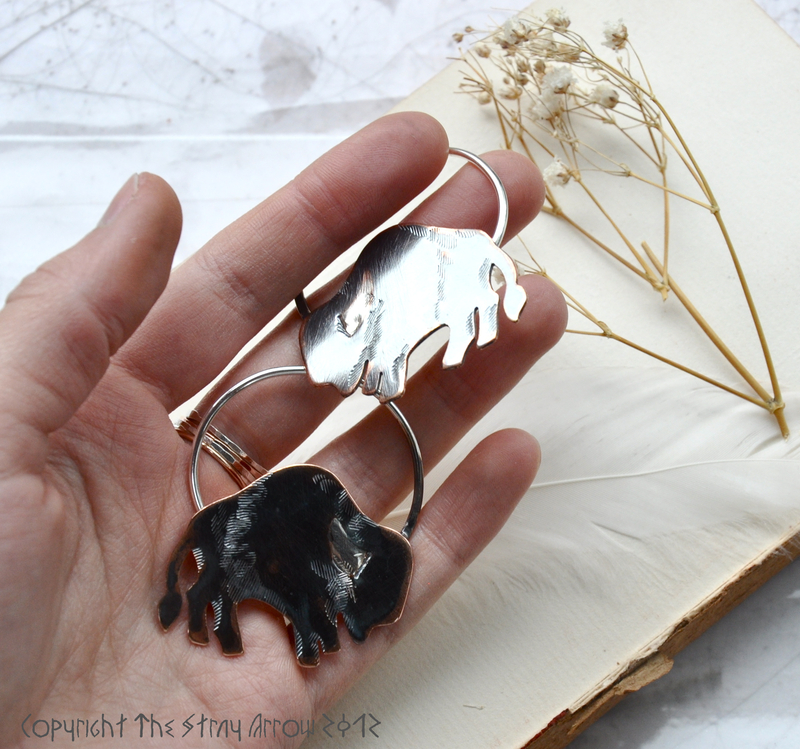 While not always advertising White Buffalo Turquoise as “White Turquoise”-because, let’s face it, it really isn’t-they still call it White Buffalo or White Buffalo Turquoise. 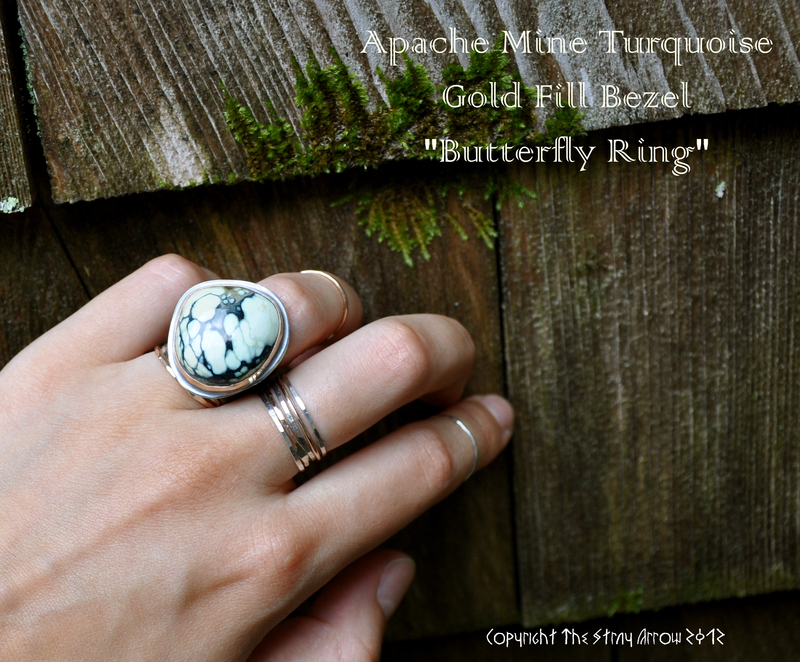 For all consumer and market purposes, the material is called “White Buffalo Turquoise”. 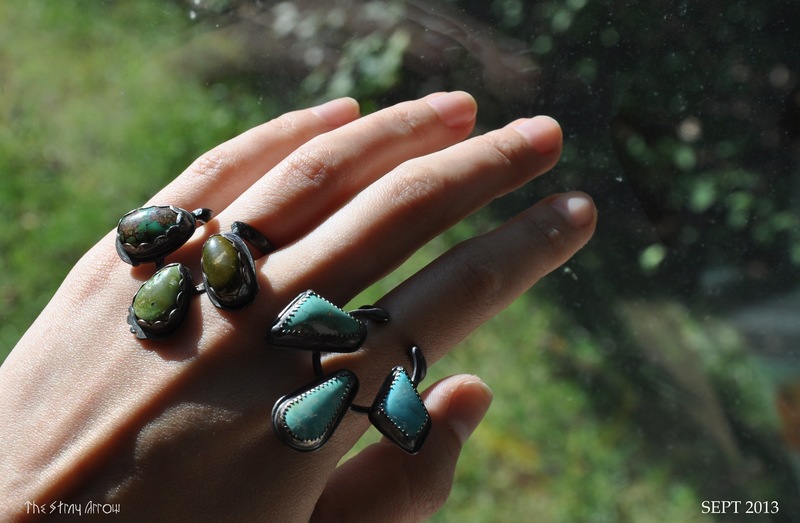 Personally, after looking at oodles of stones online and in person, there has never been a doubt in mind as to whether the stone is turquoise or not. I call it turquoise. 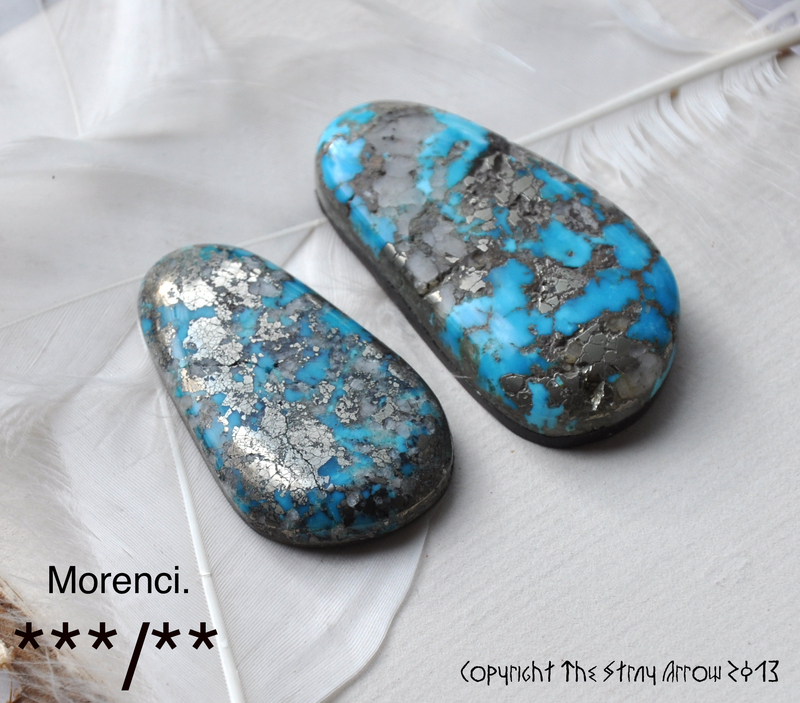 Boulder or ribbon cut turquoise is just a different way of saying ‘turquoise within a host rock’. Often you can find lovely patterns of turquoise veining within the host rock, or just large streams of turquoise running through. 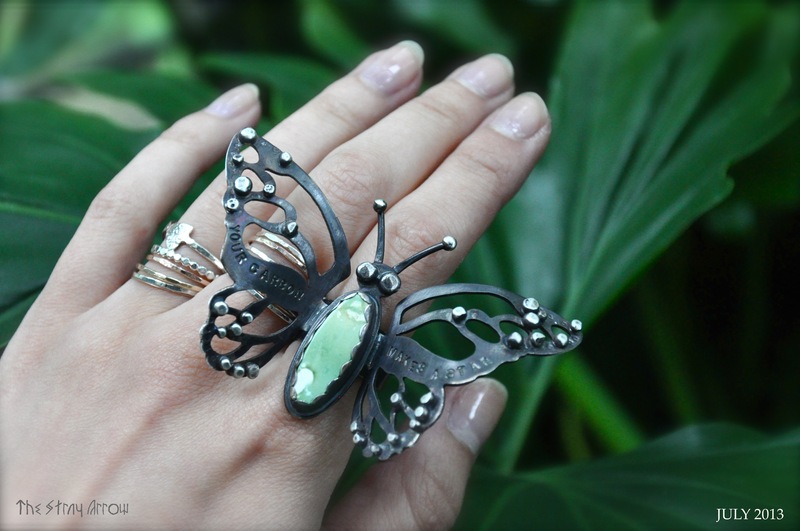 These nature made designs are beautiful and just as rare as stones containing a higher turquoise to host rock ratio. 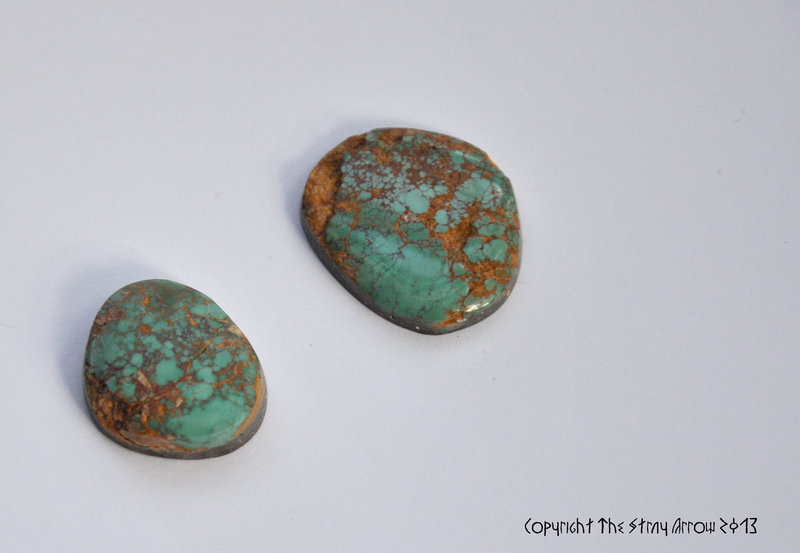 All of those similar stone types to turquoise are often marketed as such! 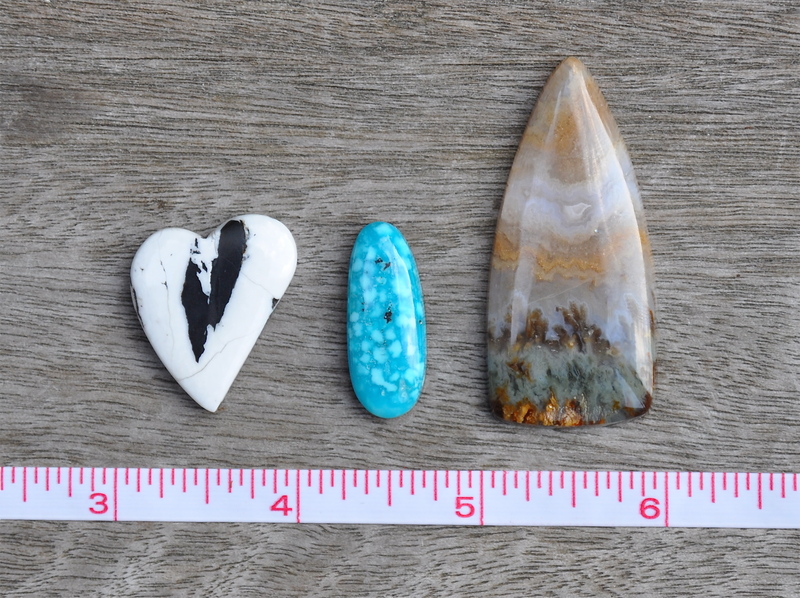 Low quality stones like white howlite, or magnesite, can be marketed as “white turquoise”. 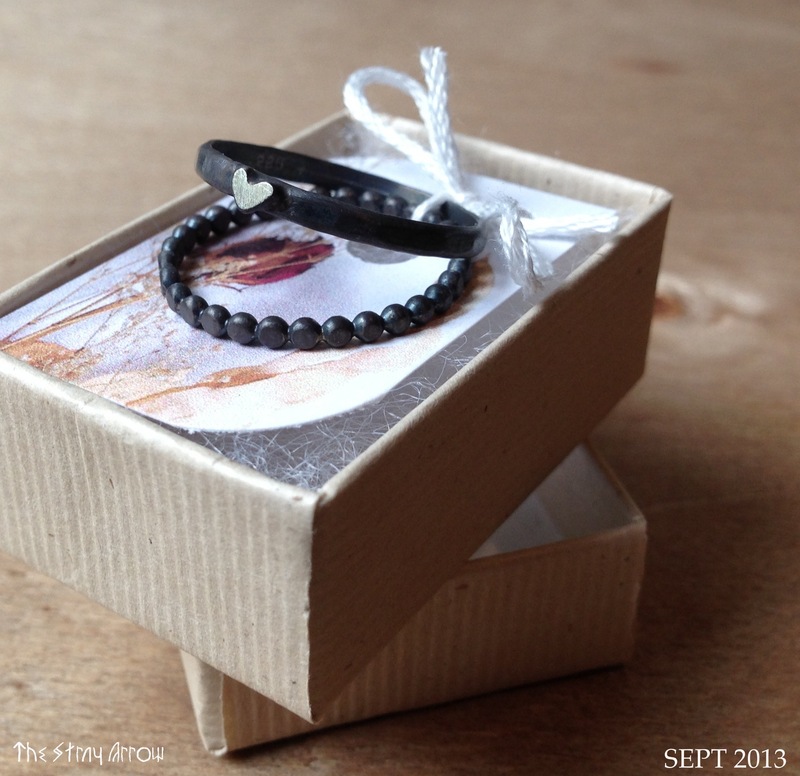 If a price is cheap, that means the materials are cheap! 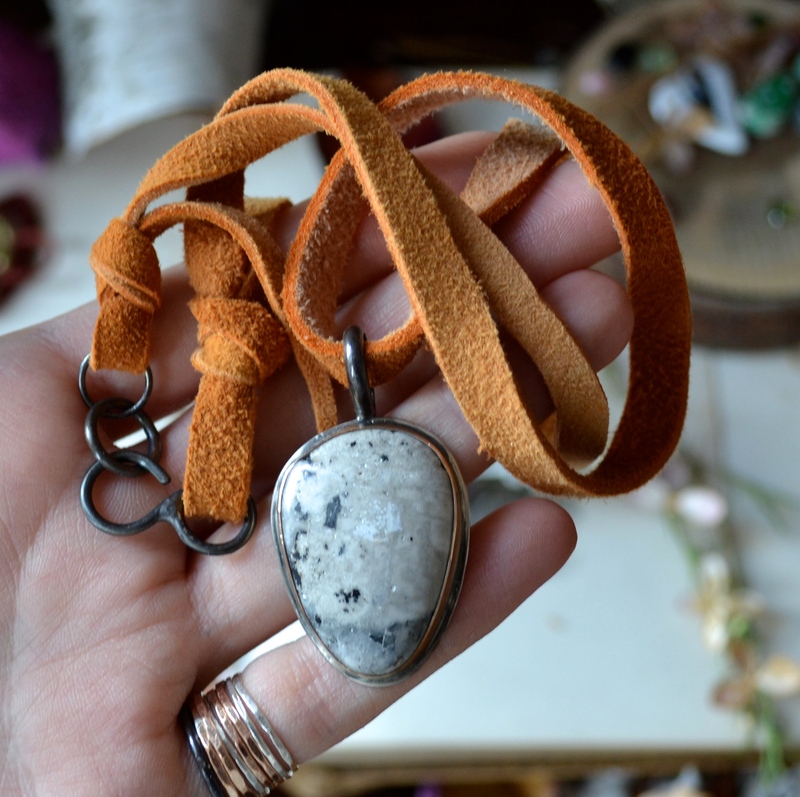 Magnesite often comes in dark to light brown colours with a cream to off-white matrix (think of the beautiful, rare, and valuable Wild Horse Magnesite stone). 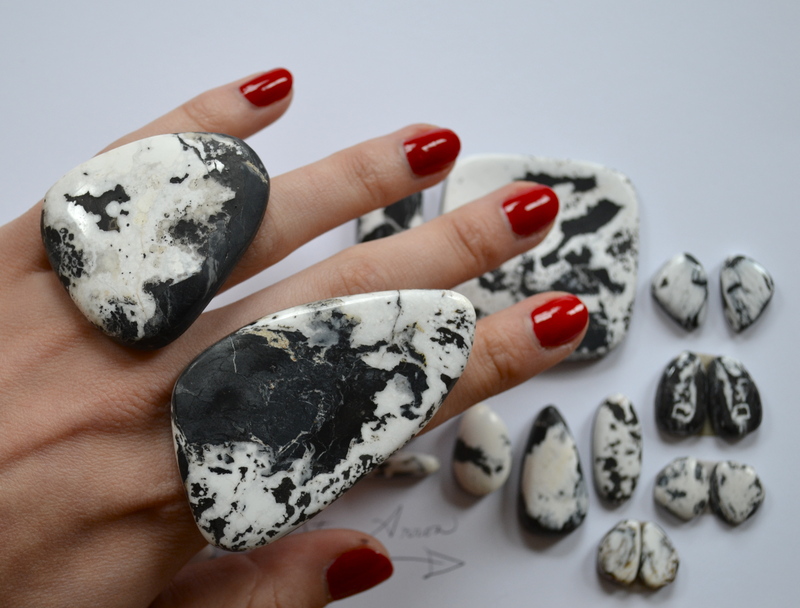 White howlite is often a dull white colour with veins of a dark grey matrix. These veins are thin and milky. 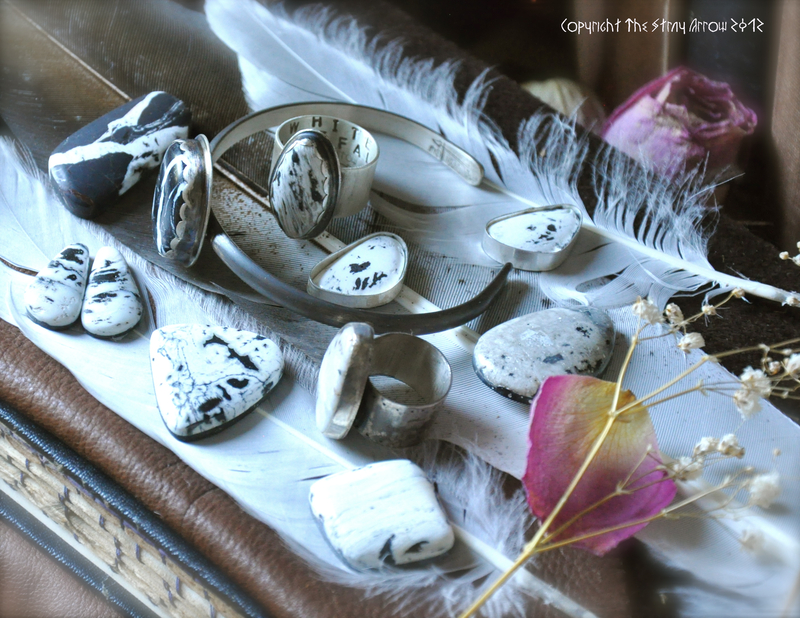 Although the matrix in real White Buffalo Turquoise can get blurry, it is still BLACK, and the colour has a higher saturation and hardness. 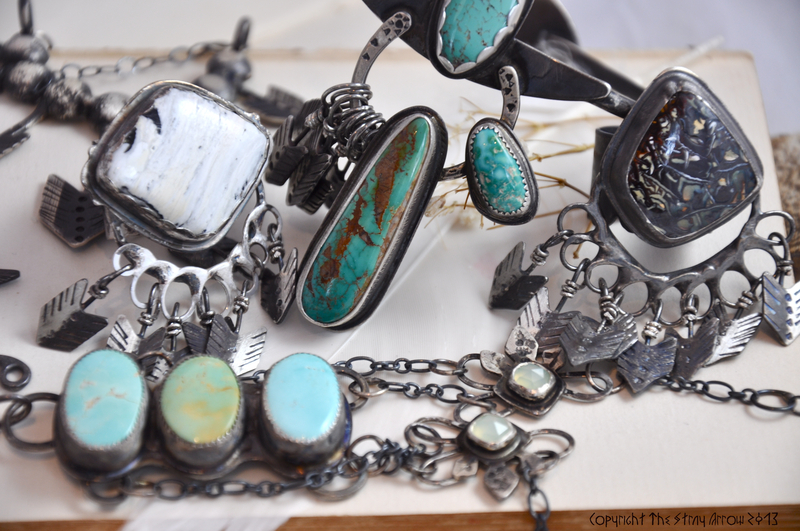 All of the white buffalo turquoise I use is 100% genuine and authentic. I get it from a source in Nevada (not telling!) and I back it all of the way. Check back the First of every month for a new Rock Appreciation Day! If you have questions about my sources, just ask. Have a request for a specific stone or mine? Any input or questions on this issue? Comment below!